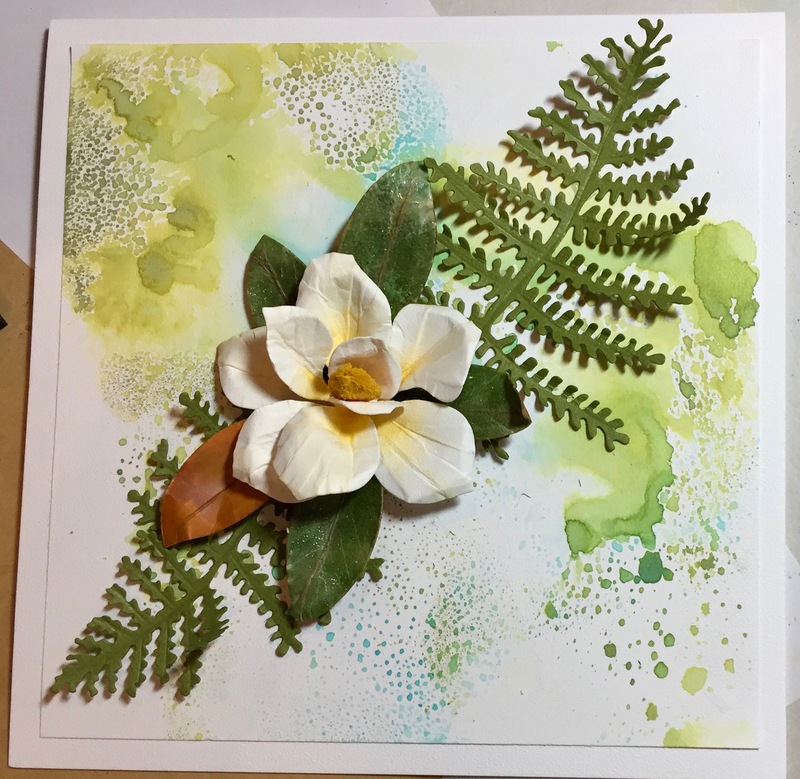 The Southern Magnolia is a tree native to the southeastern United States; from North Carolina to central Florida, and west to eastern Texas and Oklahoma. 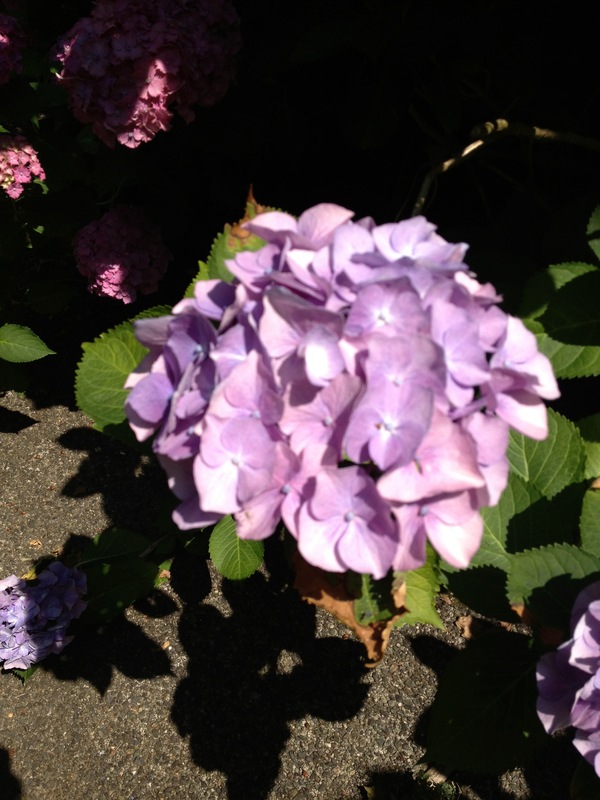 It can grow to 50 feet tall and rarely, up to 100 feet! 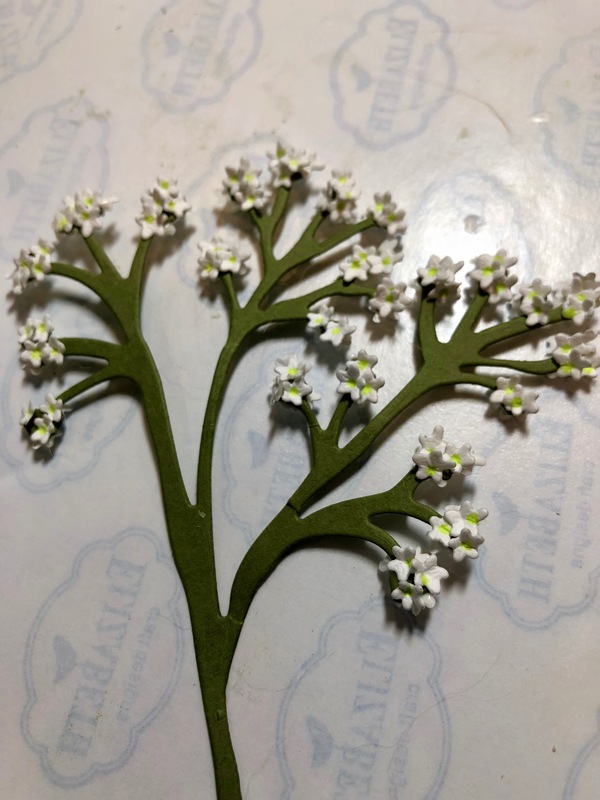 It’s dark green leaves with a caramel-colored underside are striking against the white, fragrant flowers. 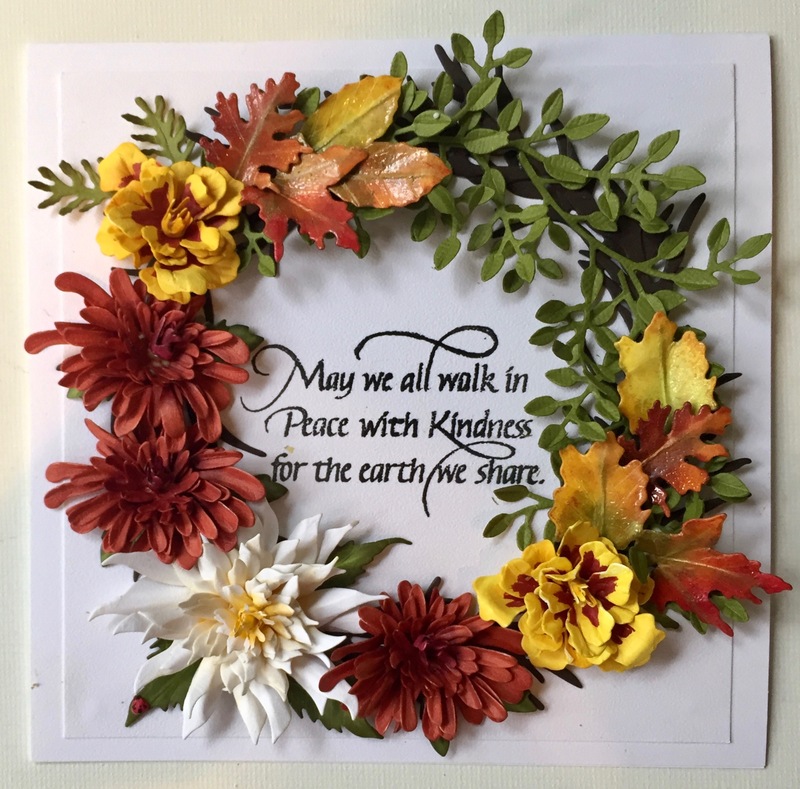 Recently, I was asked to “step-out” this beautiful flower for one of my viewers on FaceBook/Susan’s Garden Club. 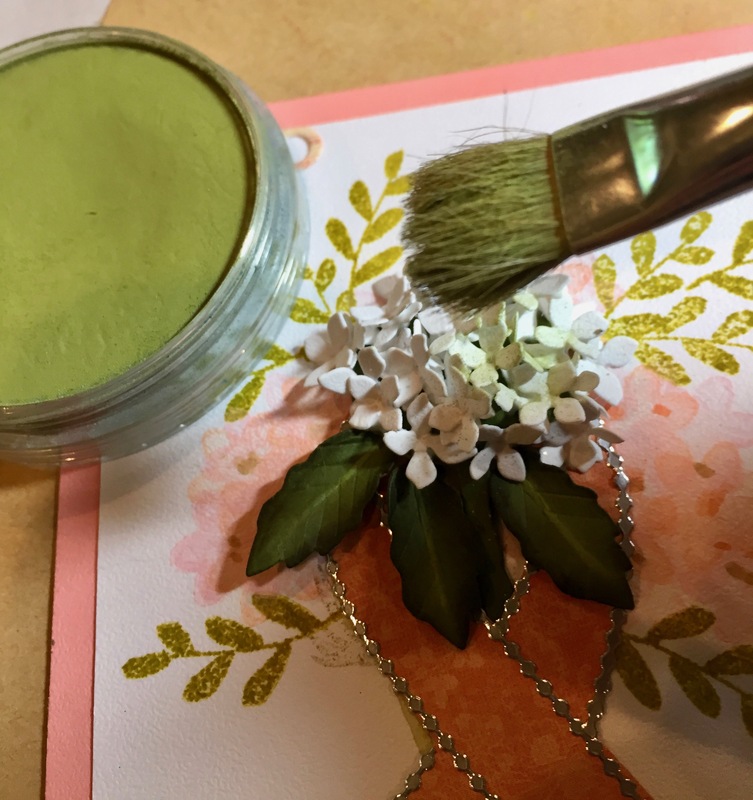 I know you’ll love adding it to your bouquets! 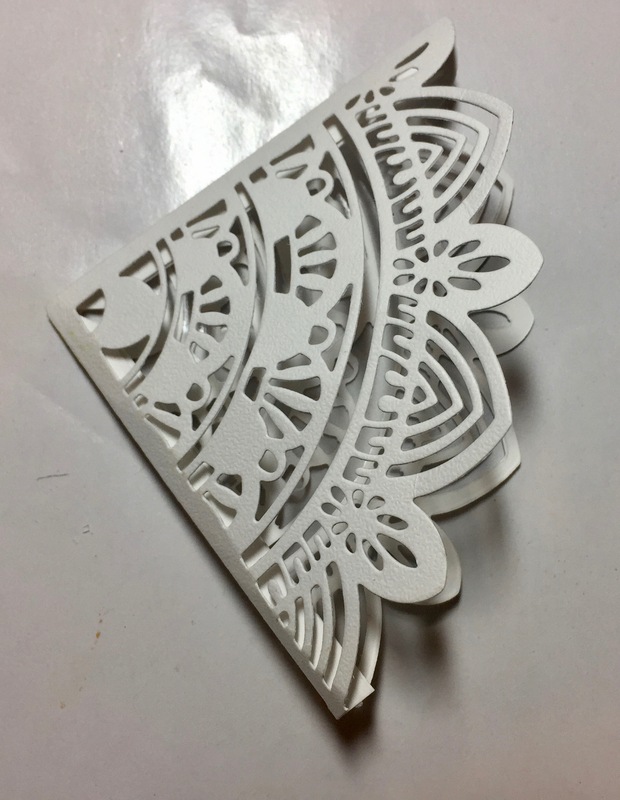 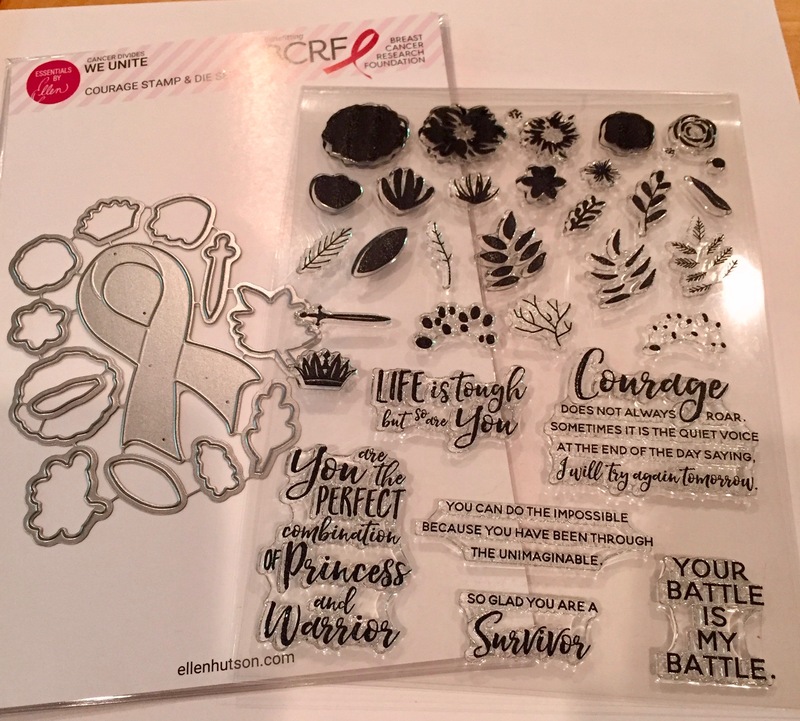 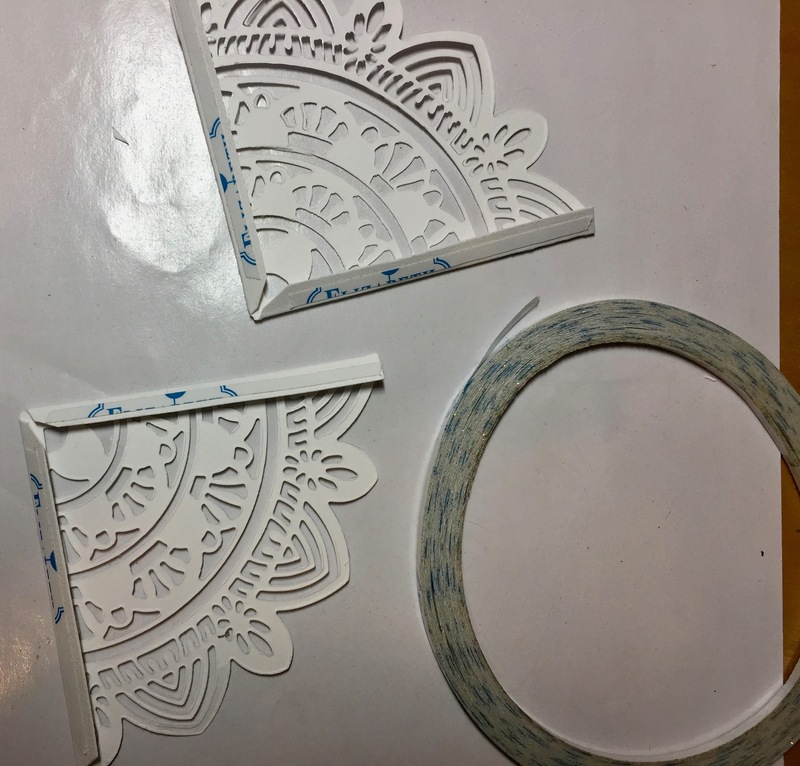 I use Soft Finish White 100 lb./270g cardstock to die cut one of each of the petal sections, two centers, and Soft Finish White 85 lb./230g cardstock to cut 3-5 leaves. 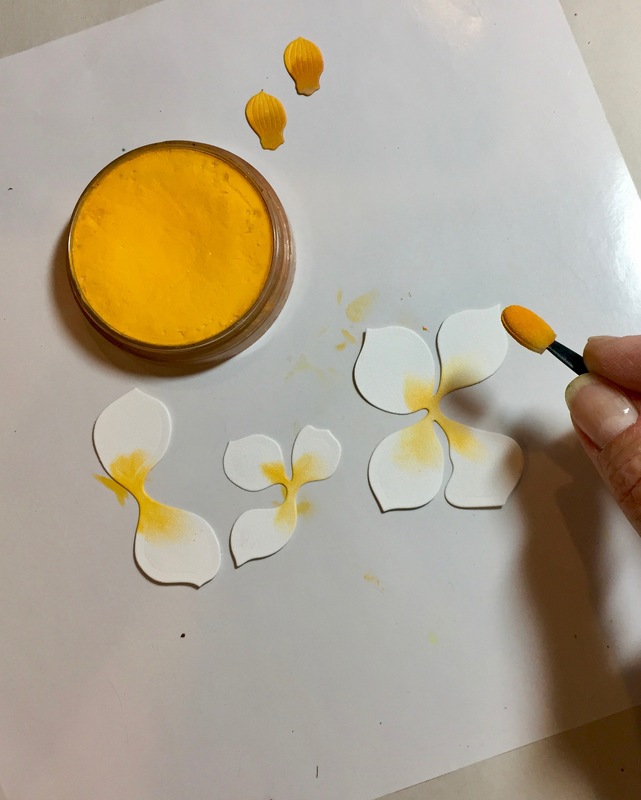 Use PanPastel/Diarylide Yellow to shade the centers of the petal pieces. 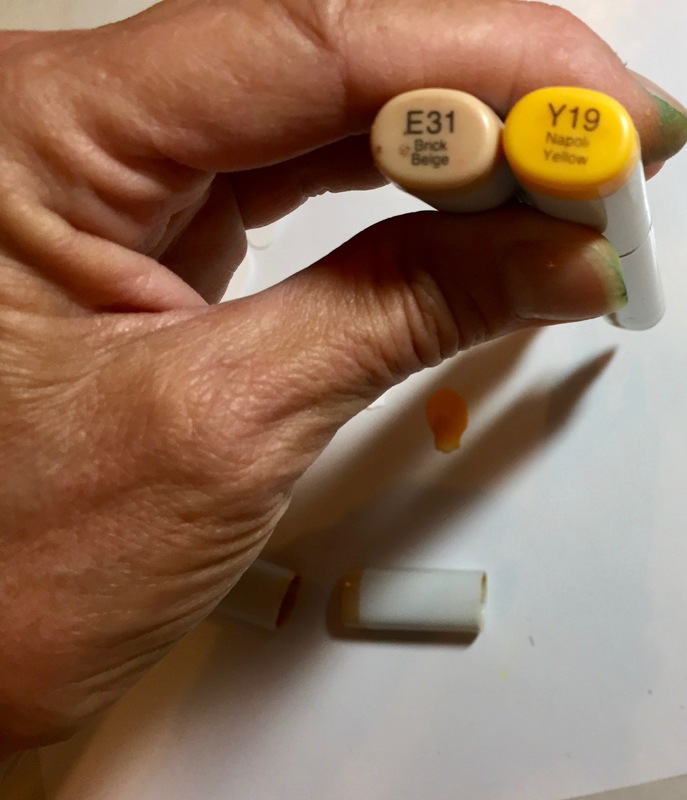 Use Copic Markers (Y19 & E31) to color the centers. 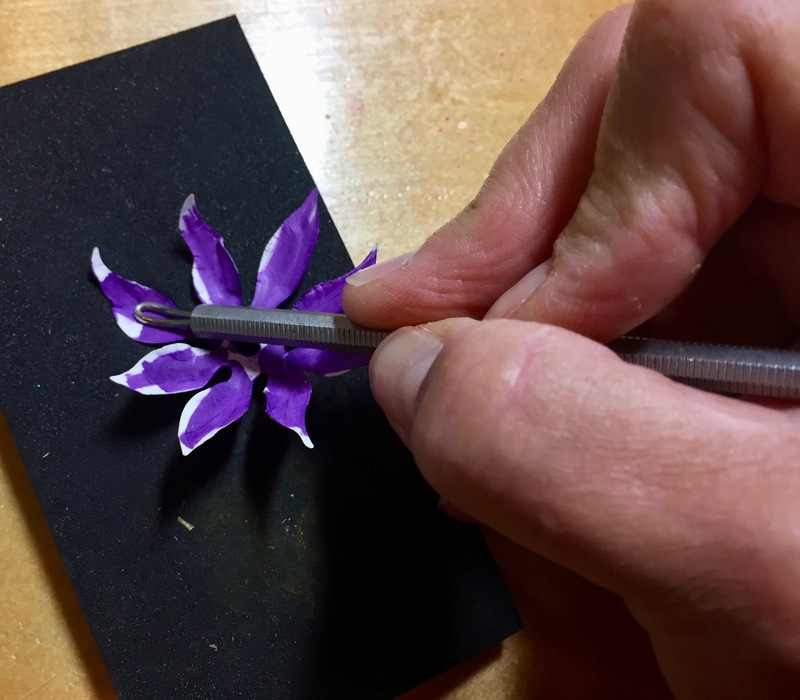 Place the larger 4-petal piece on the MoldingPad and use the Large Loop Tool or the Medium Ball Stylus to shape the petals. 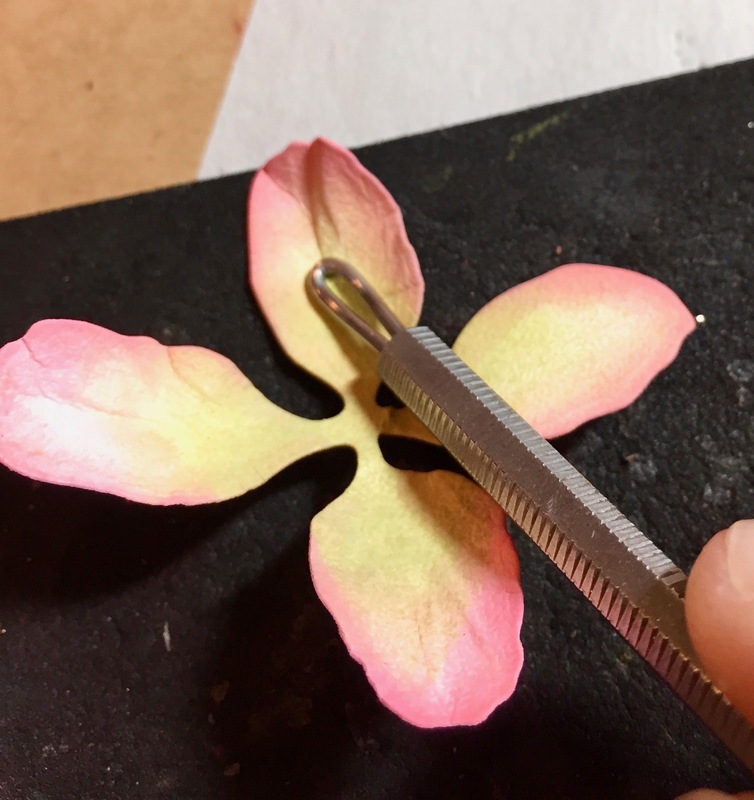 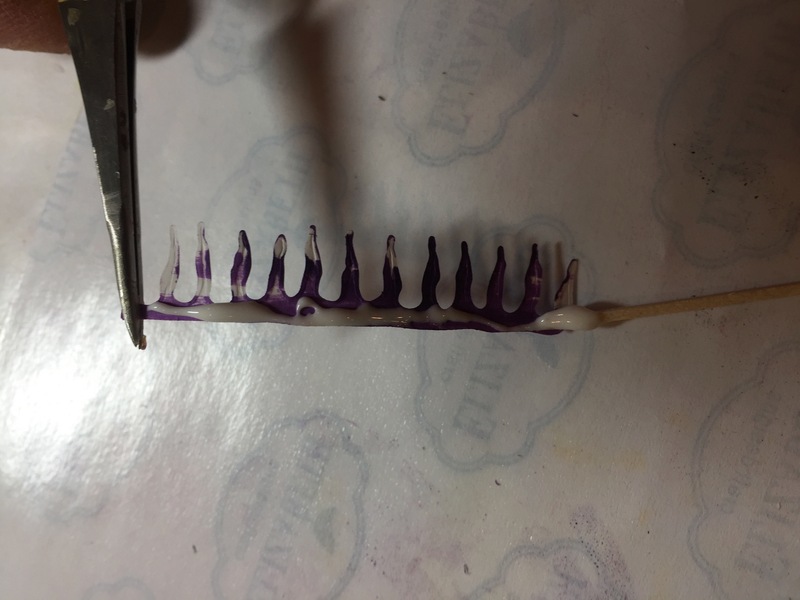 Next, use the tweezers to pinch the stem ends, transfer this pinch to your opposite thumb and index finger to hold it while you use the tweezers to bend down the outer edges of the petals. 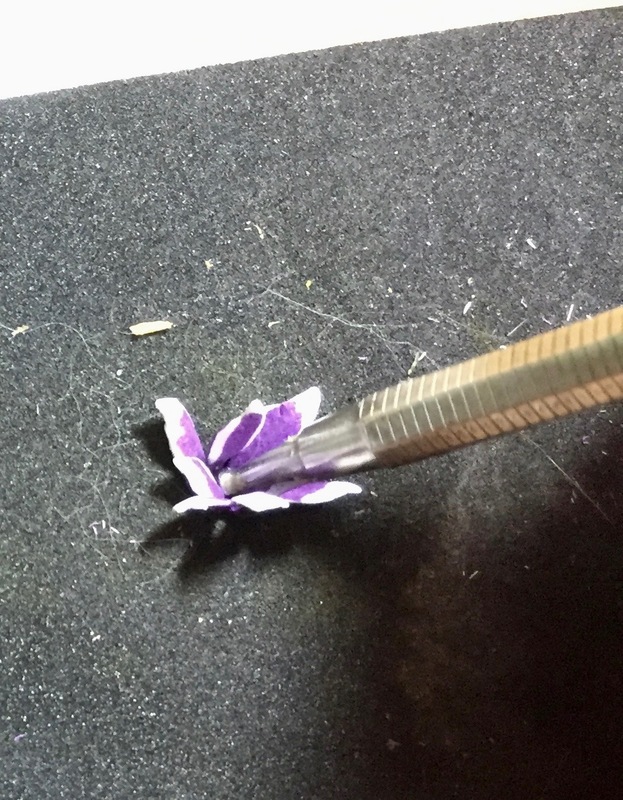 Place the 4-petal piece back on the Molding Pad and use the small ball stylus to cup the center. 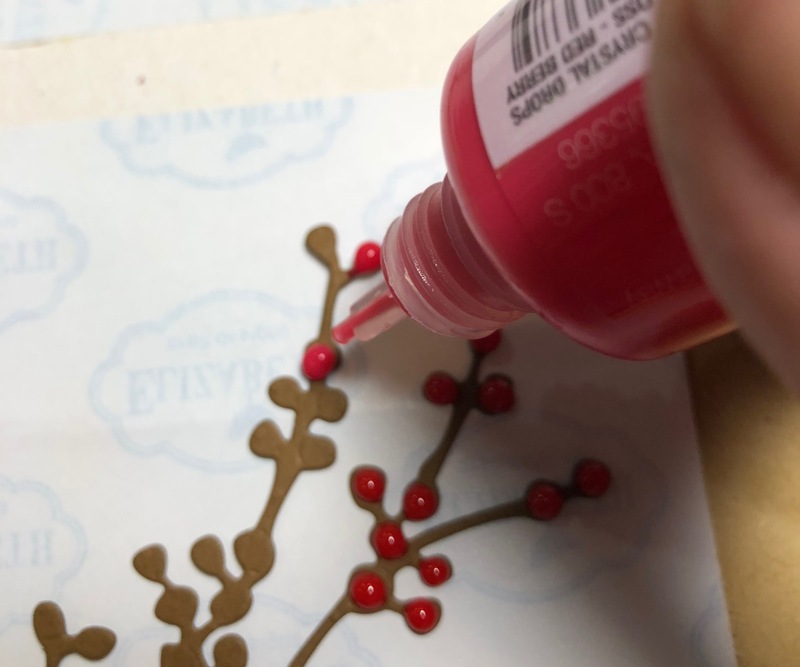 Use a toothpick to add a small amount of glue underneath and adhere it to your card. 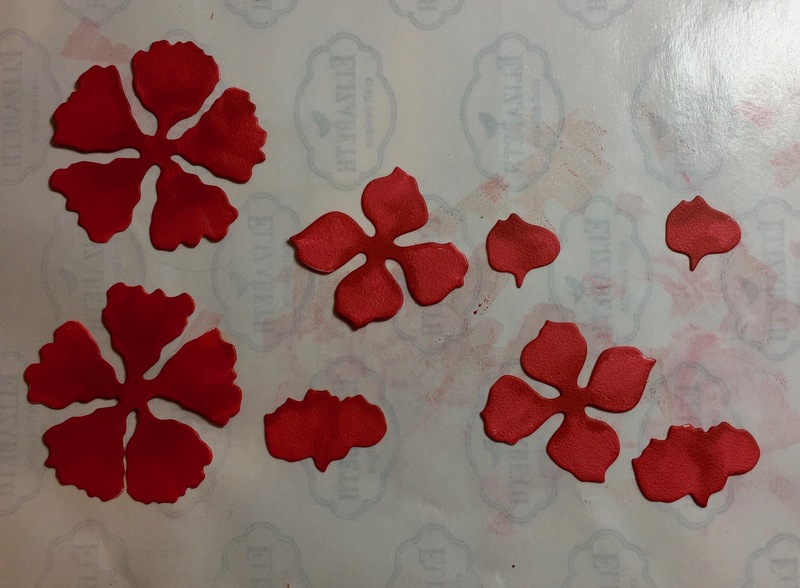 Repeat these steps for the other two petal pieces. 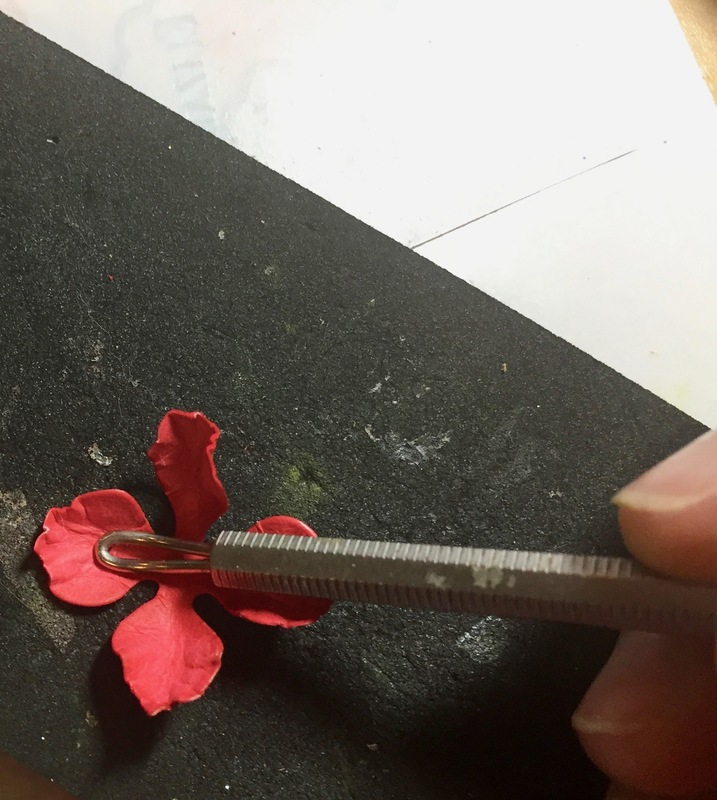 Build the flower, off-setting the petal pieces as shown. 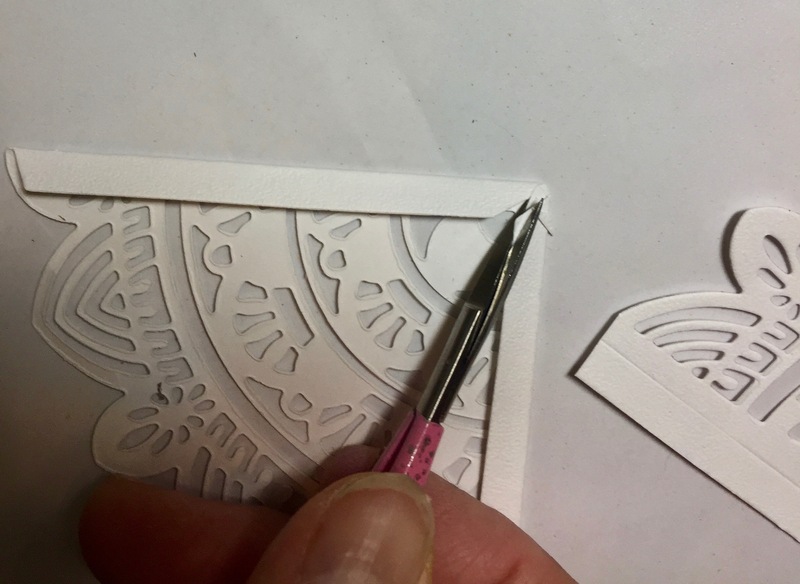 The center is done by placing both pieces, wrong side down, on the Molding Pad and using the Small Loop Tool, shape them. 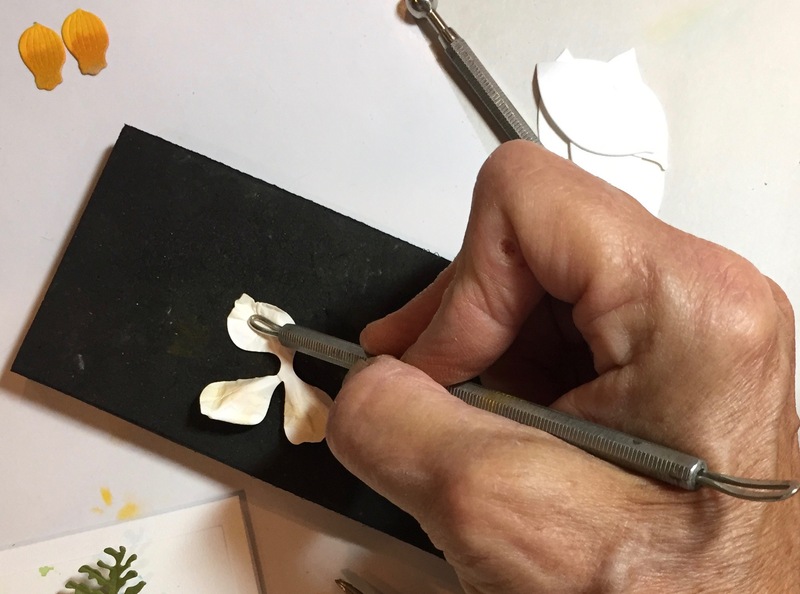 Use a toothpick to apply glue around the edges of one of the shapes only as shown and adhere the two pieces together, forming a dimensional ovoid piece. 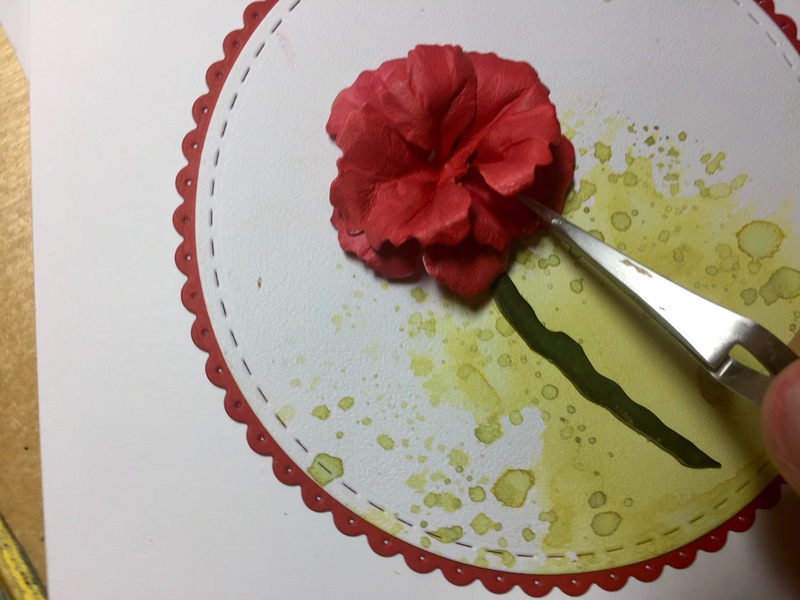 Lightly apply a small amount of glue to this center piece and sprinkle some Pollen over it. 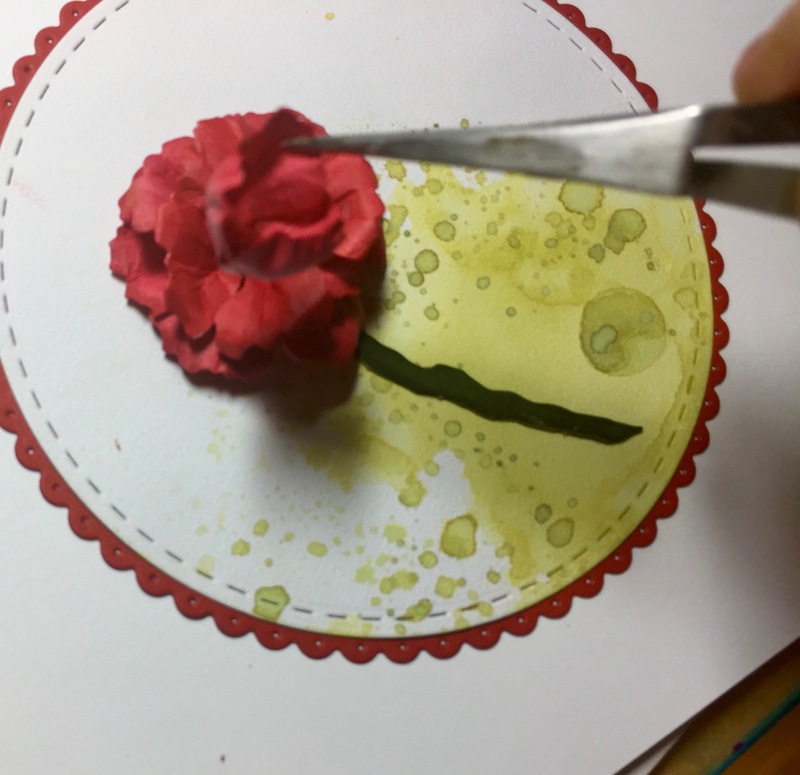 Dip the bottom into the glue and place it in the center of the flower. 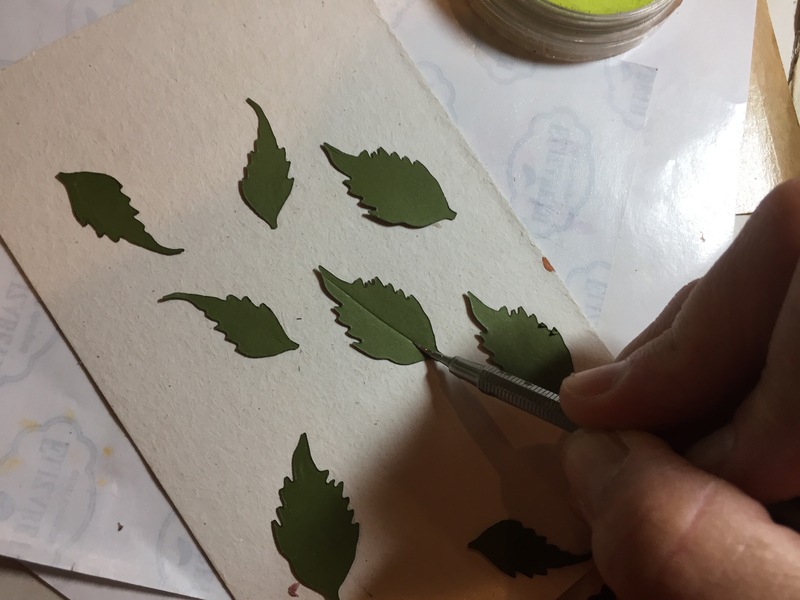 I’ve colored the leaves with a combination of Copic Markers and PanPastels, but you could also use a dark green cardstock if you prefer. 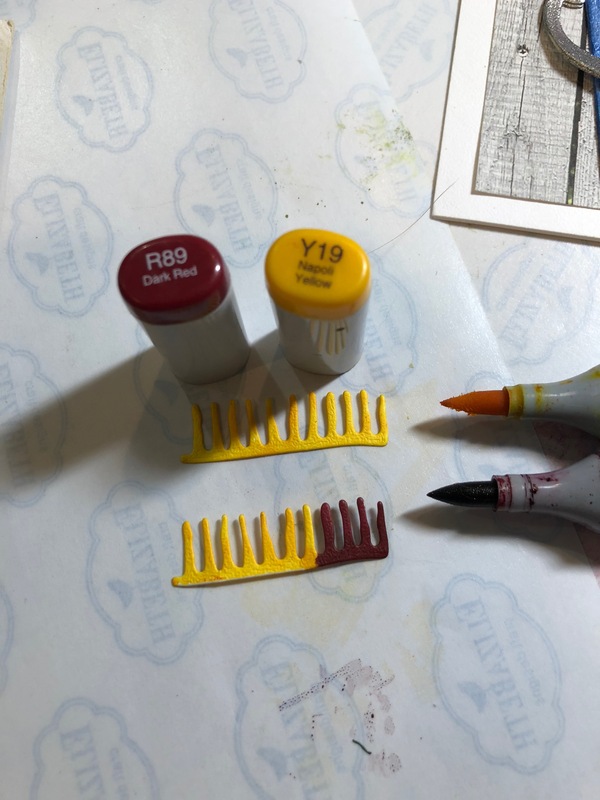 If you do, still color the underside with the PanPastel/Orange Shade. 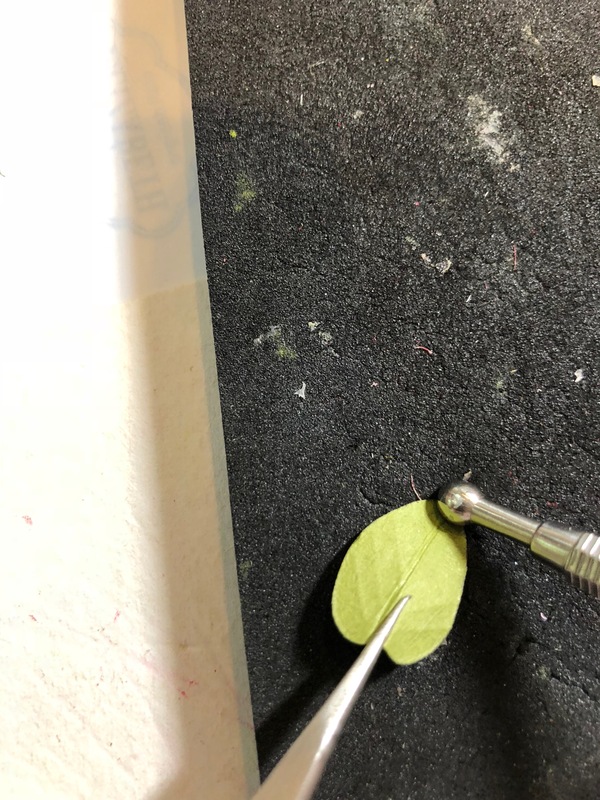 I used Copic Markers (G99, G94 & G85) on the right side of the leaf, then dipped it into VersaMark and embossed it with Clear, Fine Embossing Powder. 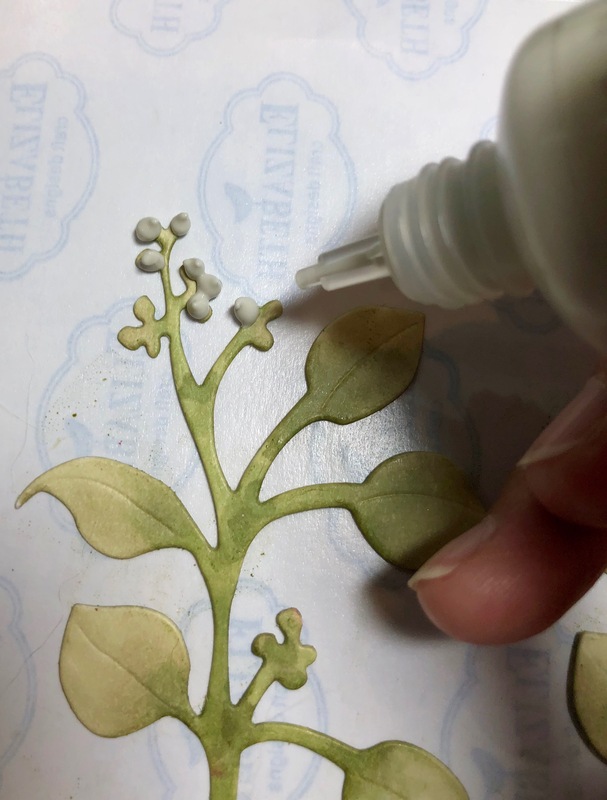 Next, I color the underside of the leaf, first with Copic Marker E99 and then used PanPastel/Orange Shade to color over the marker. 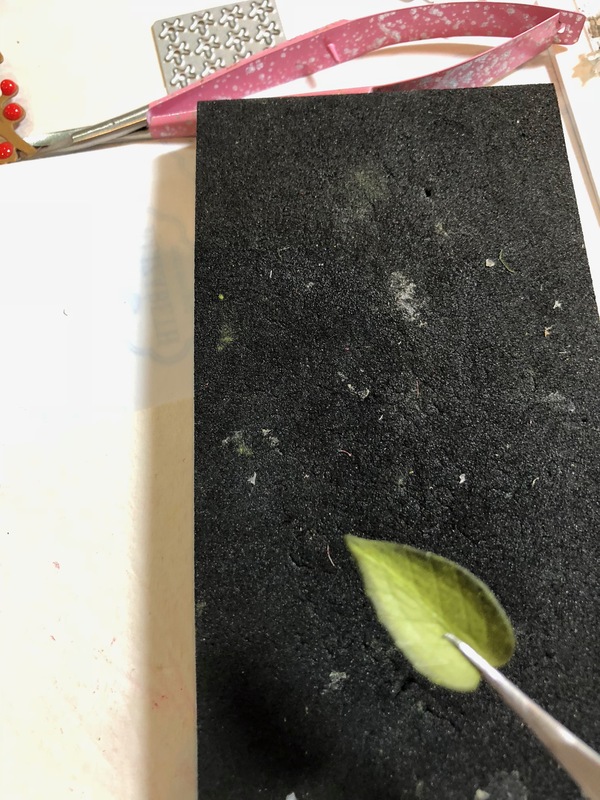 This step gives it the “suede” look that these leaves have. 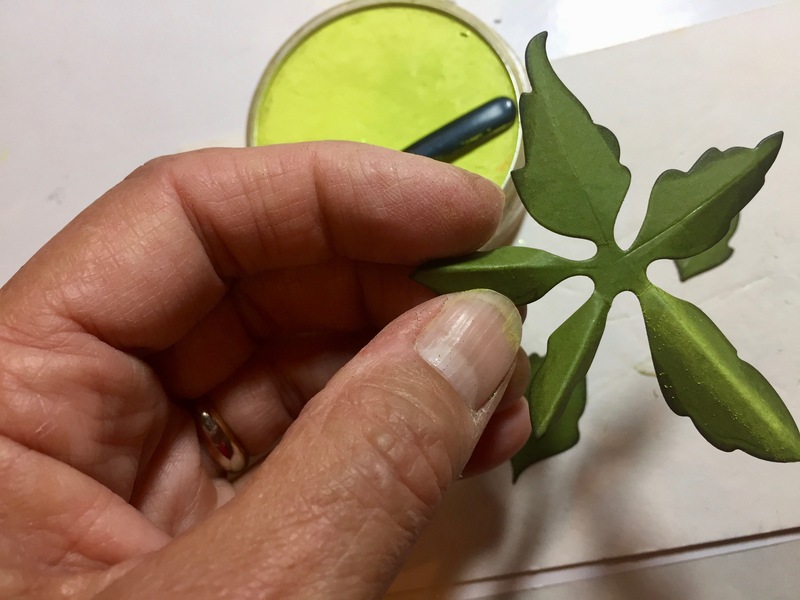 Now, place the leaf, right side down, on the Leaf Pad and use the Leaf Tool to score a stem line down the center. 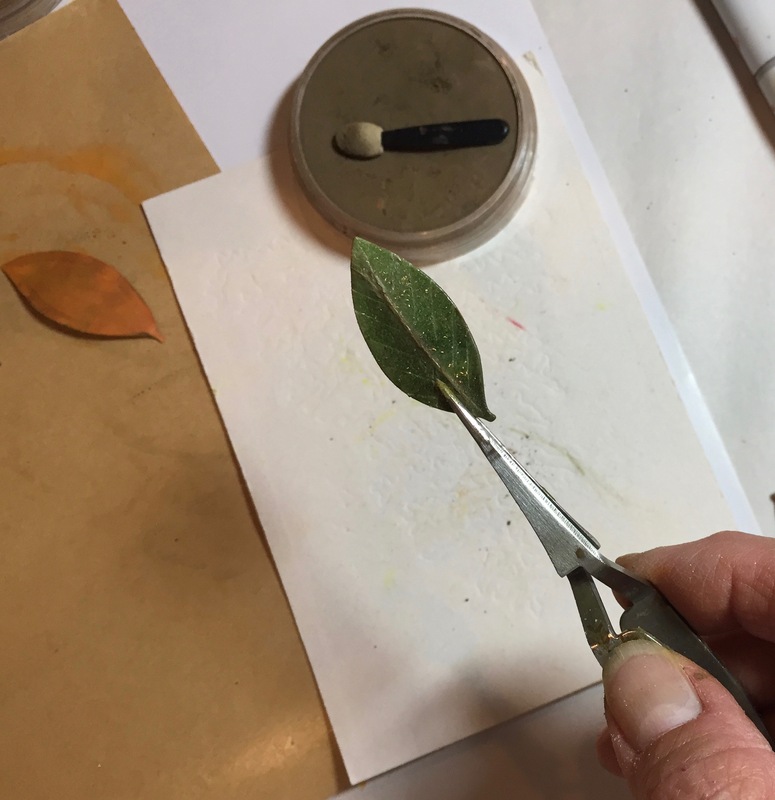 Bend up the the leaf, wrong side first, and shade with PanPastel/Raw Umber, then bend up the leaf, right side up, and shade the stem line on this side. 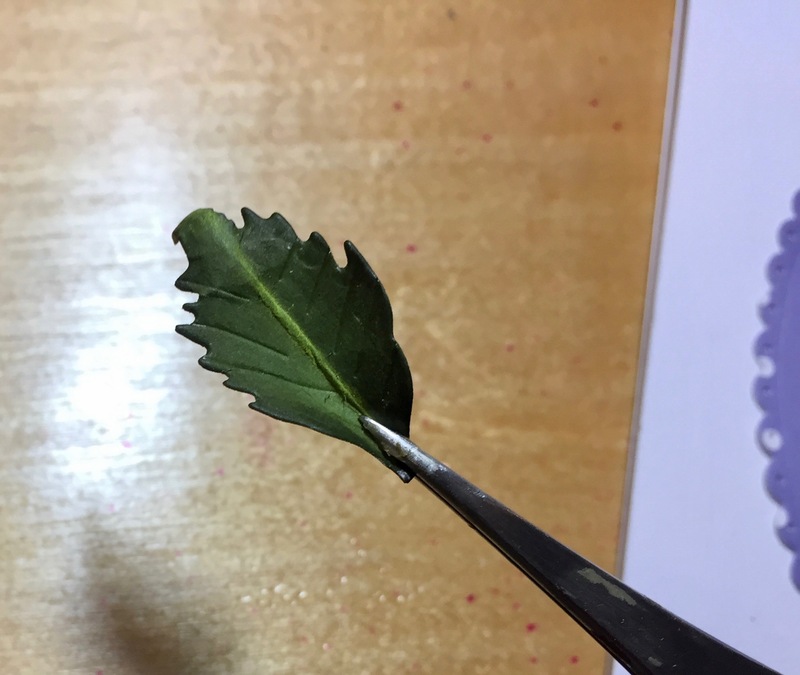 Place back on the Leaf Pad and use the Leaf Tool to add vein lines out from the stem line. 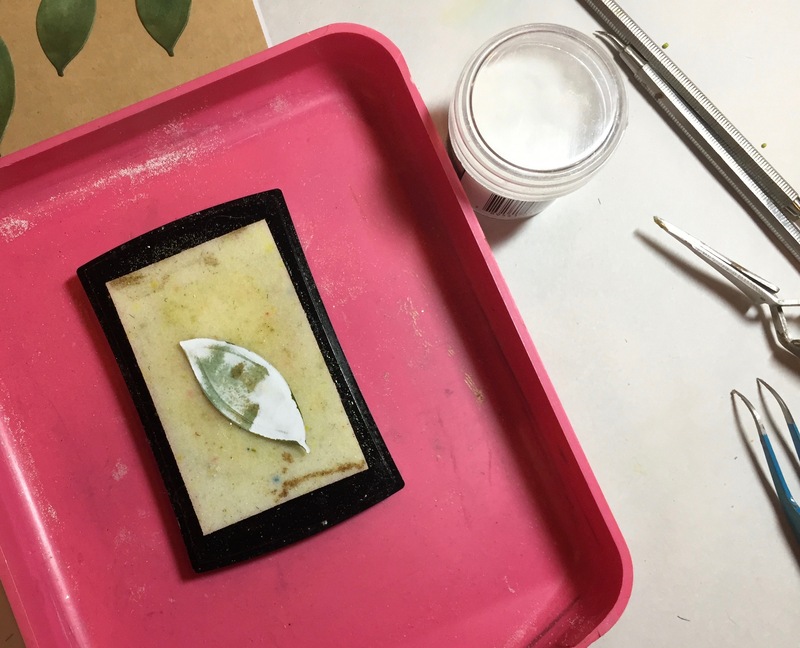 If you want the green side to show, shape with the green facing down on the mat; for the caramel colored side, shape with the green facing up while you pinch the stem line with the tweezers. 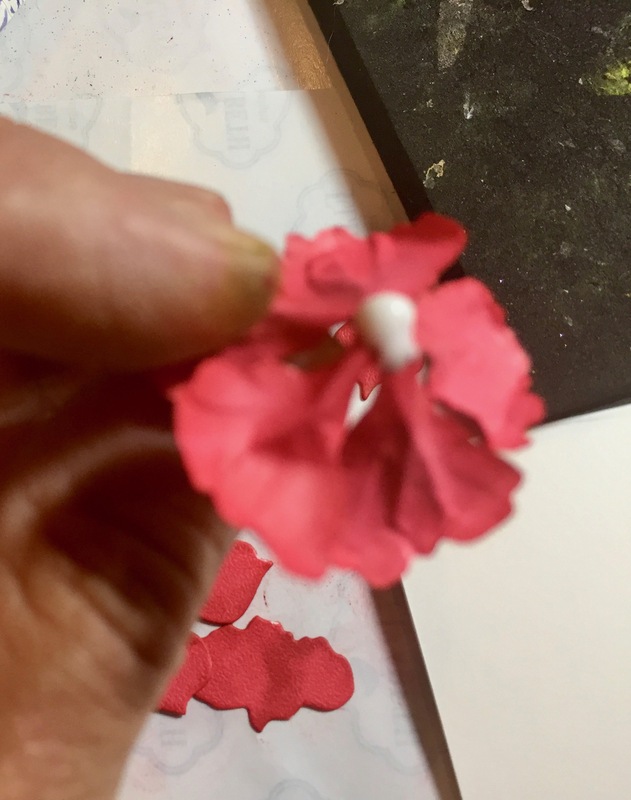 Insert leaves around the flower. 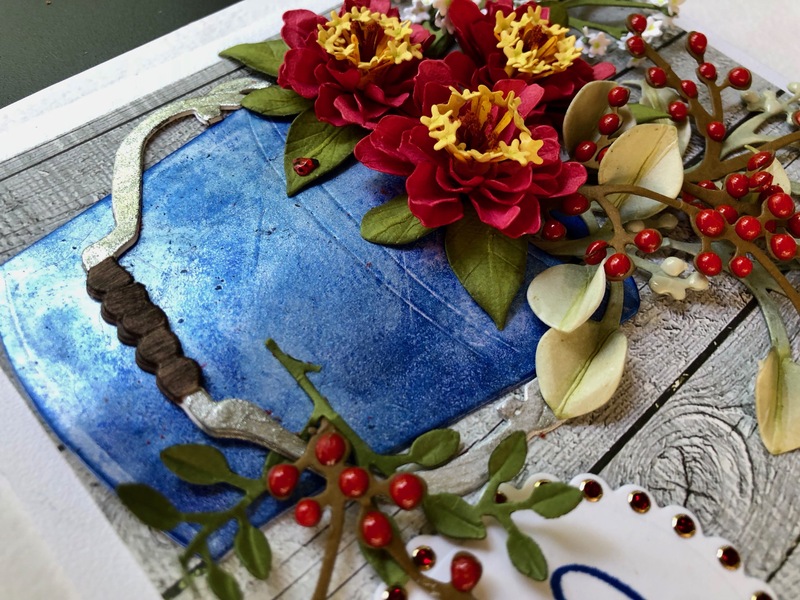 To complete the project, I added some ferns underneath and created berry branches using Tonic’s Nuvo Crystal Drops/Ripened Pumpkin. 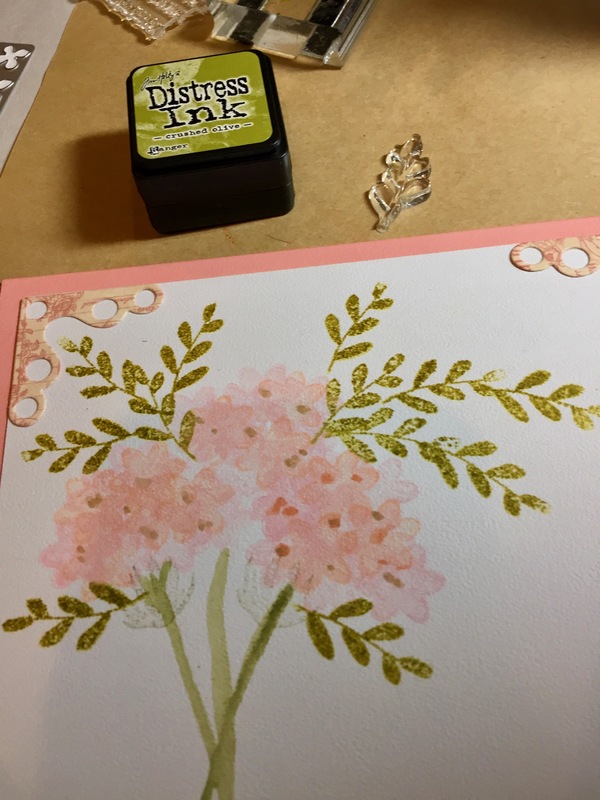 I added Suzanne Cannon’s new “Just for You” to finish my project. 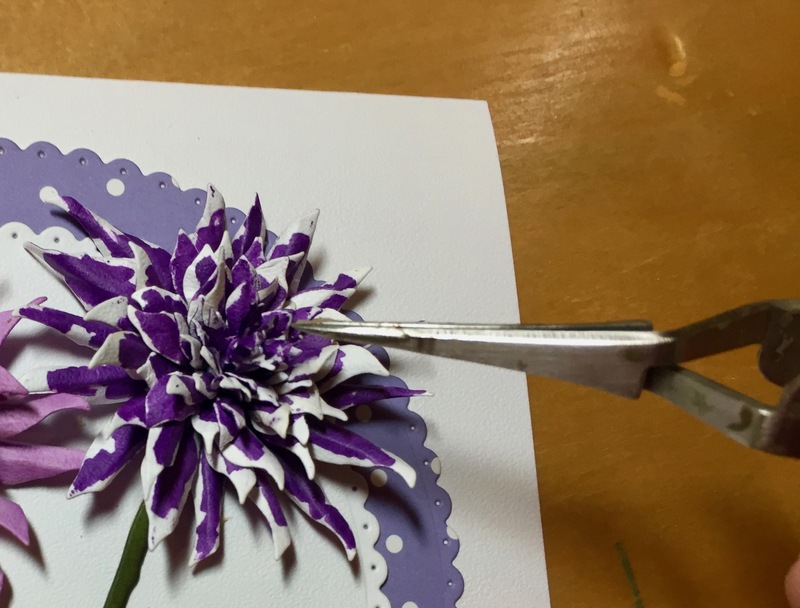 I hope this step out helps you construct this beautiful flower; it really is quite impressive! 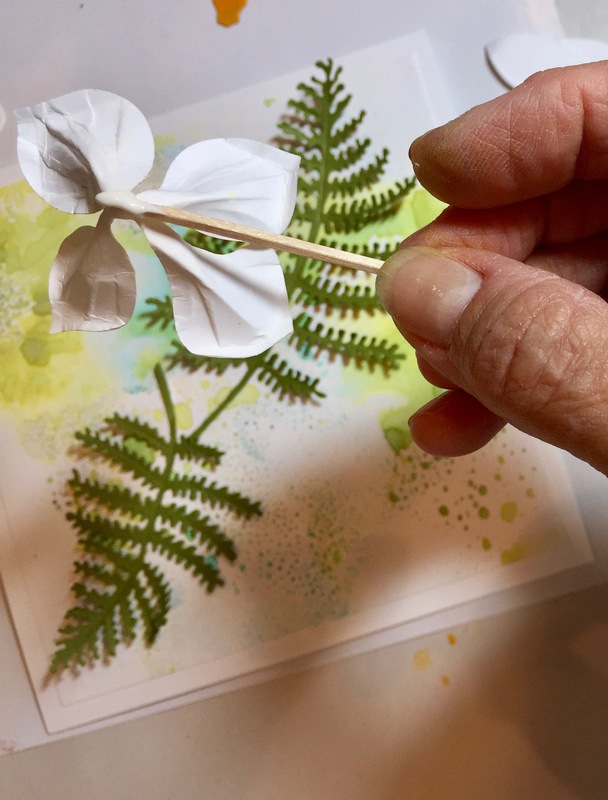 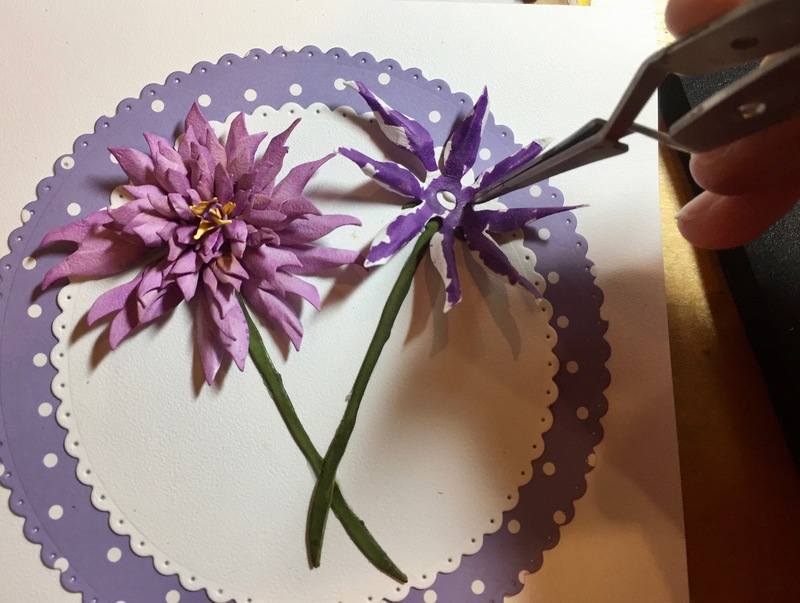 I’ve always said, “I’m a gardener first, paper artist second!” For me, it’s not just creating flowers, but flowers that resemble those grown in our gardens or given in bouquets. 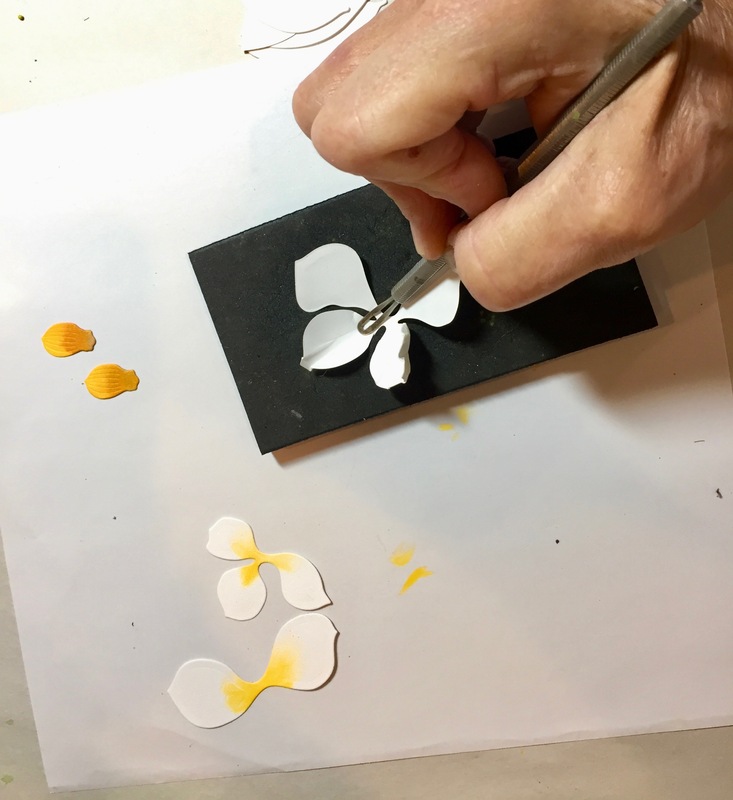 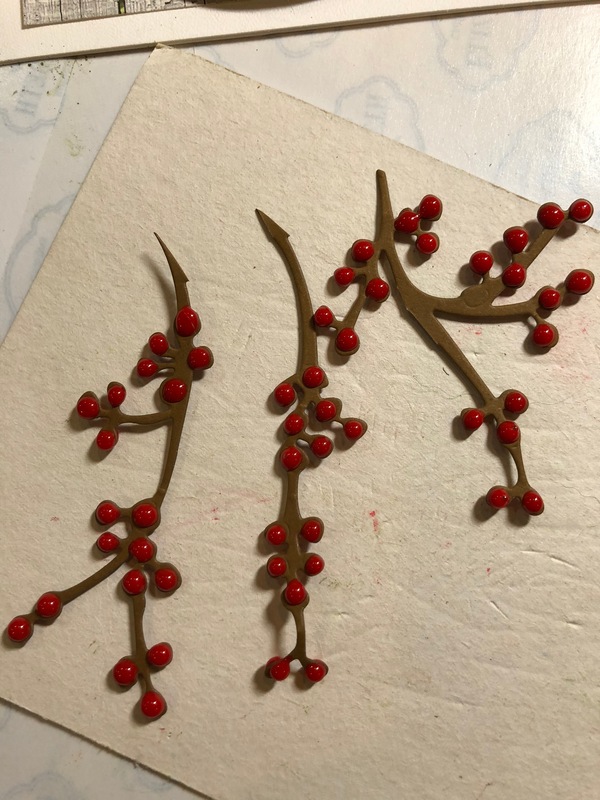 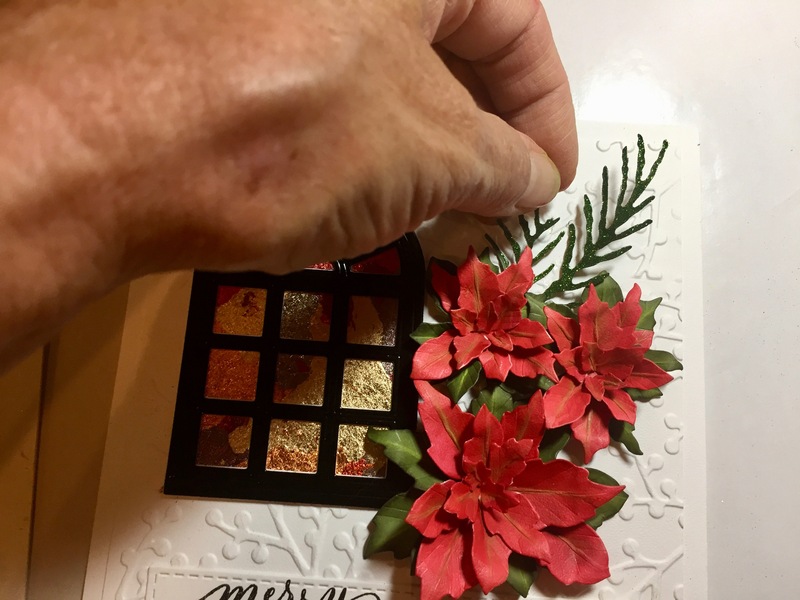 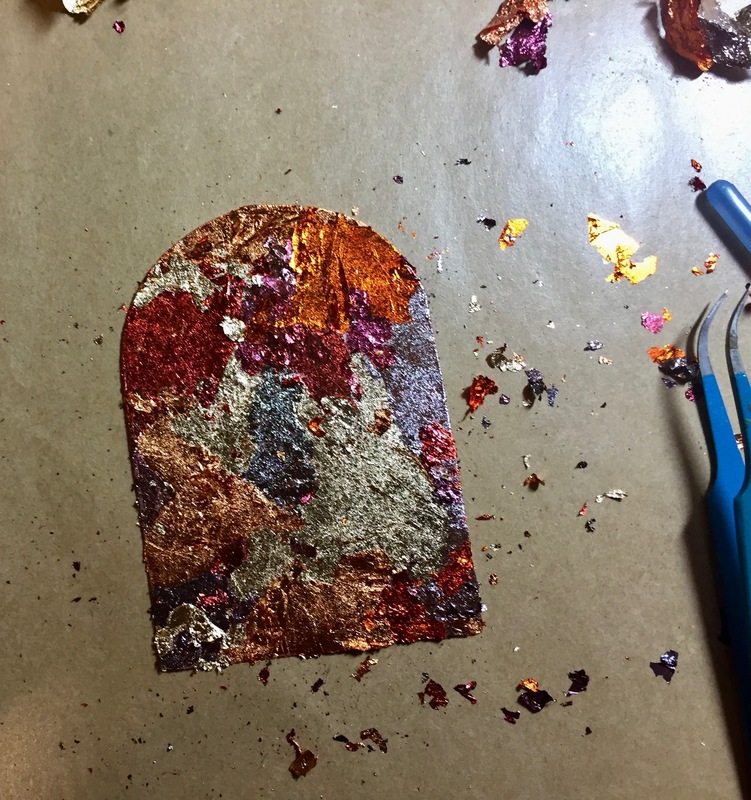 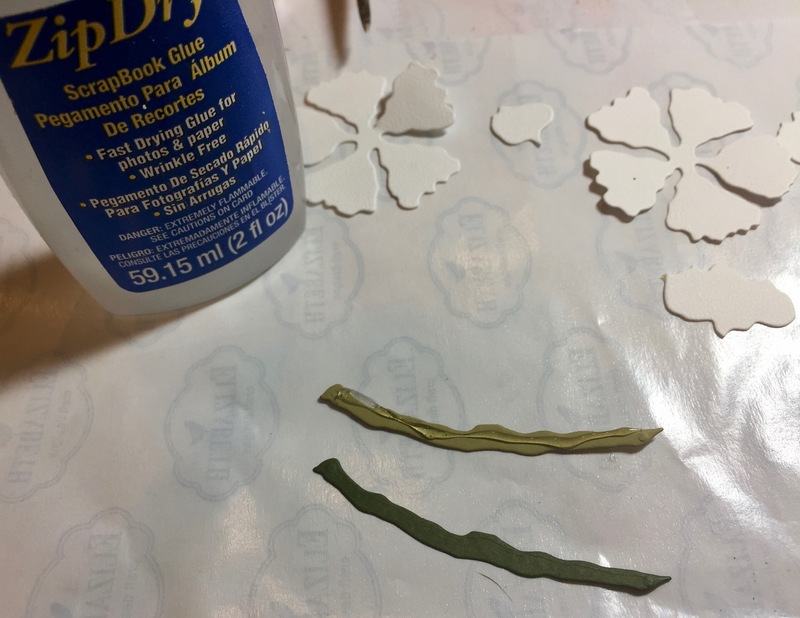 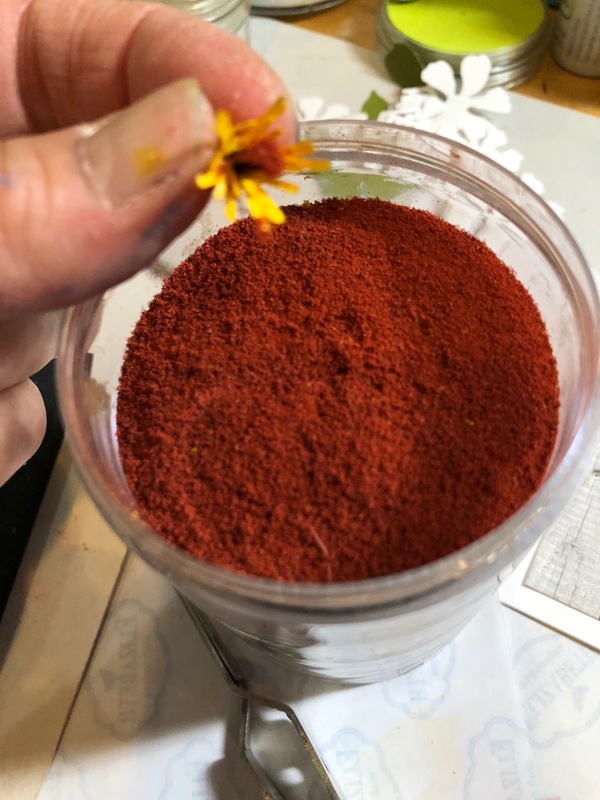 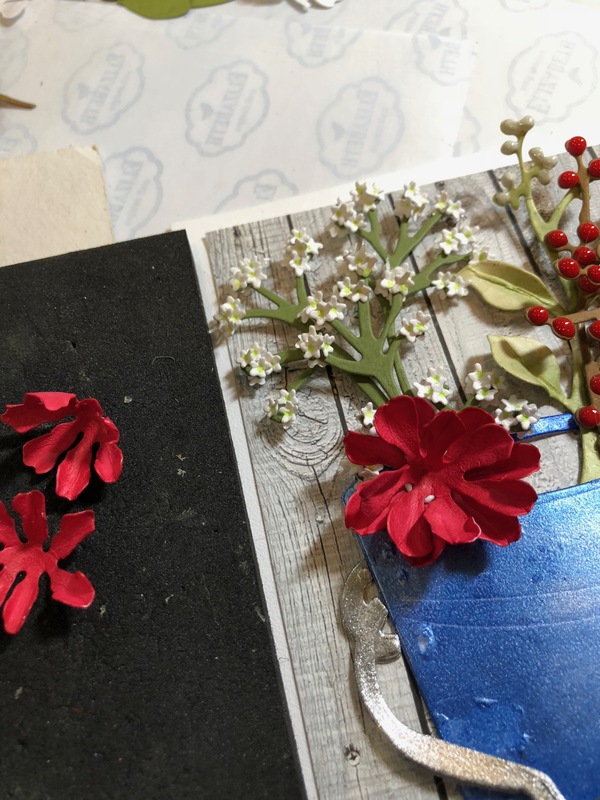 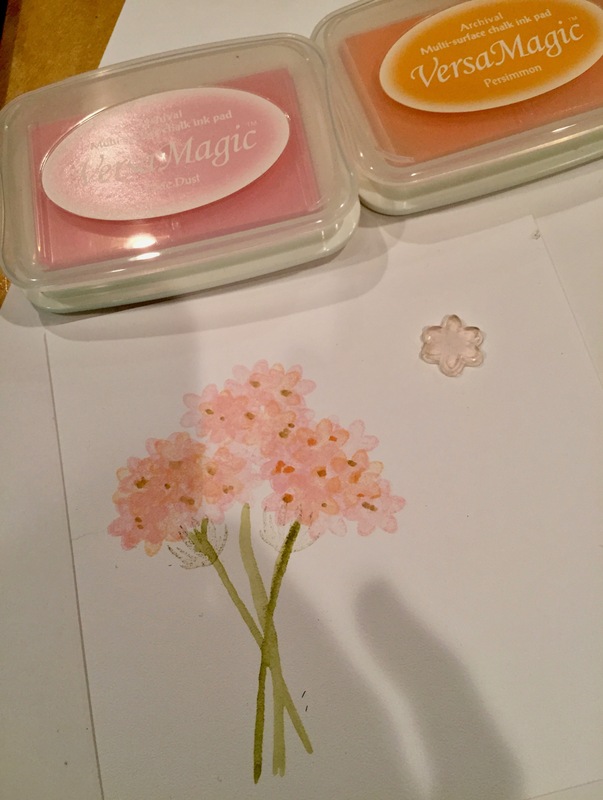 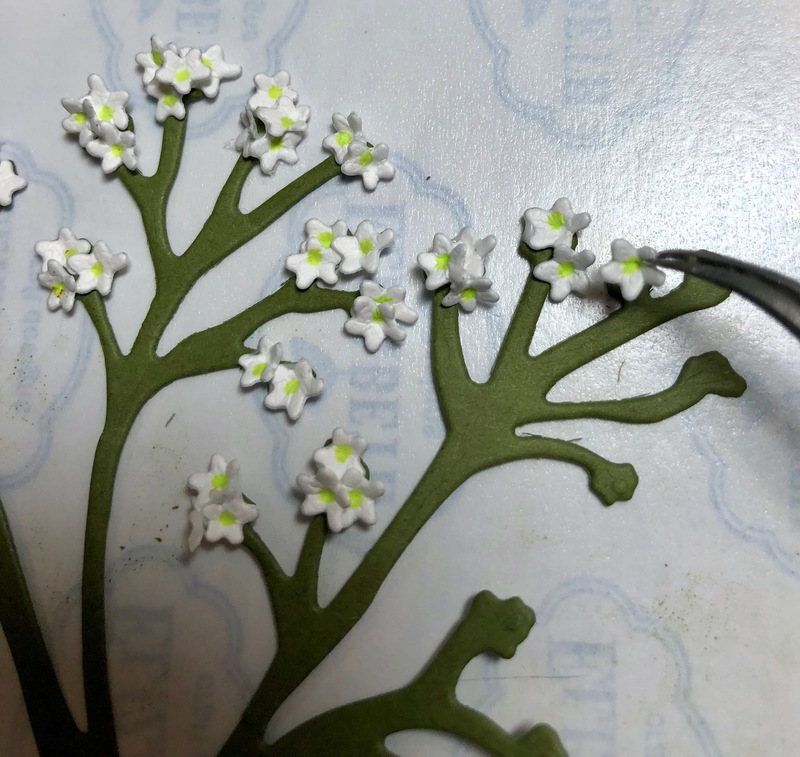 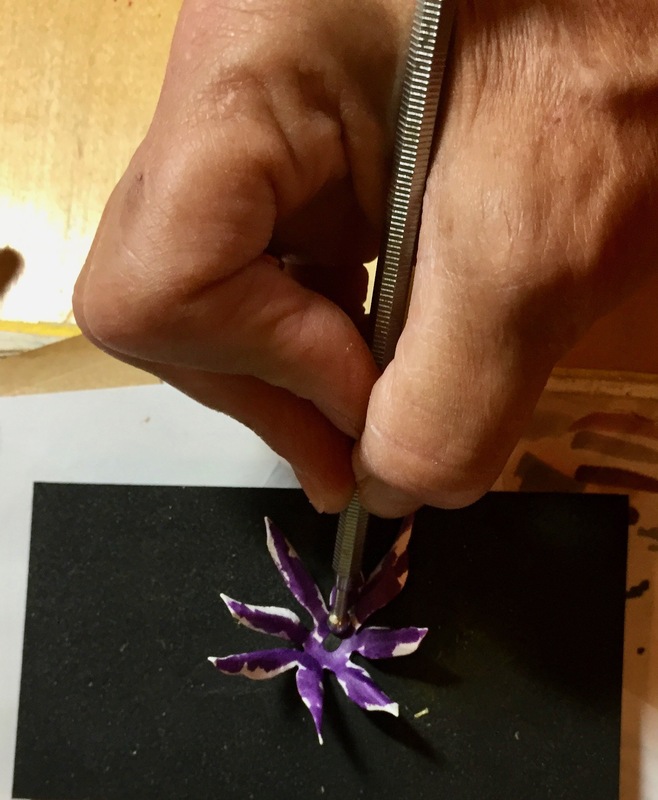 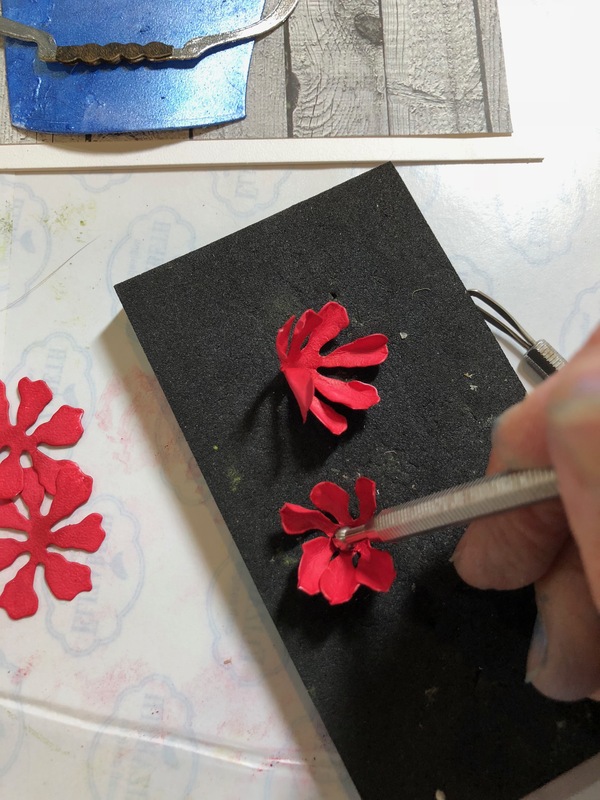 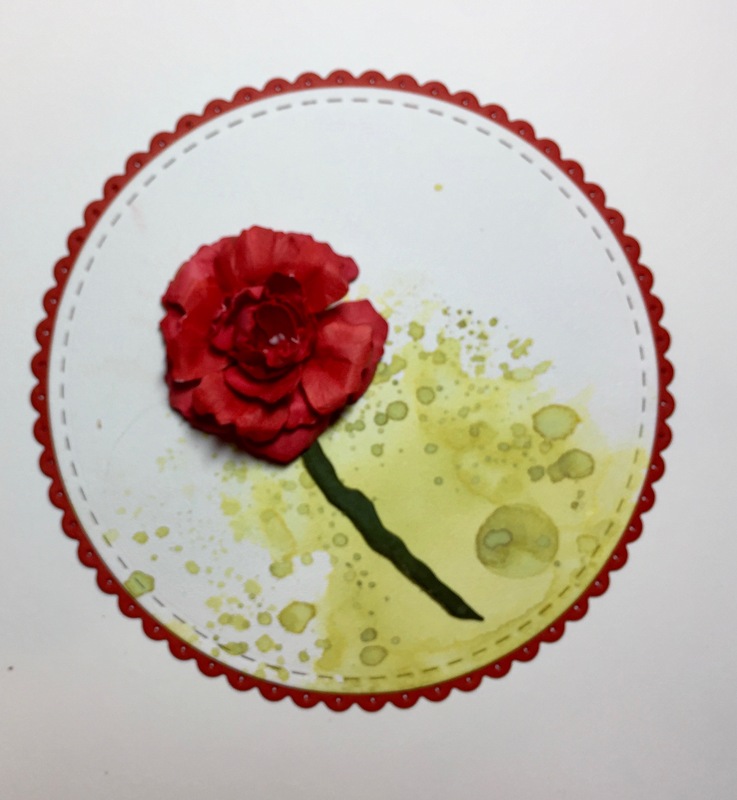 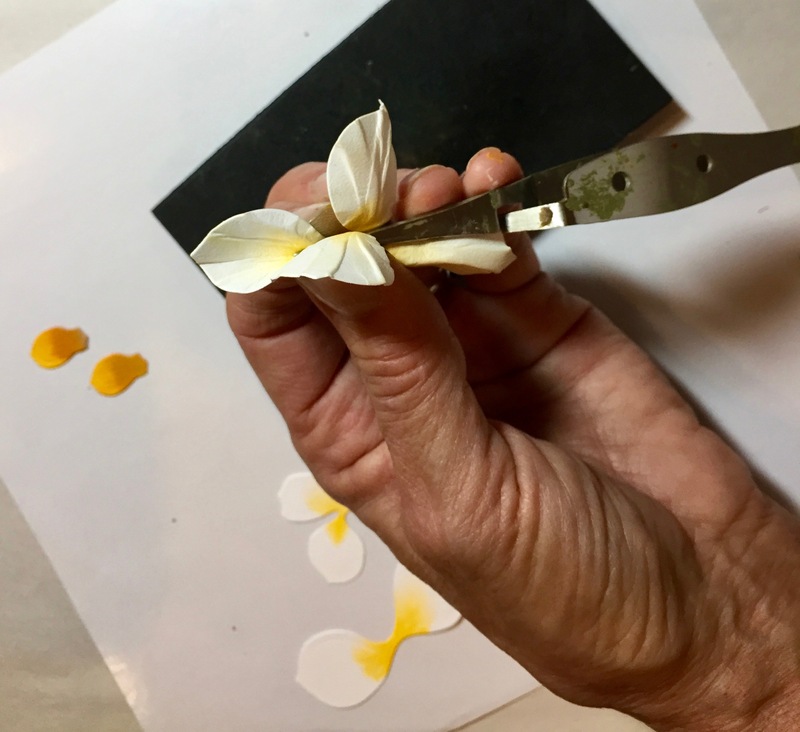 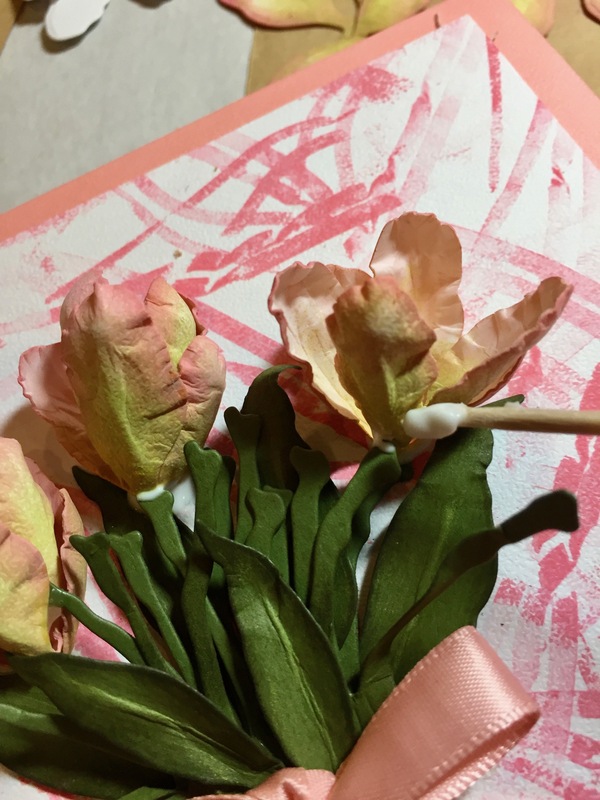 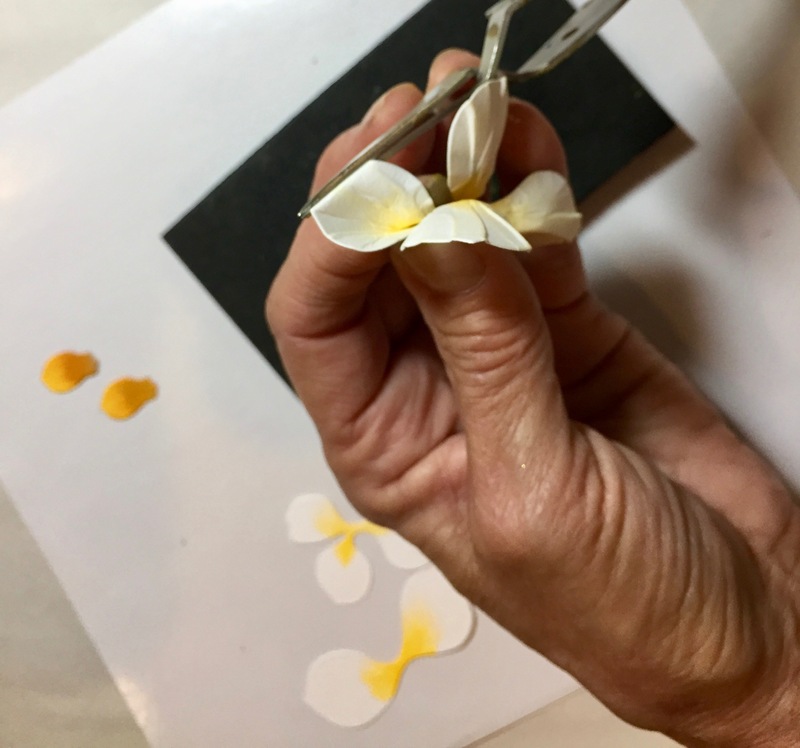 I’ve been doing FaceBook Live Tutorials, not only how I assemble the dies I create, but showing how simple it is to color and shade the petals (and leaves) to make people do a double-take that these flowers are actually made of paper. 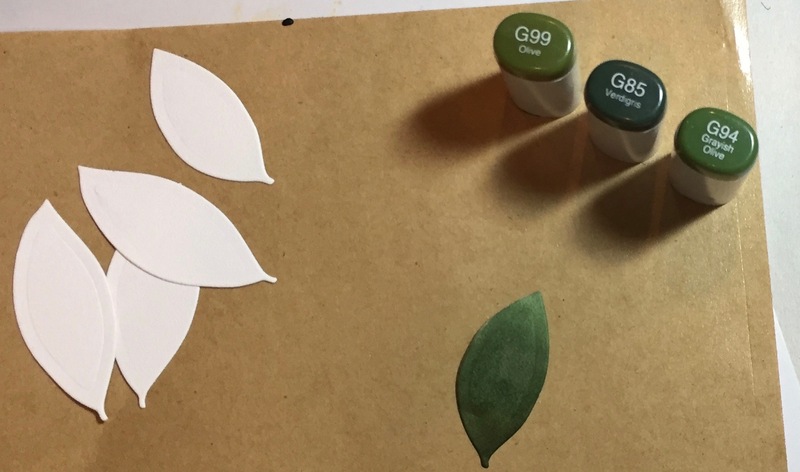 Here’s a List of Copic Markers that I used on the projects I did this past week. 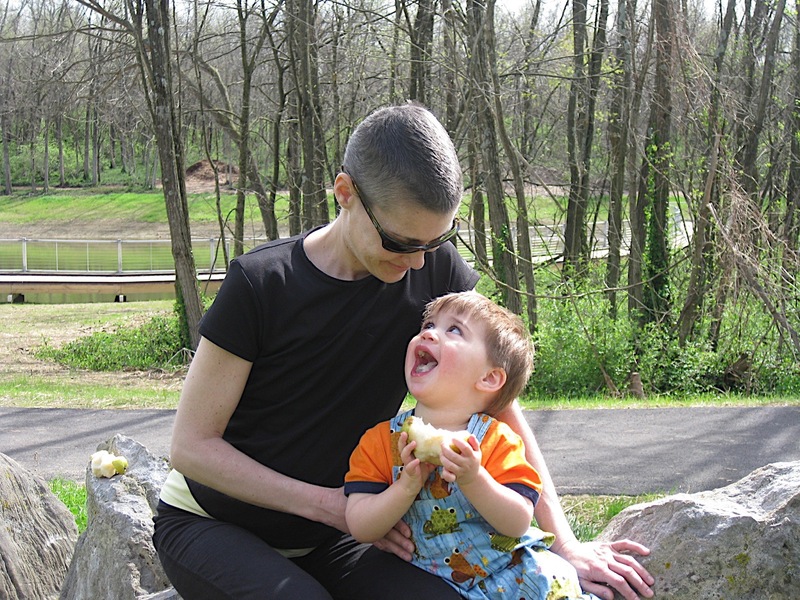 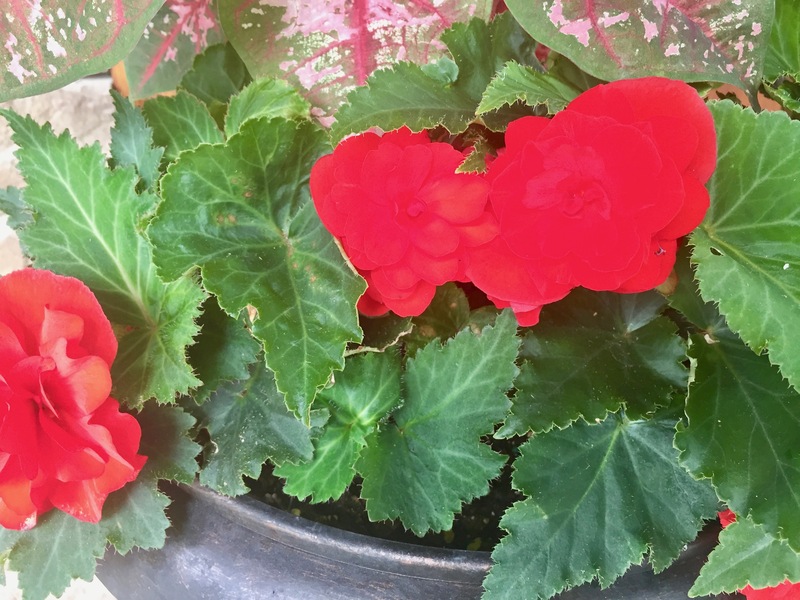 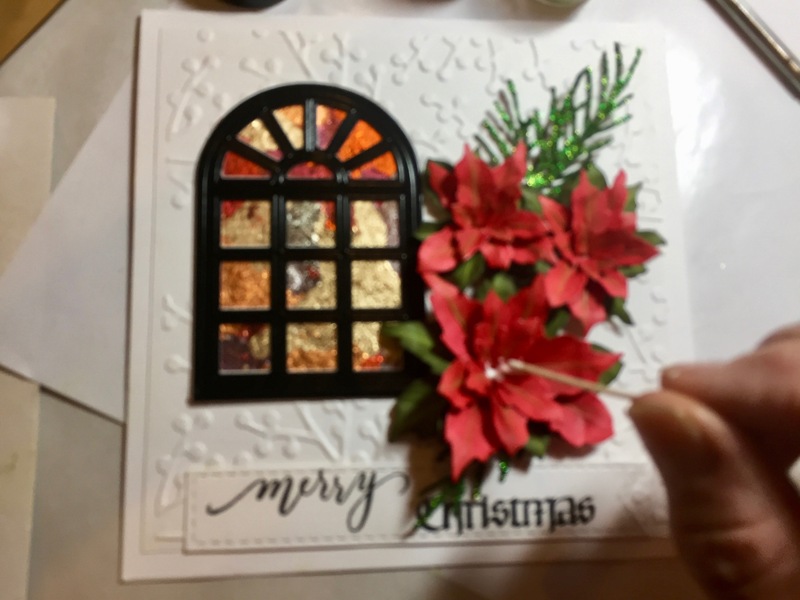 If you missed the video, it does stay up on my FaceBook paper–Susan’s Garden Club. 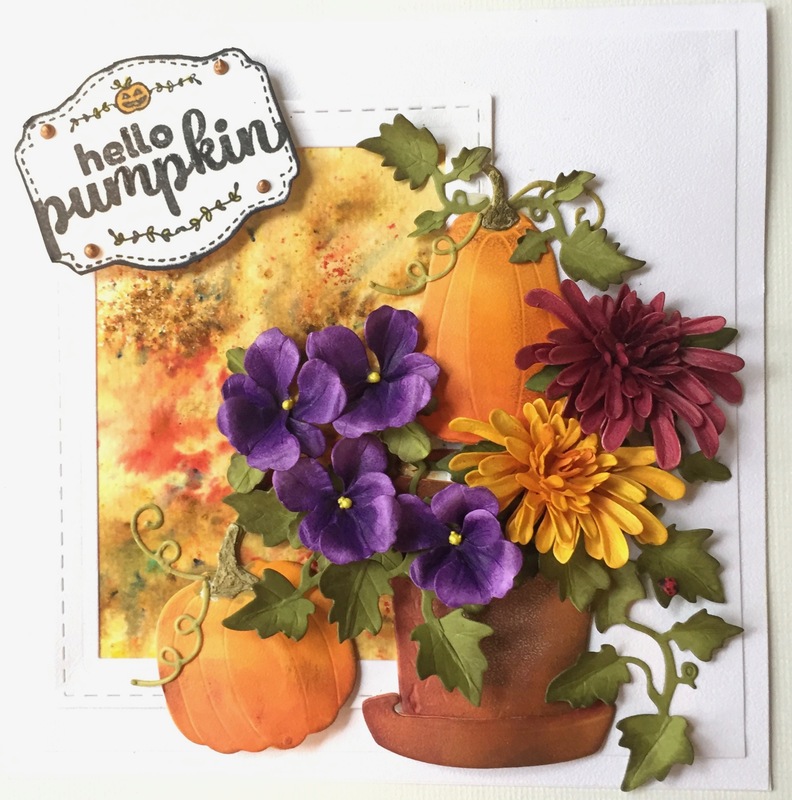 I hope that answers your questions on what I used–have fun creating beautiful Autumn bouquets! 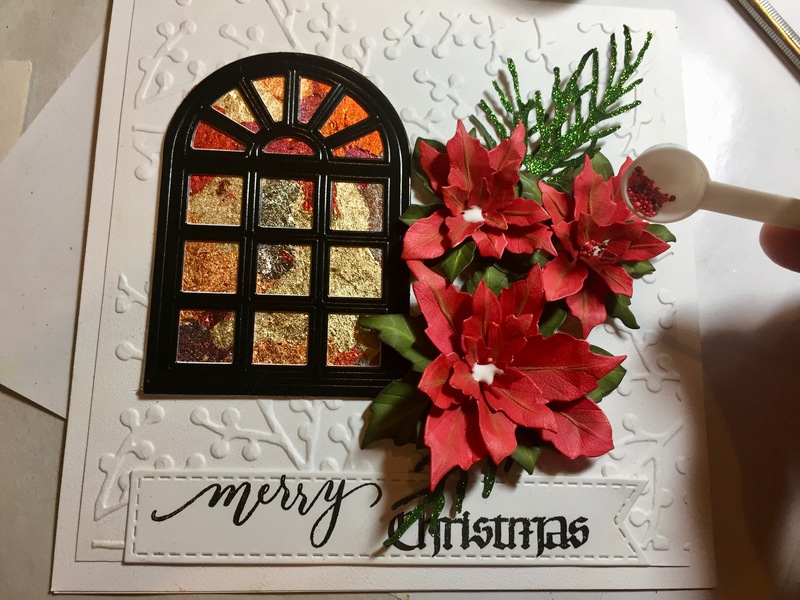 Poinsettias are popular Christmas decorations in homes, churches, and elsewhere in North America. 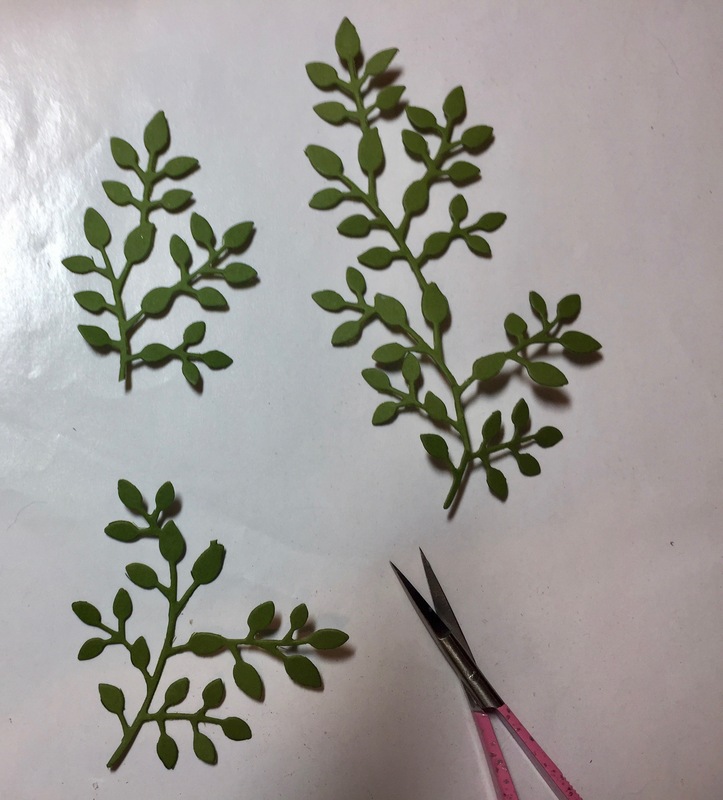 It’s native to Mexico and can be found growing wild in deciduous tropical forests at moderate elevations. 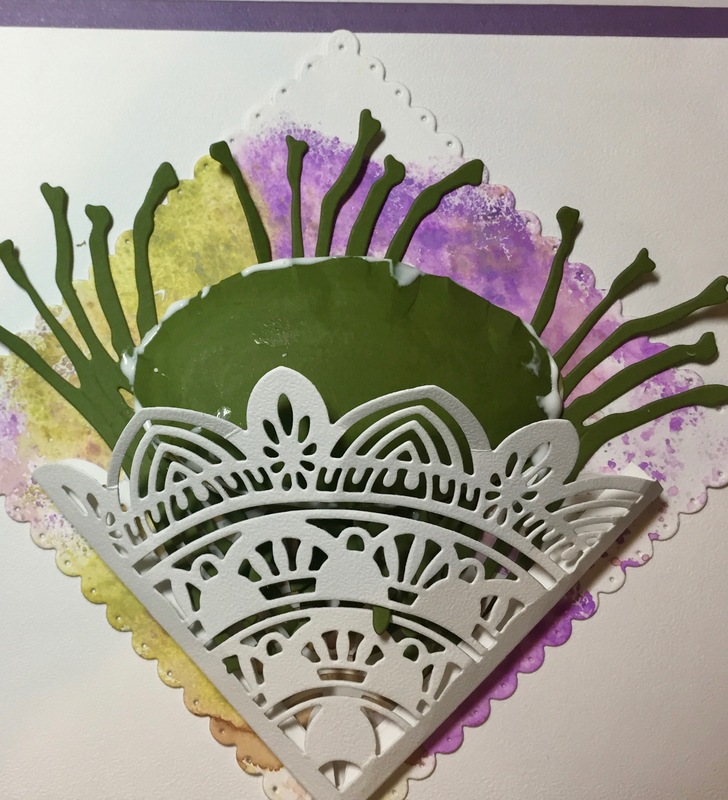 It’s know as “Flor de Noche Buena,” meaning, Christmas Eve Flower! 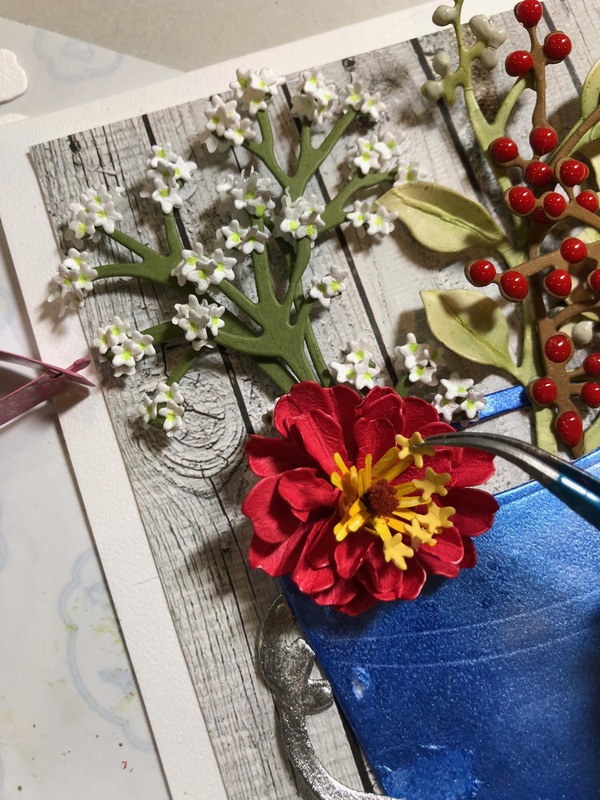 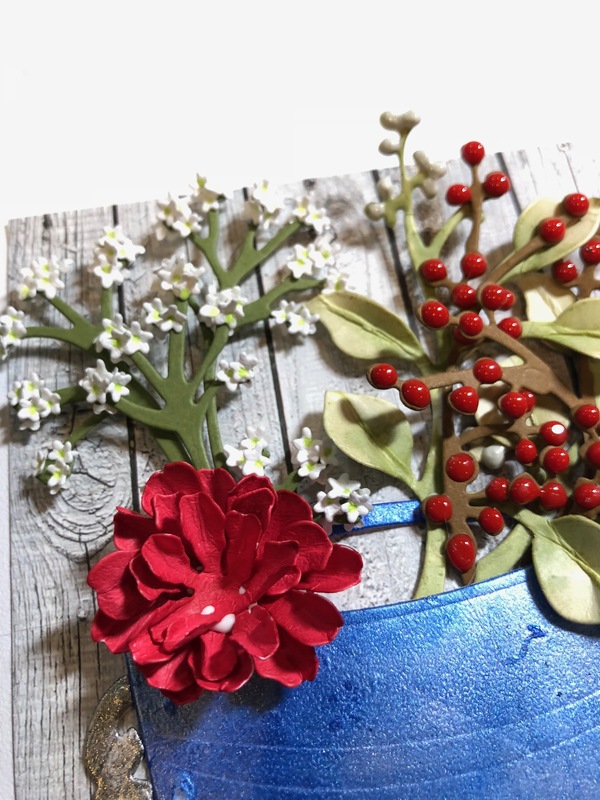 This past Wednesday on Susan’s Garden Club Live Facebook page, I show how to create this beautiful holiday card. 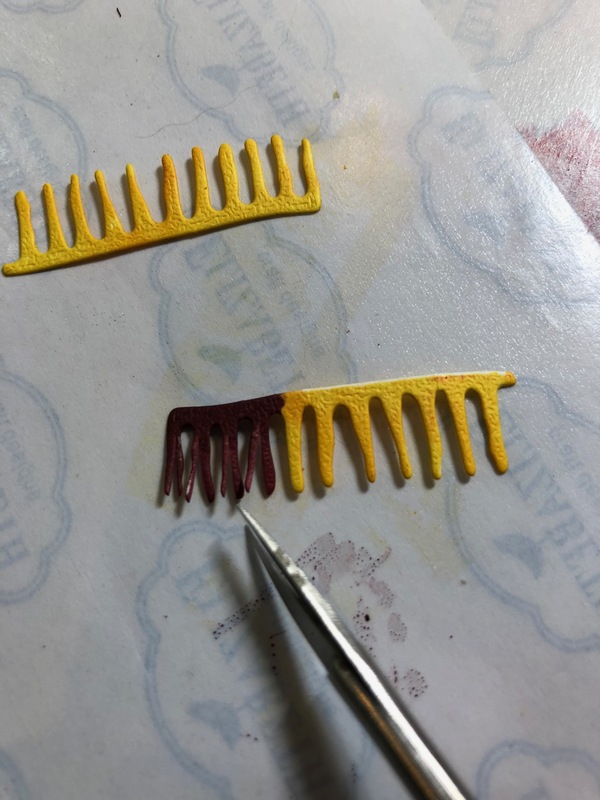 I was asked if I could step it out and provide a product list. 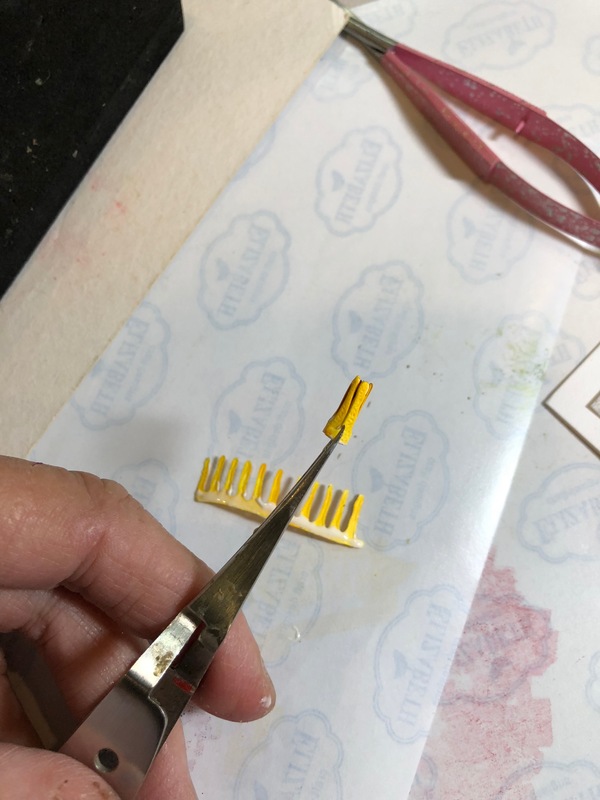 I am more than happy to do that. 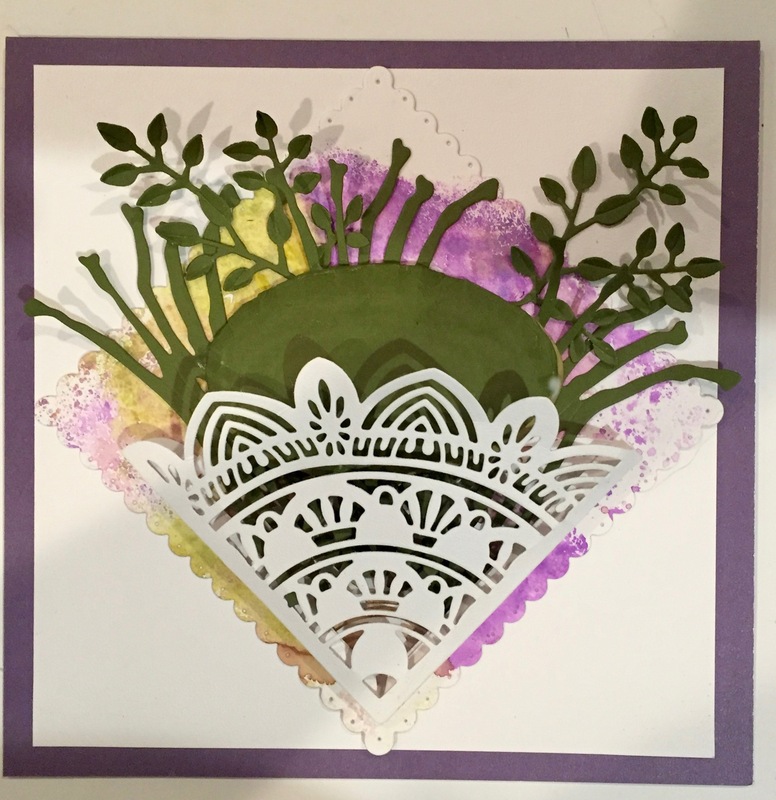 I like my cards to be 6″ x 6,” cut from 100 lb./270g Soft Finish white cardstock. 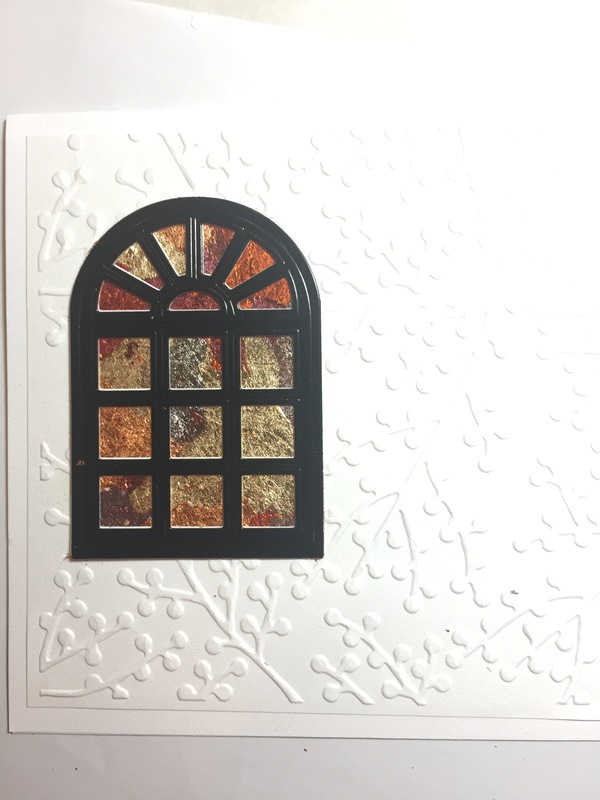 I cut the next layer into a 5 1/2″ x 5 1/2″ square and embossed it with the Berry Branch embossing folder. 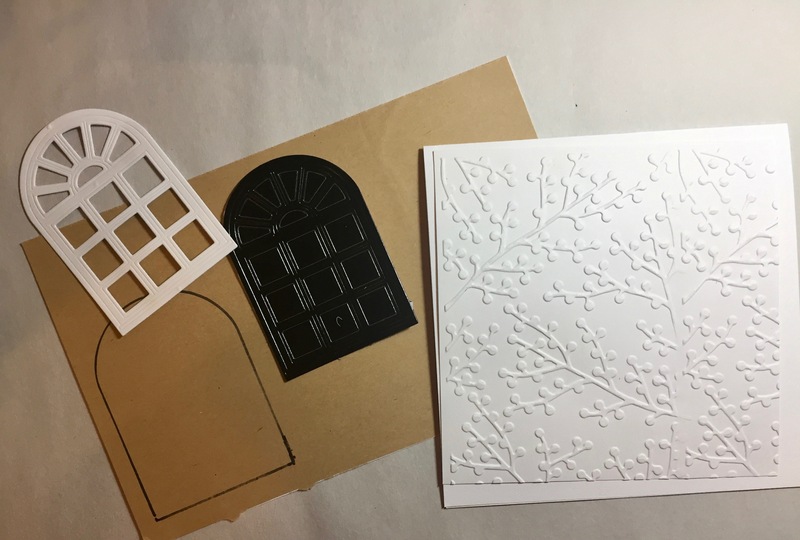 I also die cut my Carolina Window out of the 85 lb./230g Soft Finish white and black glossy cardstock, both backed with Clear Double-sided Adhesive. 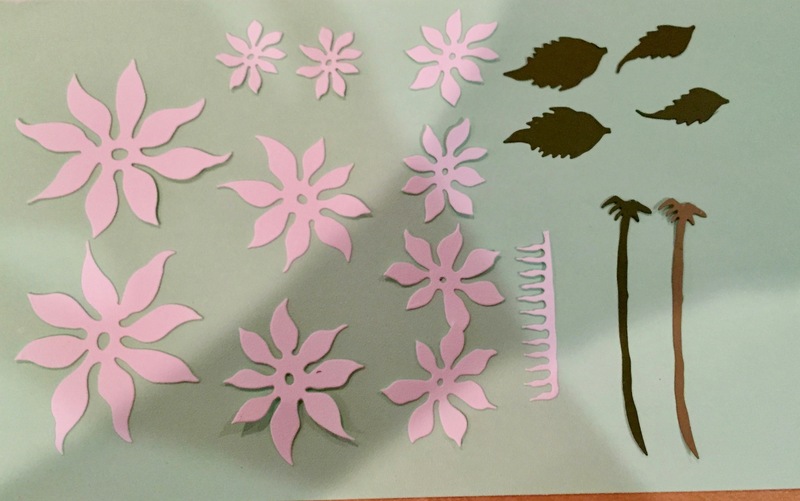 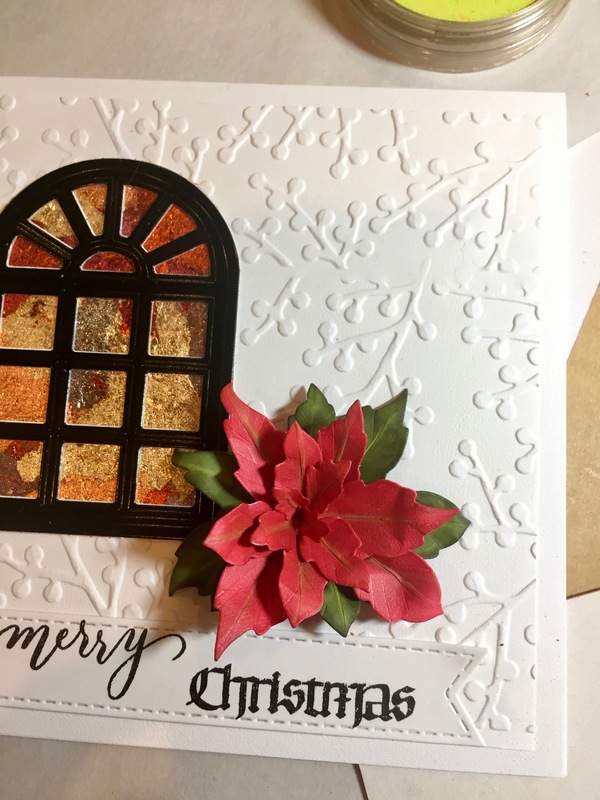 Also, die cut the Poinsettia as shown. 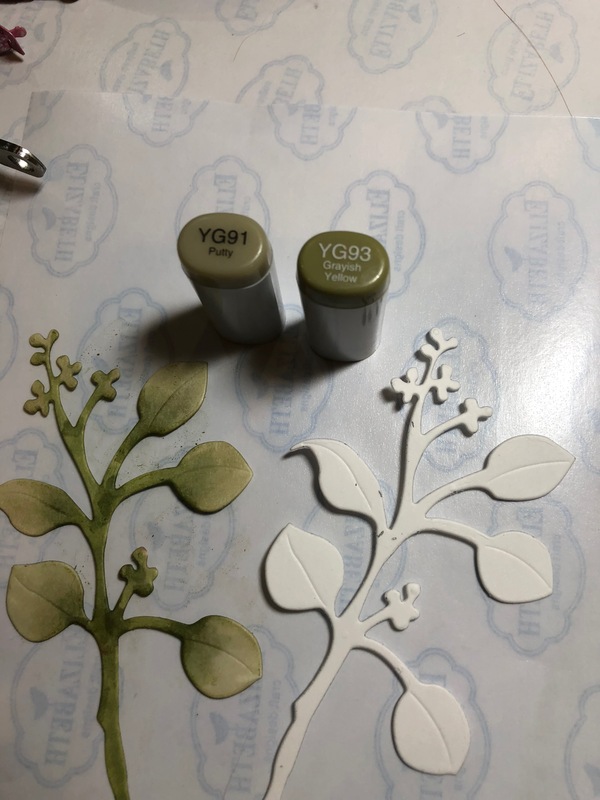 (I used a medium green cardstock and Soft Finish white cardstock in the 85 lb./230g. 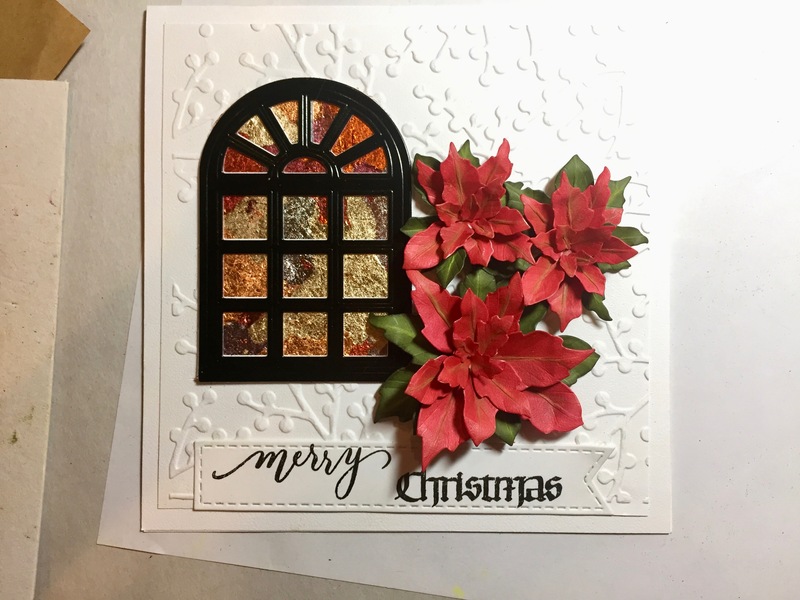 Creating the “stained glass” window was done by using USArtQuest GildenGlitz. 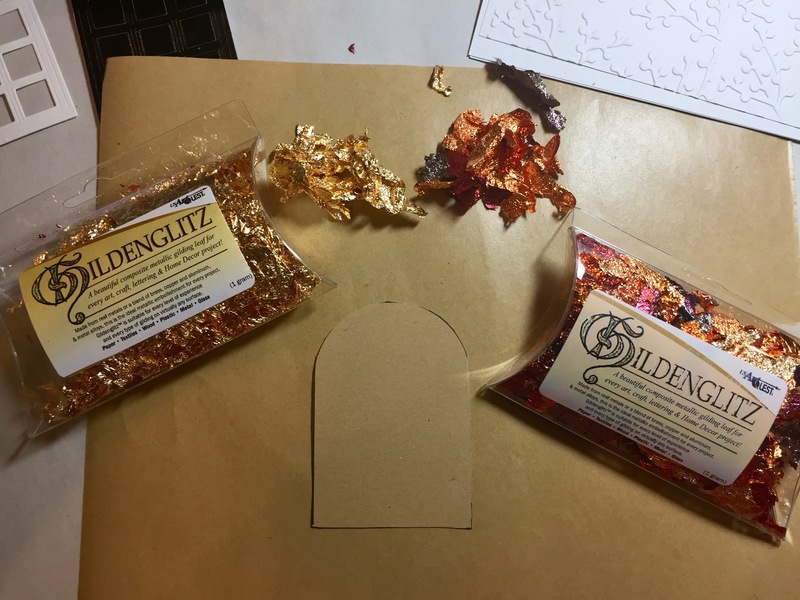 I peeled the Clear Double-sided Adhesive from the solid window piece and placed bits of multi-colored and gold GildenGlitz on it. 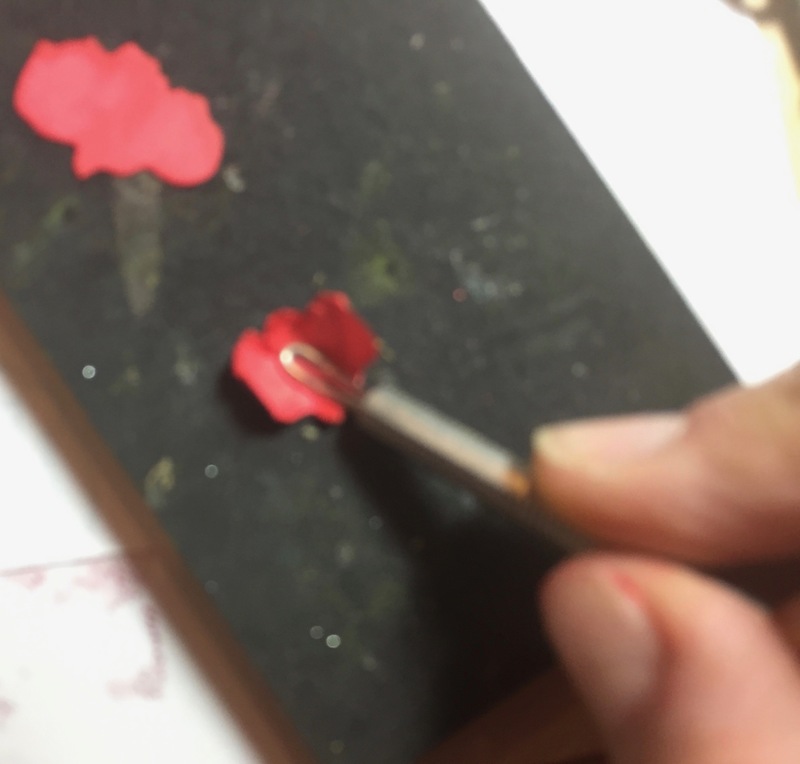 Then, I used a soft brush to smooth the surface. 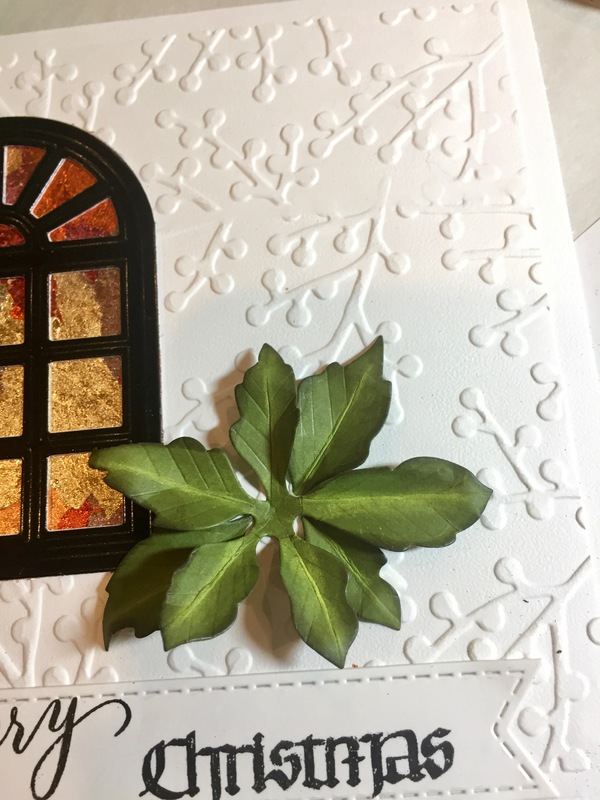 Use Double-sided tape to adhere the stained glass piece to your project. 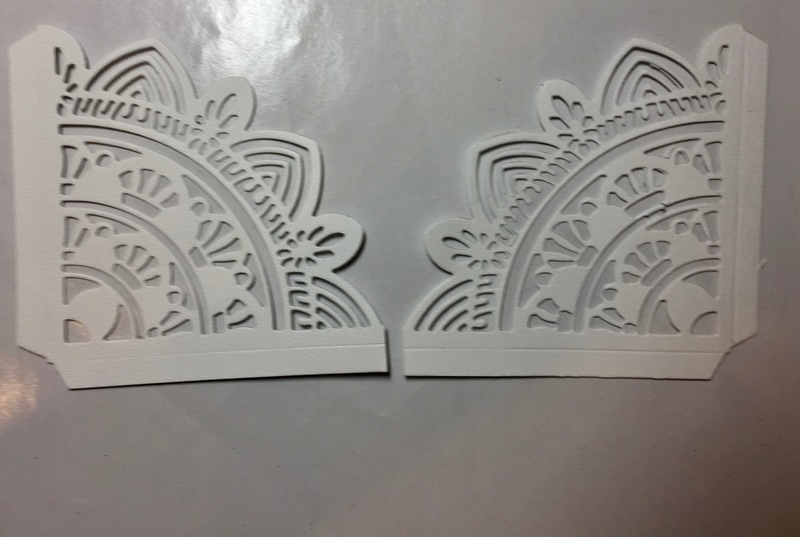 Next, add the Carolina Window die cut in white cardstock and finally, the glossy black one. 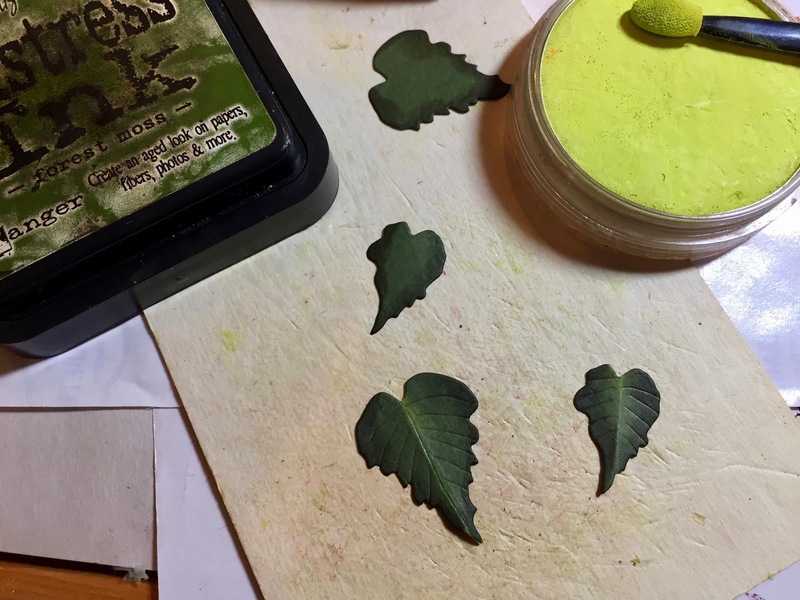 Shade the green leaves on the edges with Distress Ink/Forest Moss, then place them right-side-up on the Leaf Pad and use the Leaf Tool to score a stem line down the center. 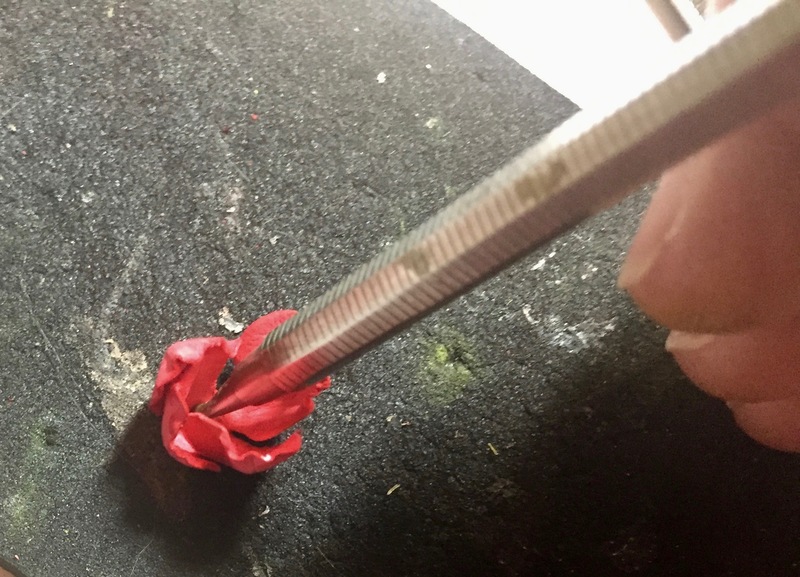 Flip the piece over and repeat this scoring. 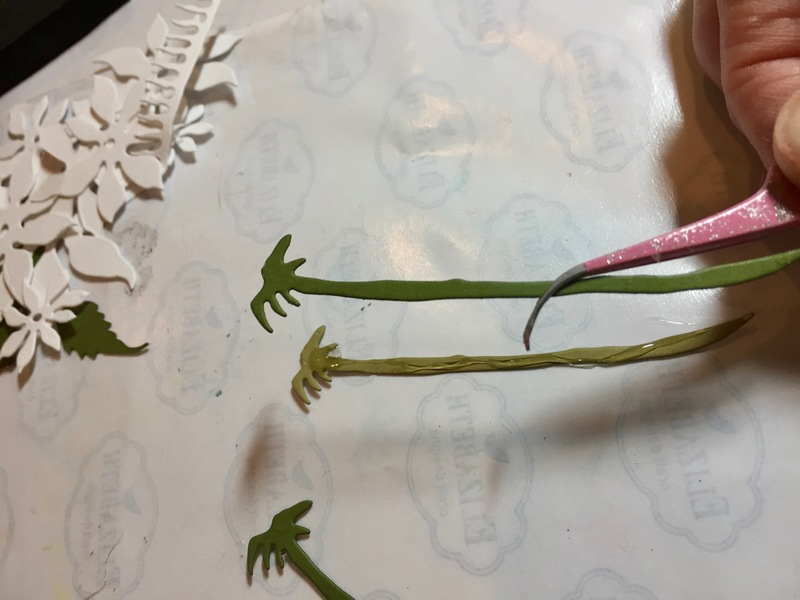 (This step really accentuates the stem line.) 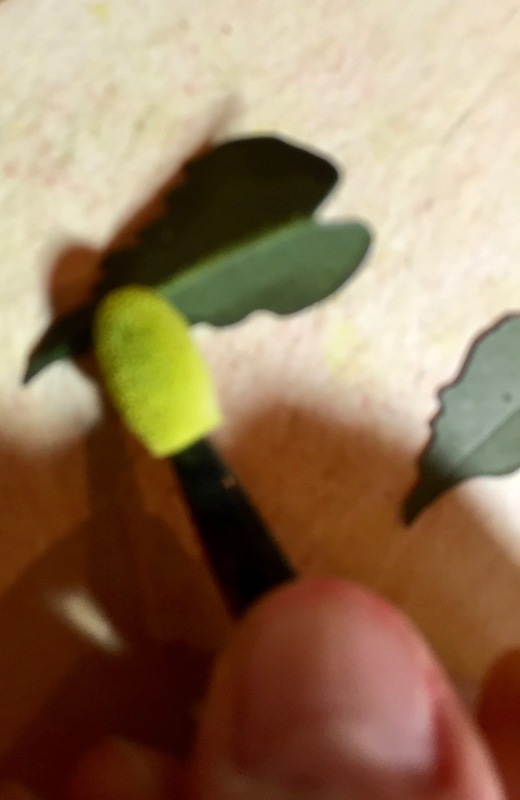 Pinch the leaves in half and use PanPastels/Bright Yellow Green (from Set 1) to shade the stem line. 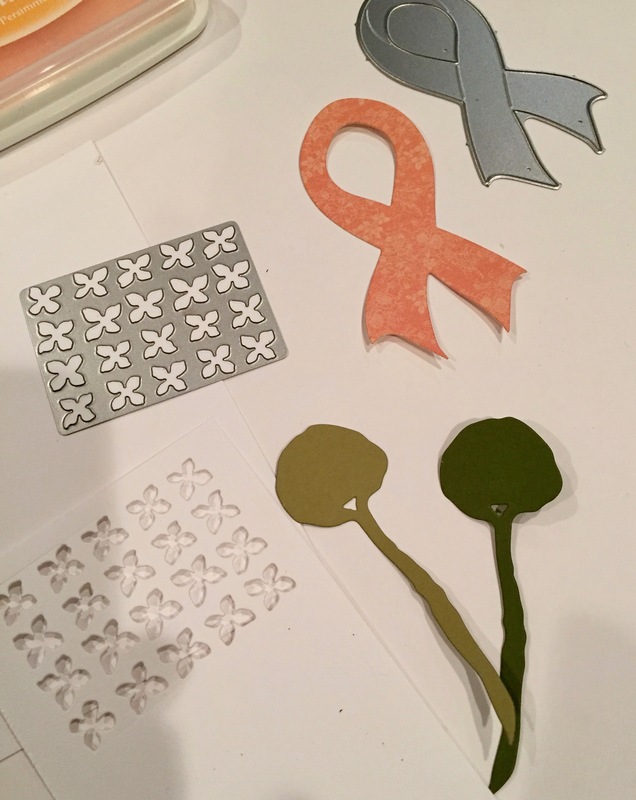 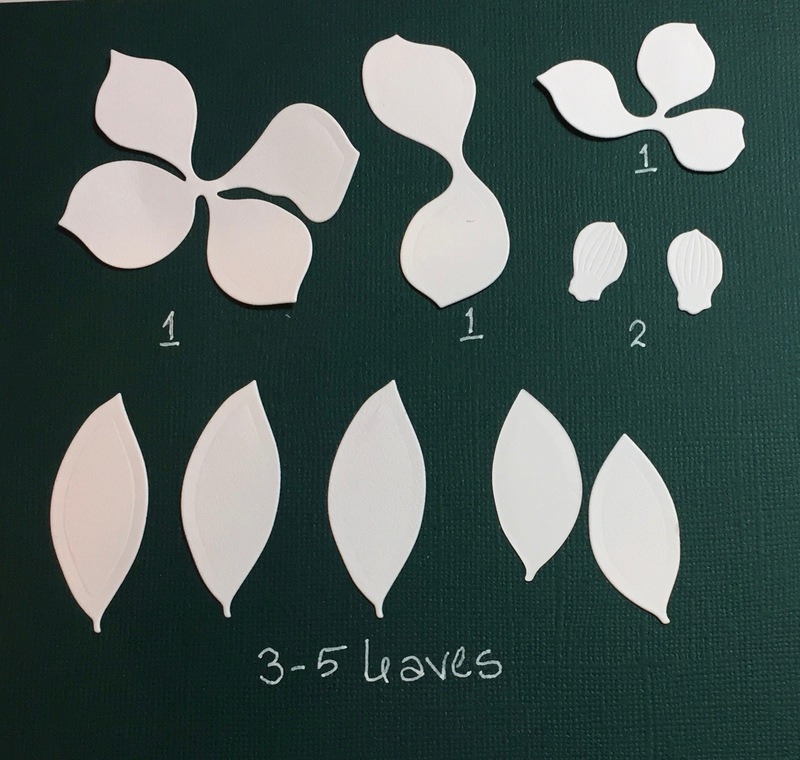 Do this to the 5-leaf piece, as well as, the three (3) additional leaves die cut in green. 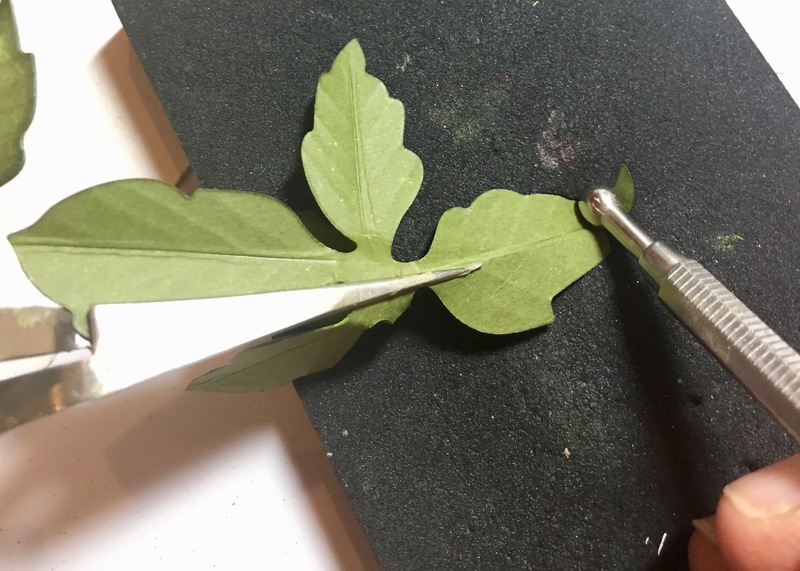 Place the pieces, right-side-up on the Leaf Pad and using the Leaf Tool, add vein lines on either side of the stem. 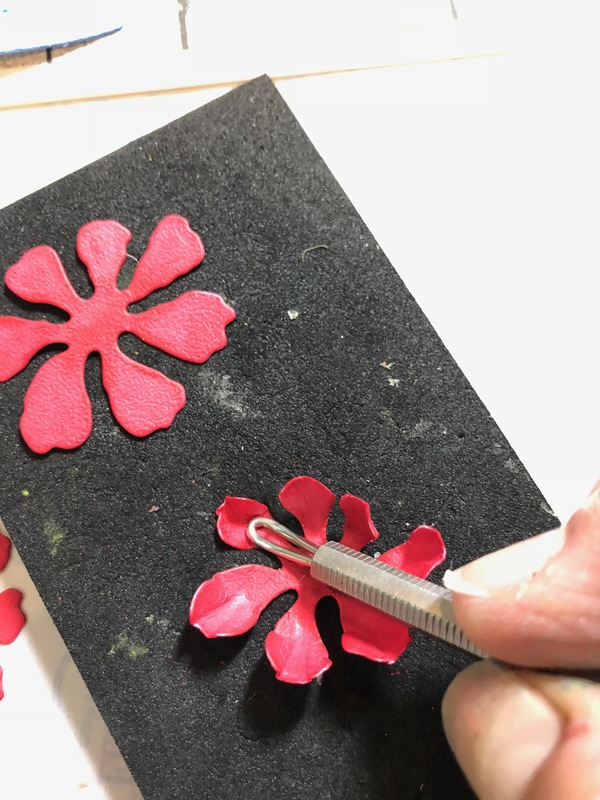 Next, use your tweezers to pinch at the stem line, bringing the fold up, then turn over and place the tip area on the Molding Pad. 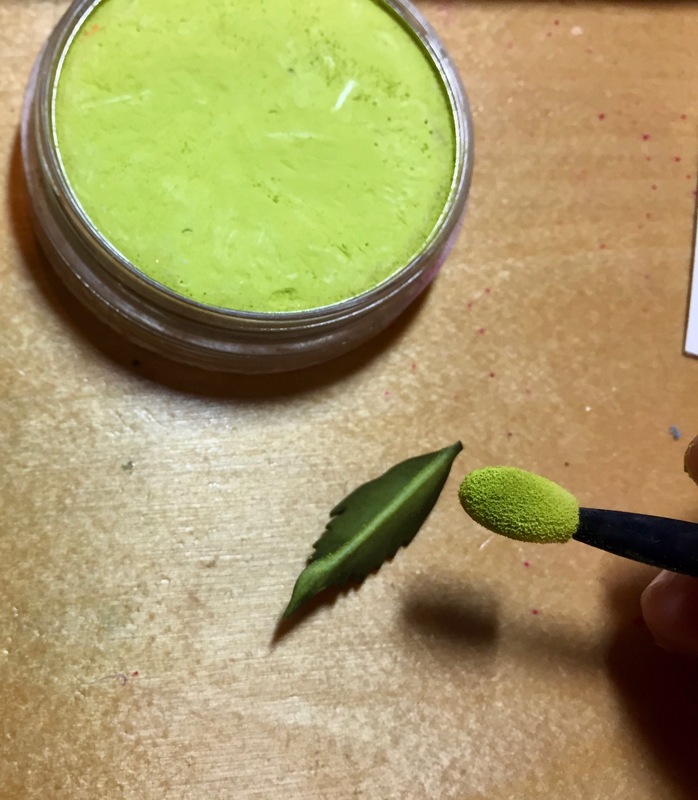 Use the Medium Ball Stylus to “scrunch” the tip area so it looks more natural. 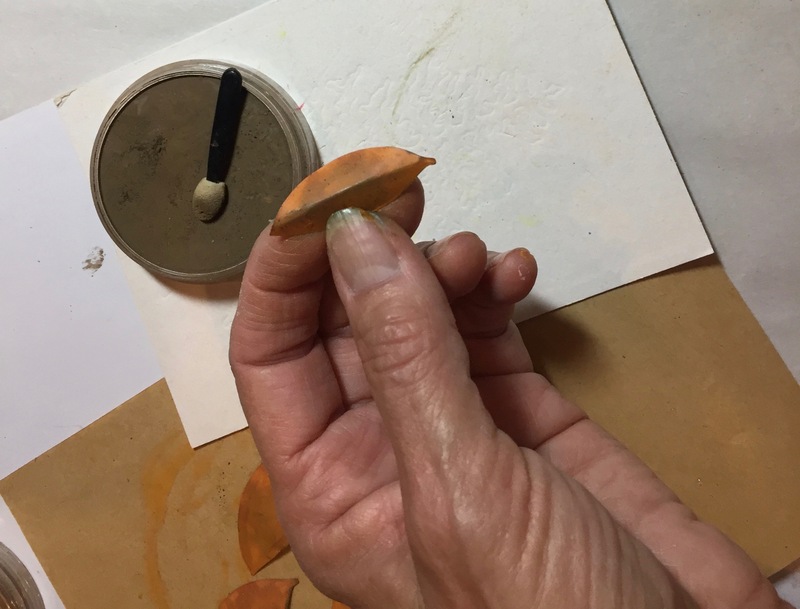 Placing the piece right-side-up on the Molding Pad, Use the Medium Ball Stylus to cup the center and add dimension. 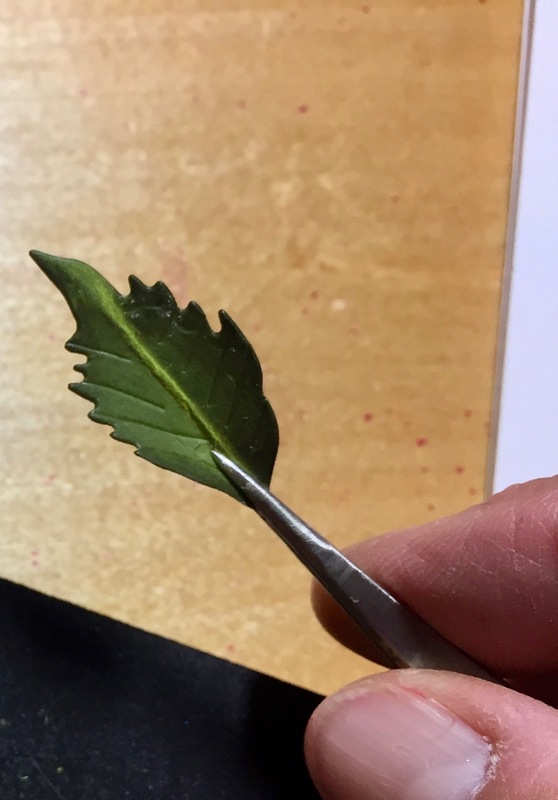 For the separate leaves, use the tweezers to pinch the stem are, turn it over and scrunch the tip as you did for the 5-leaf piece. 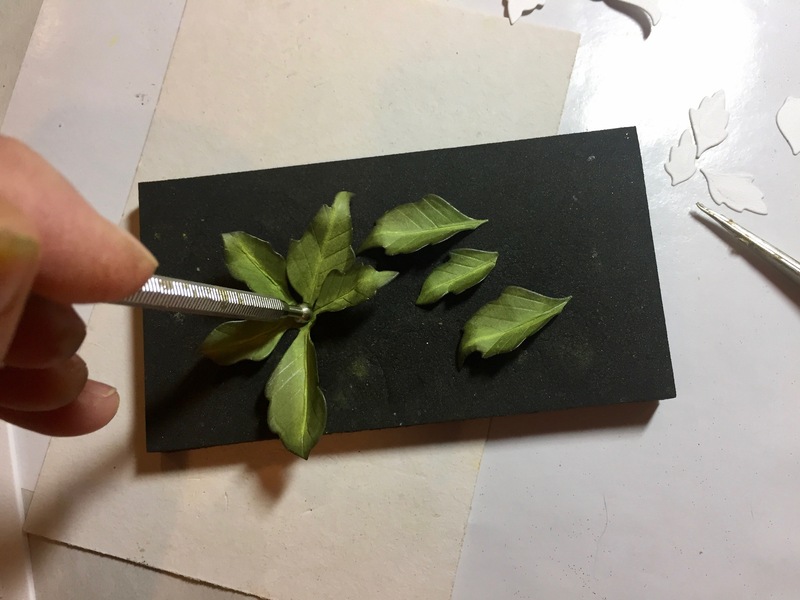 Use a toothpick, dipped in glue, and place some on the underside of the 5-leaf section. 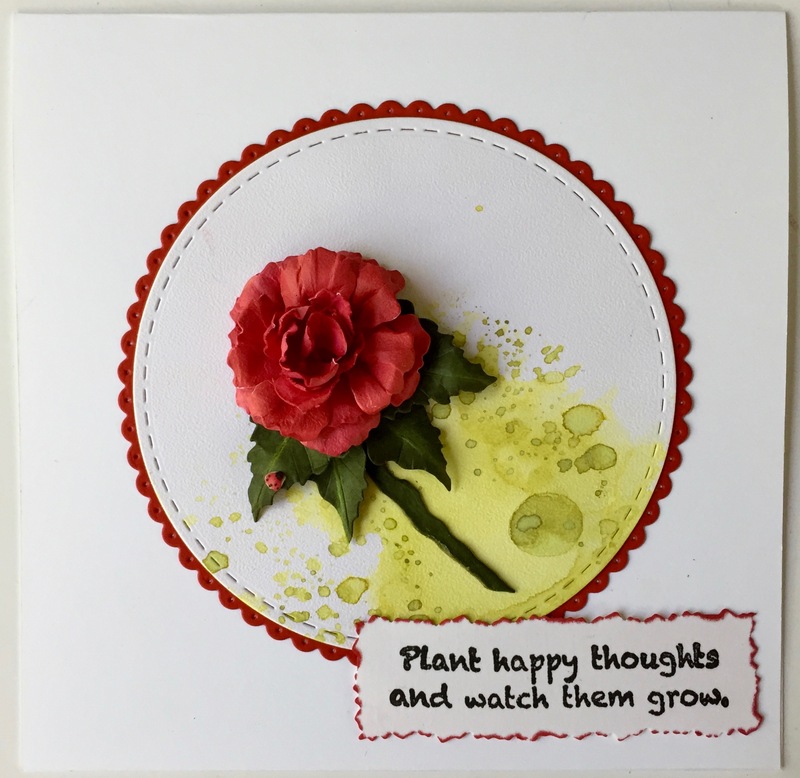 Adhere this to your project. 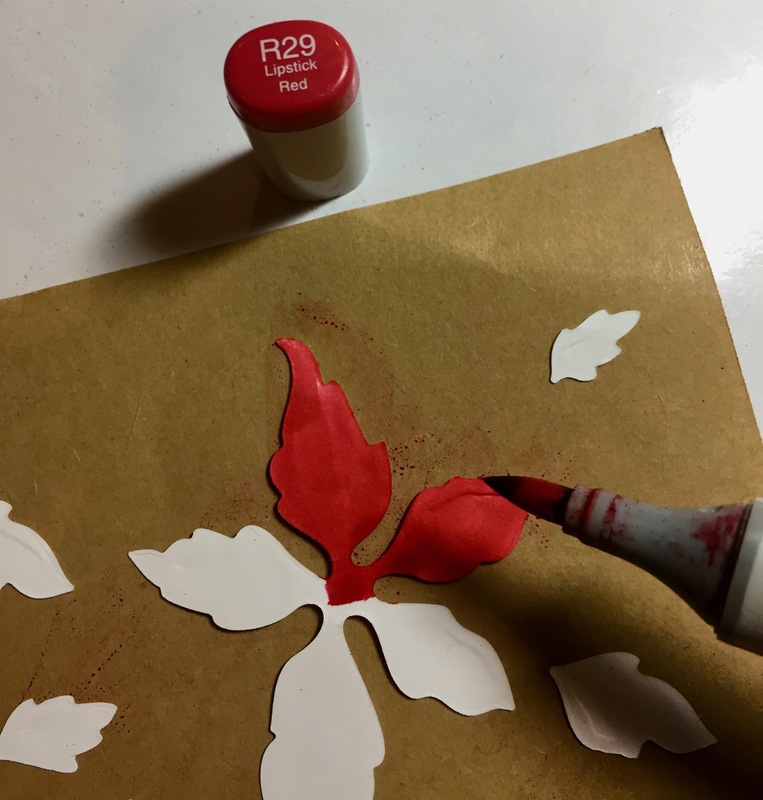 I colored the white leaves with Copic Markers–First with R29 on the wrong side, then used both R46 and R29 on the right side to shade the leaves. 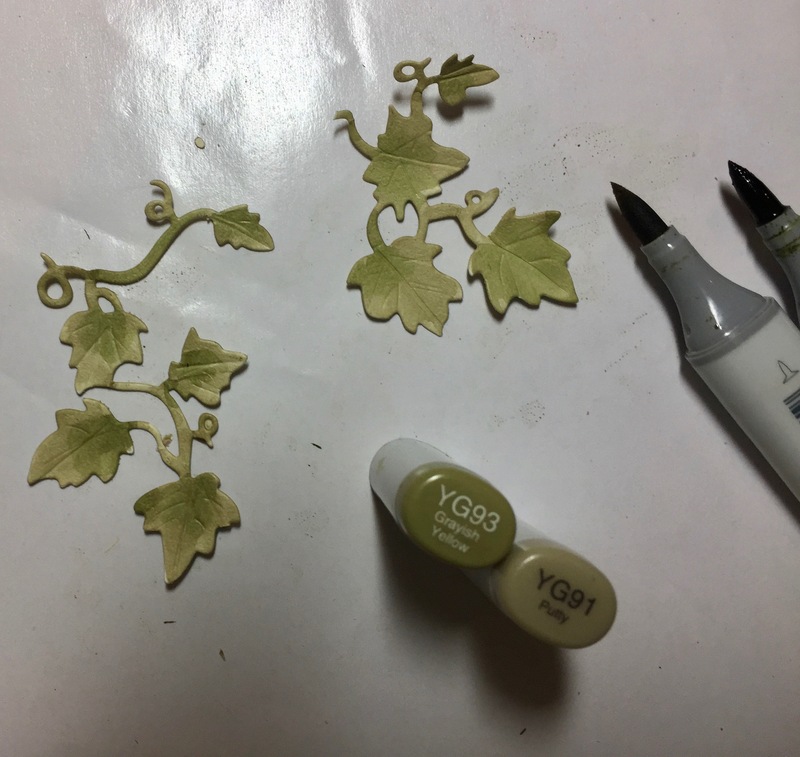 The steps for creating the stem are the same as the green leaves above, except I used PanPastels/Bright Yellow Green Shade (which can be found in Set 2). 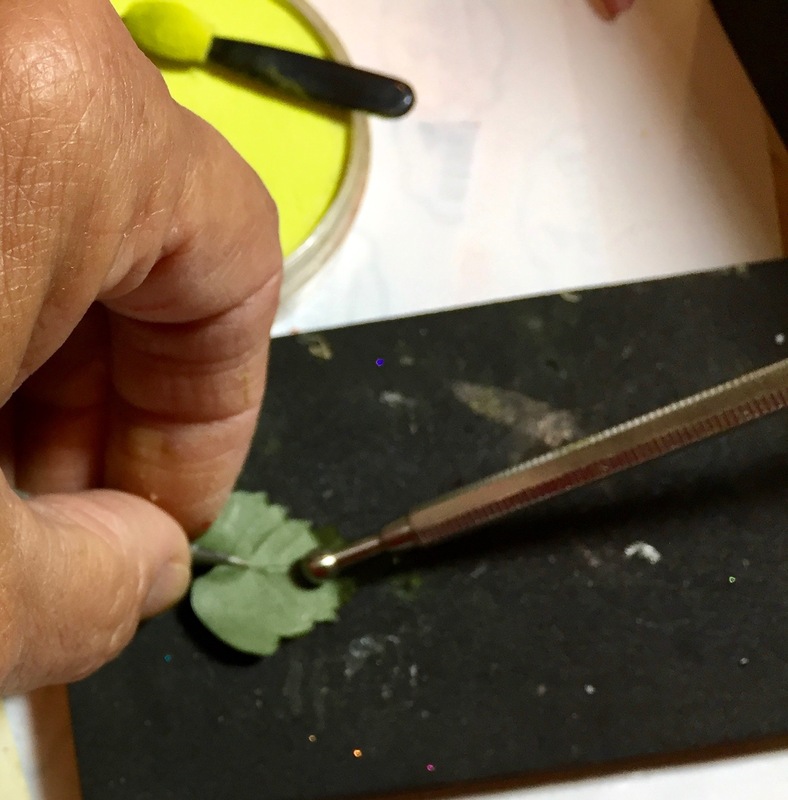 Also, repeat the step above creating vein lines and shaping each leaf. 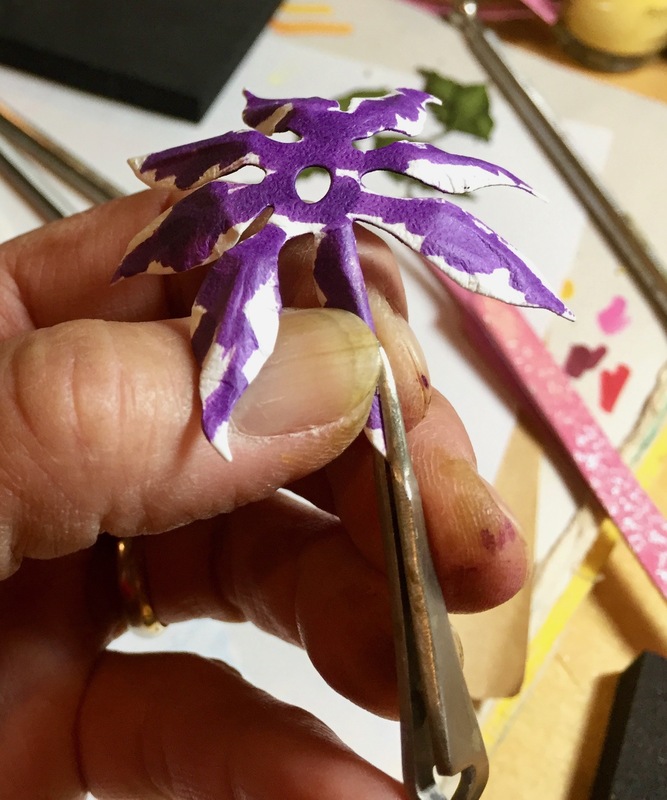 Use the toothpick to place a small amount of glue on the underside center of the 5-leaf piece and adhere it to the green section on your project. 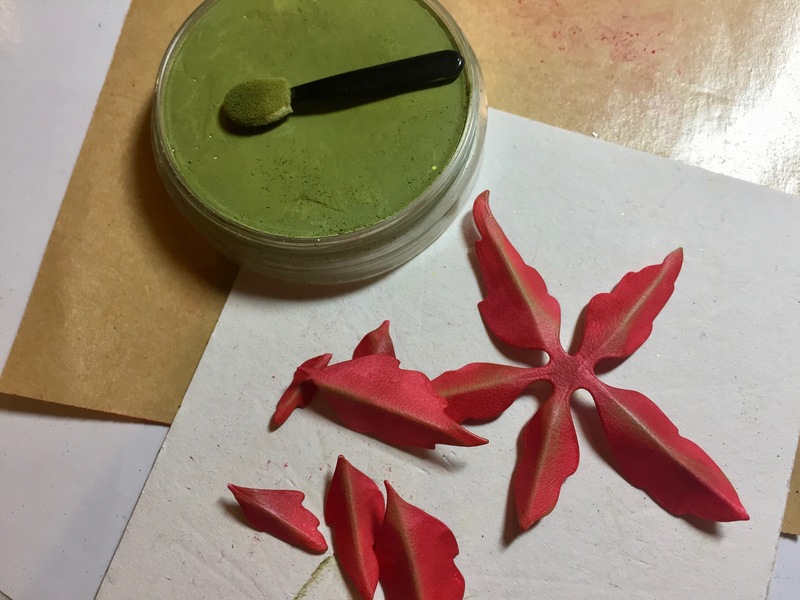 Use the eight single petals to build the Poinsettia. 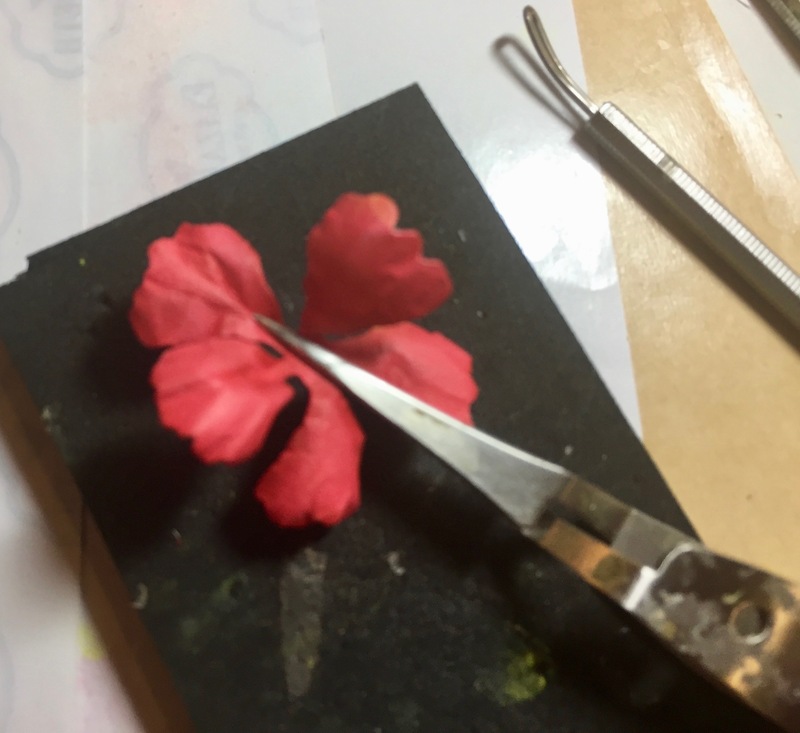 Allow the leaves to dry a bit before you add the “bracts” in the center. 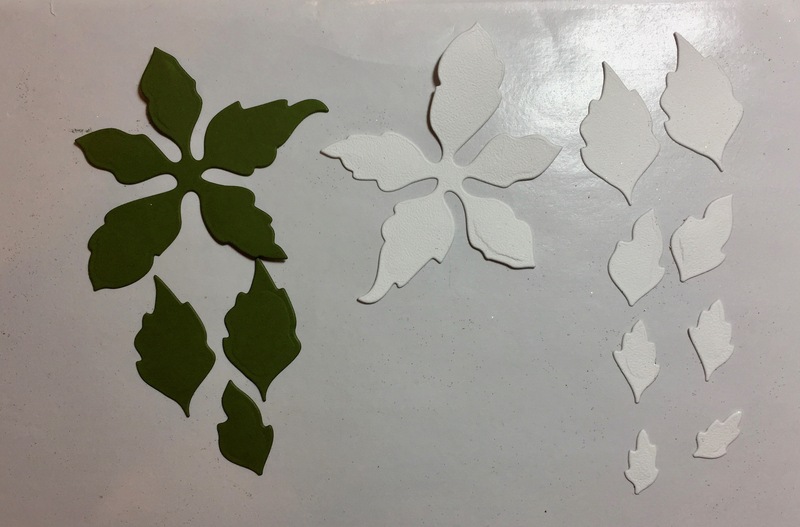 I also die cut pieces to create two Small Poinsettias above the larger one. 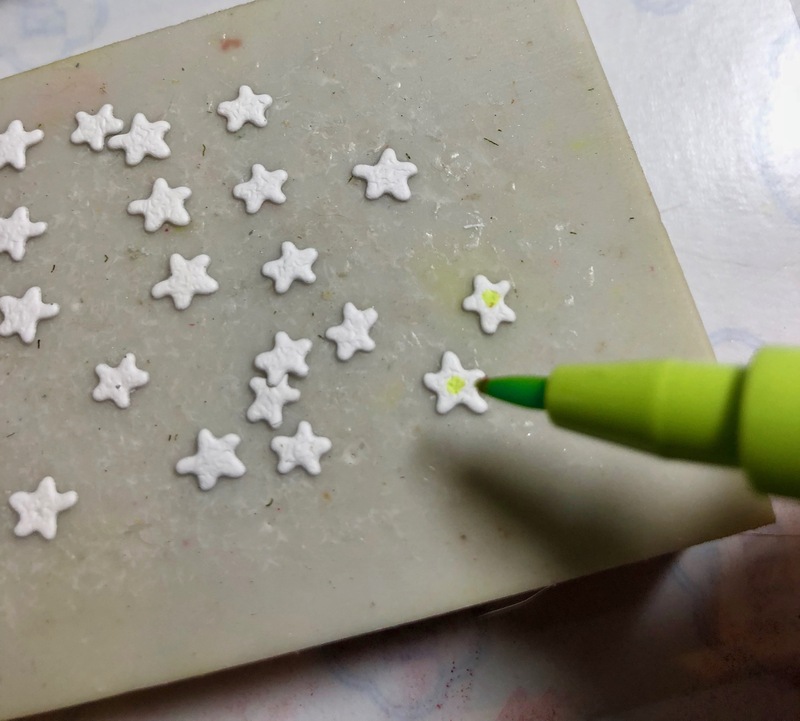 You assemble these the exact same way as above! 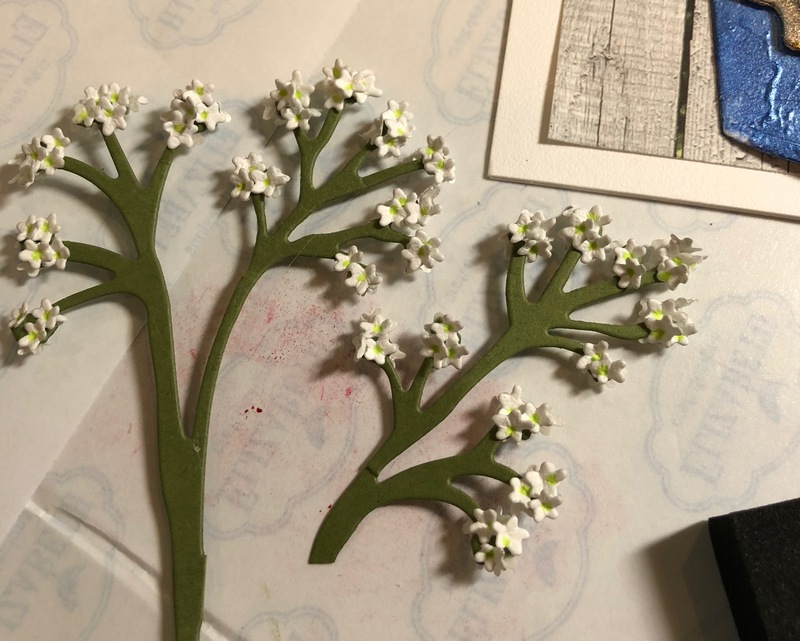 The White Pine boughs were created by adhering Clear Double-side Adhesive paper to green cardstock and die cutting one large branch and two small ones. 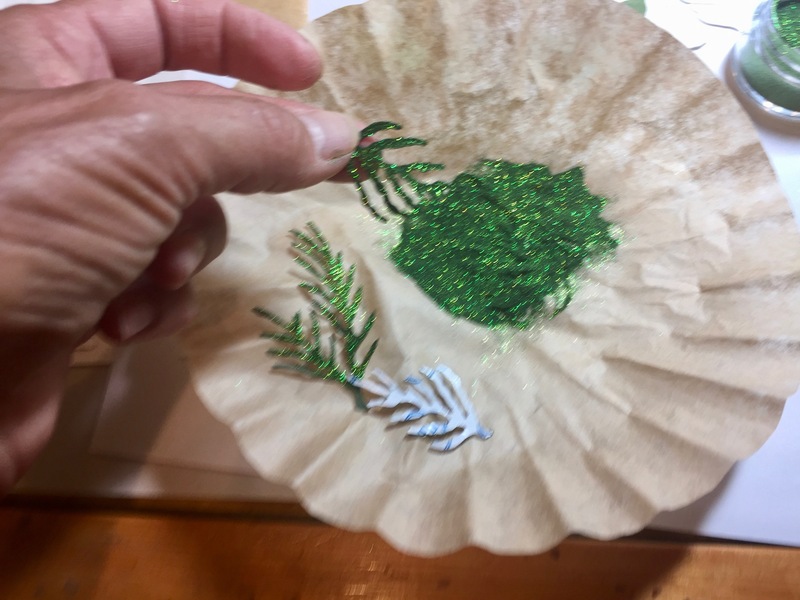 I peeled off the adhesive paper and use Silk Microfine Glitter/Go to Green to give a sparkly affect. 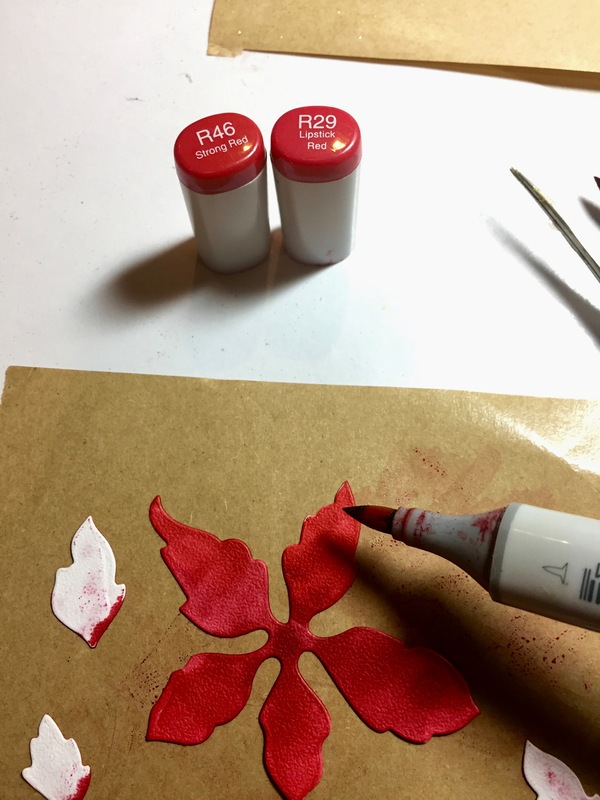 Dip the ends into glue and tuck under the top and bottom of your Poinsettia spray. 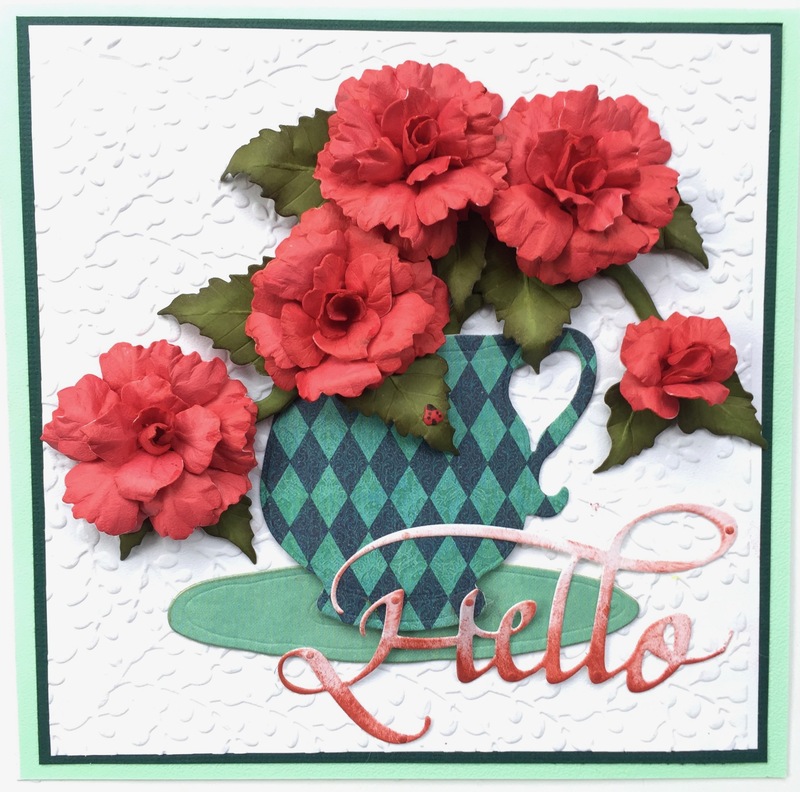 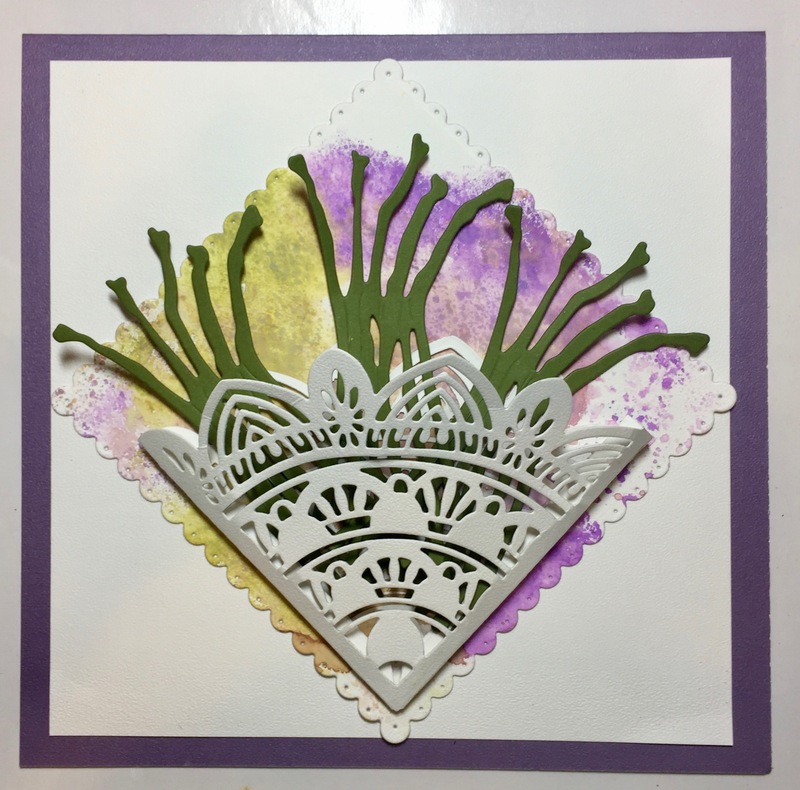 For the “Bracts” which are the actual flower of the leaves, I used USArtQuest Prills in Ribbit & Berry Nice. 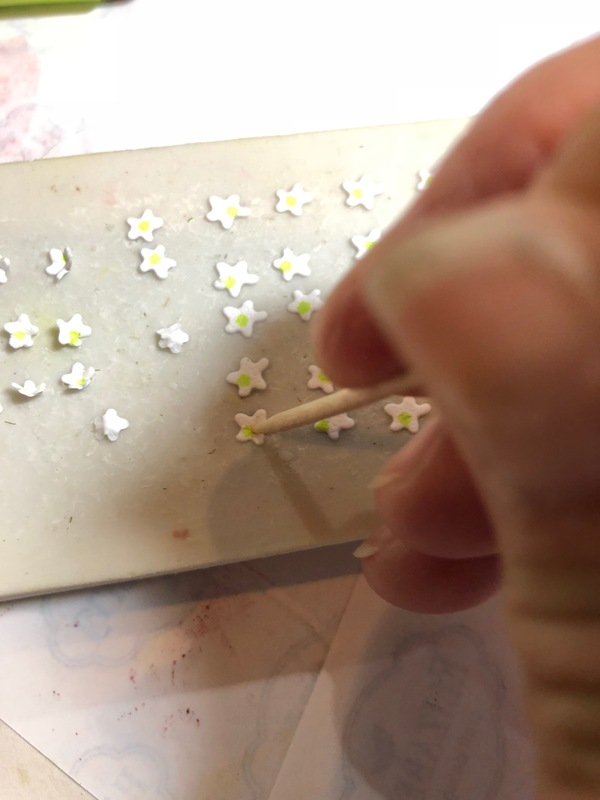 Use a toothpick to apply a small amount of glue in the center of each flower, then sprinkle some Prills into it. 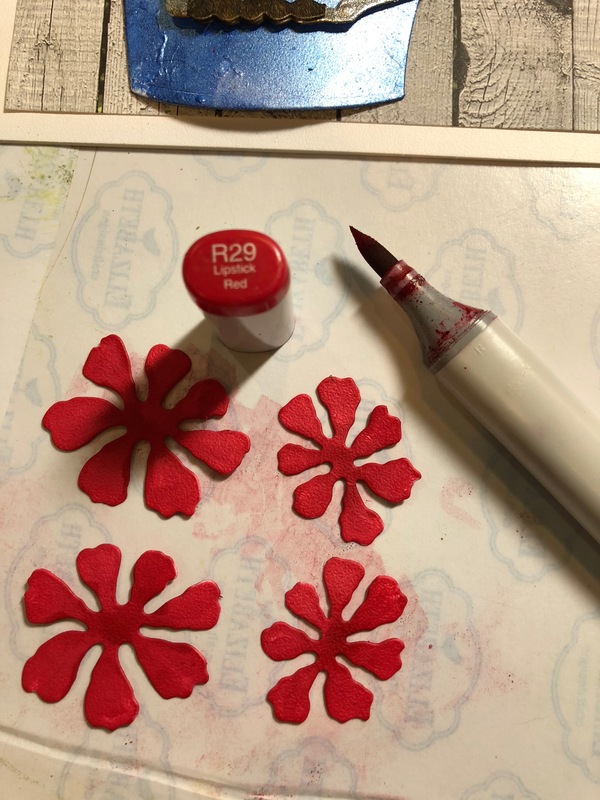 To finish the project, I stamped Suzanne Cannon’s new “merry Christmas” on ModaScrap’s Fishtail Banner. 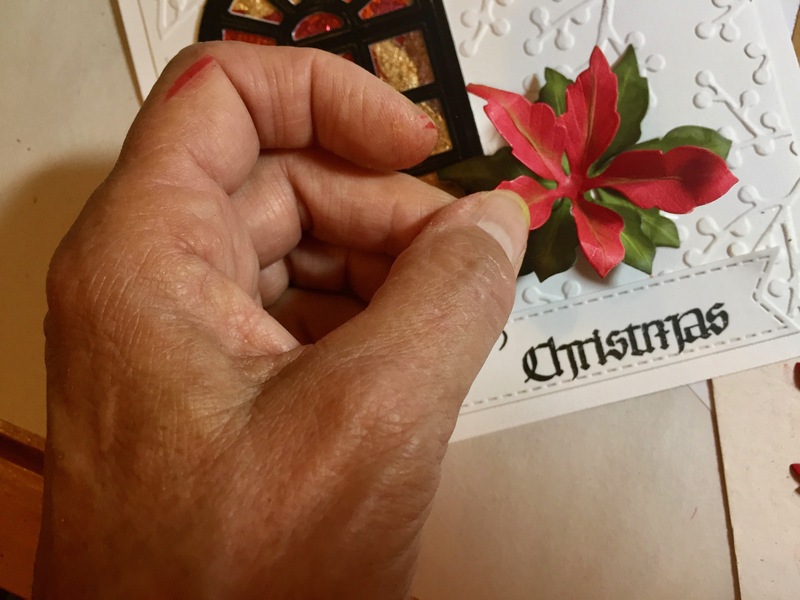 I hope this gets you started on your holiday cards…it sure is coming up quickly! 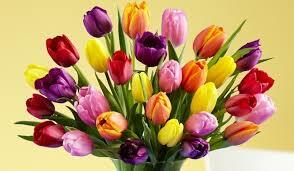 There’s nothing prettier than a bouquet of Tulips for Spring! 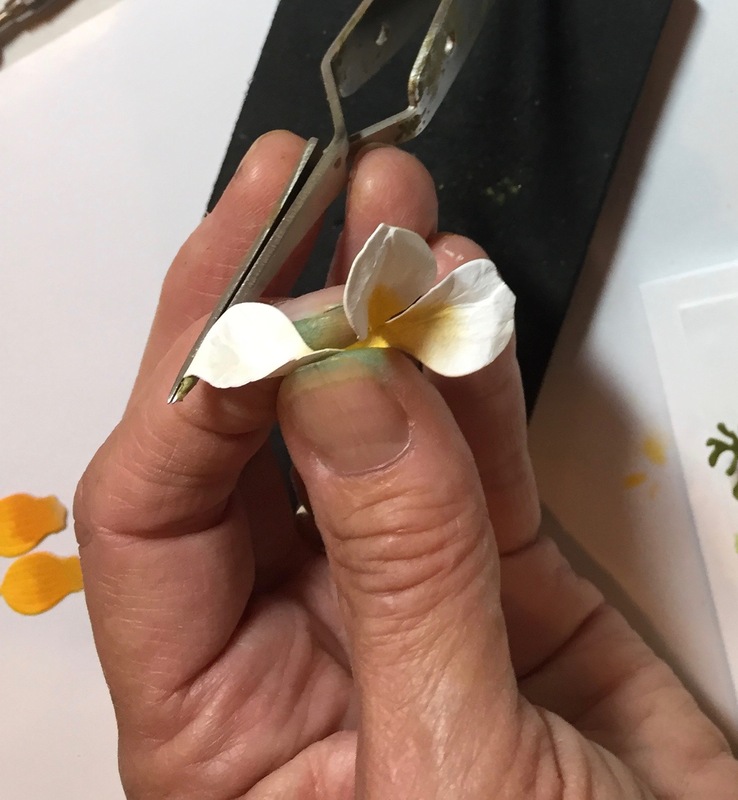 I’ve never seen the tulip fields in The Netherlands, but when we lived in the Pacific Northwest, the Skagit County Tulip Festival was a sight to behold. 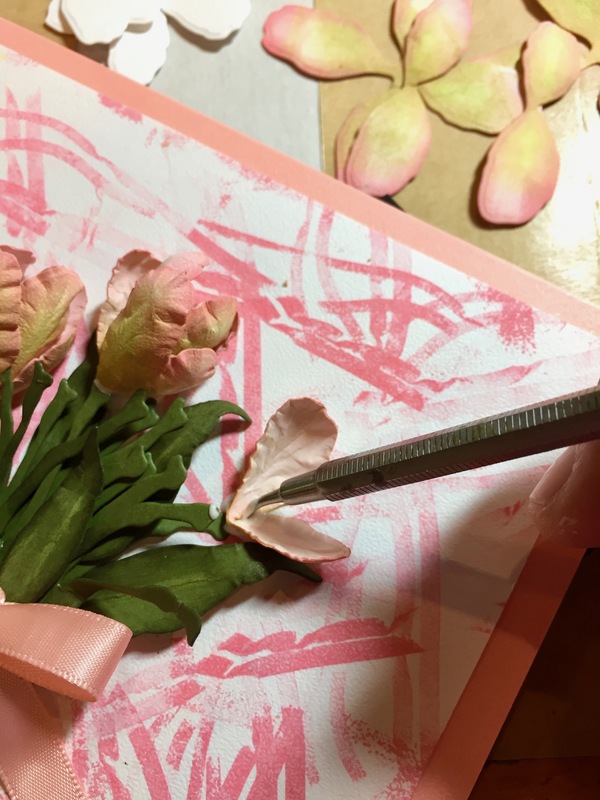 Tulips are easy to construct and if you want to replicate the beautiful colors from Mother Nature, there are a few tricks that I can show you so you can achieve natural looking blooms. 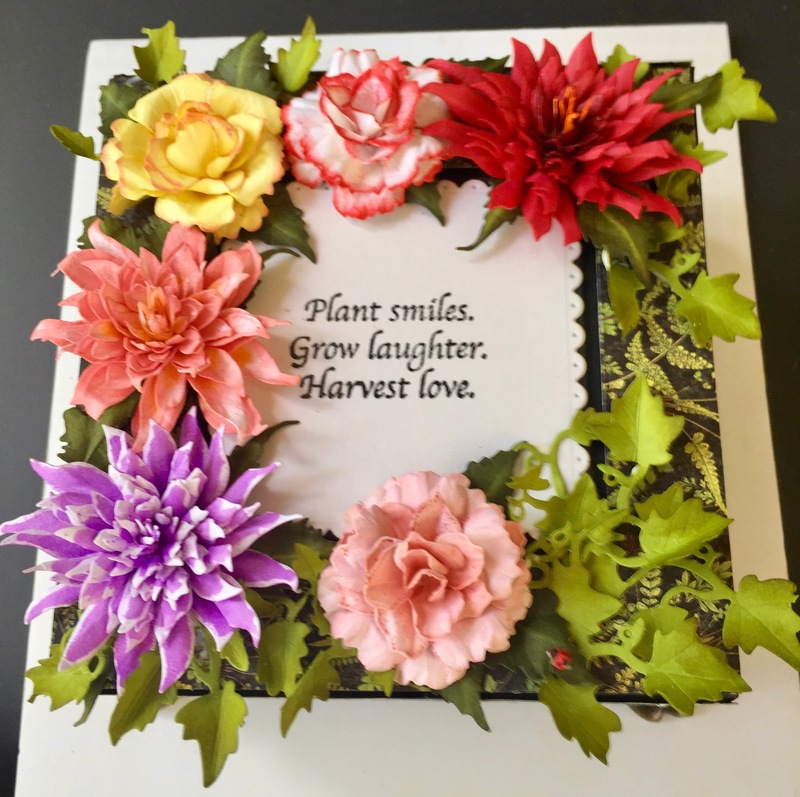 I cut a 6″ x 12″ Soft Finish Cardstock (Pink Peach) and scored into a 6″ x 6″ size top-fold card base. 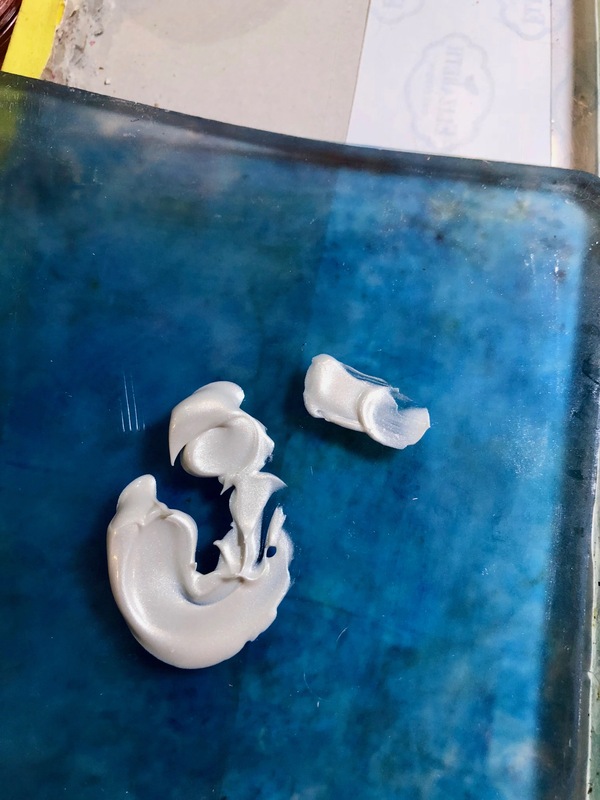 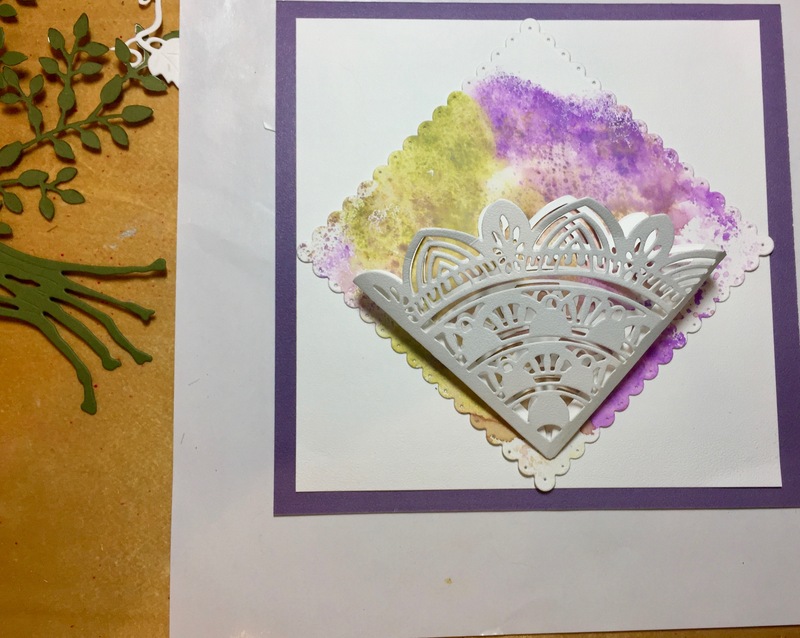 The background, done in White Soft Finish 85 Lb cardstock was cut to 5 1/2″ x 5 1/2″ and I created a design by wrapping a rubber band around a brayer and rolling it in Distress Oxide/Worn Lipstick. 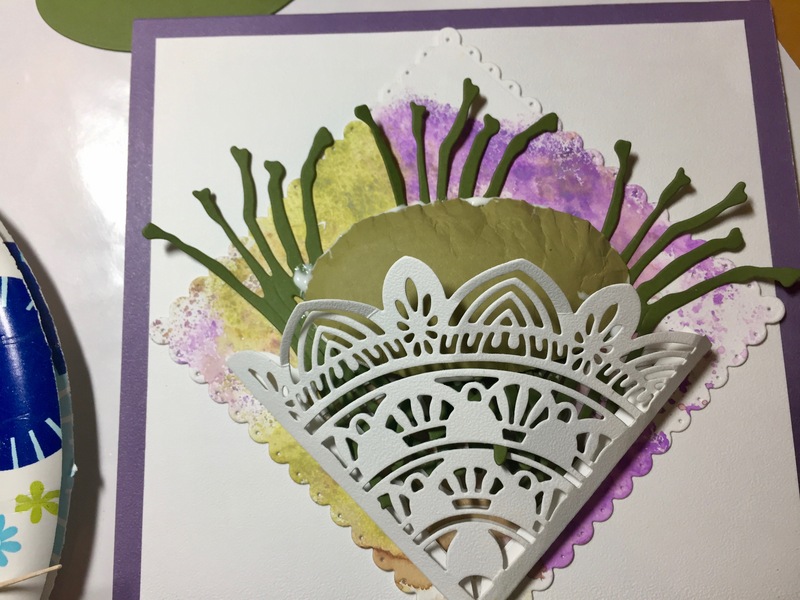 I also die cut Els van de Burgt Studio Dotted Scallop Squares in the two largest sizes to create a frame for the bouquet. 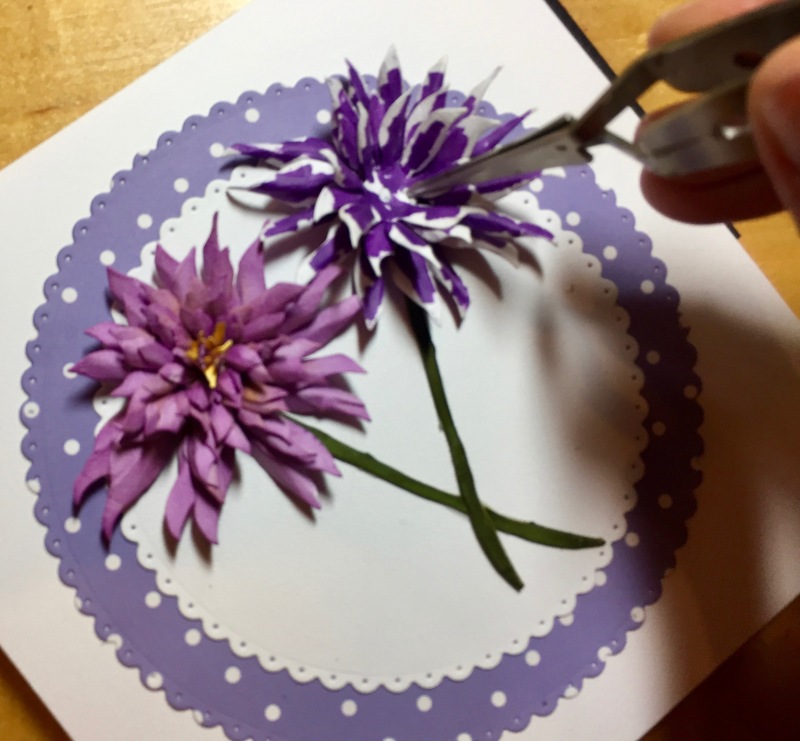 To create the look of a lush bouquet, I cut a piece of ribbon and secured it down onto my background with a Glue Dot, then die cut the Garden Notes Bouquet Stems 3 times, cutting the stems apart with small scissors for a loose look. 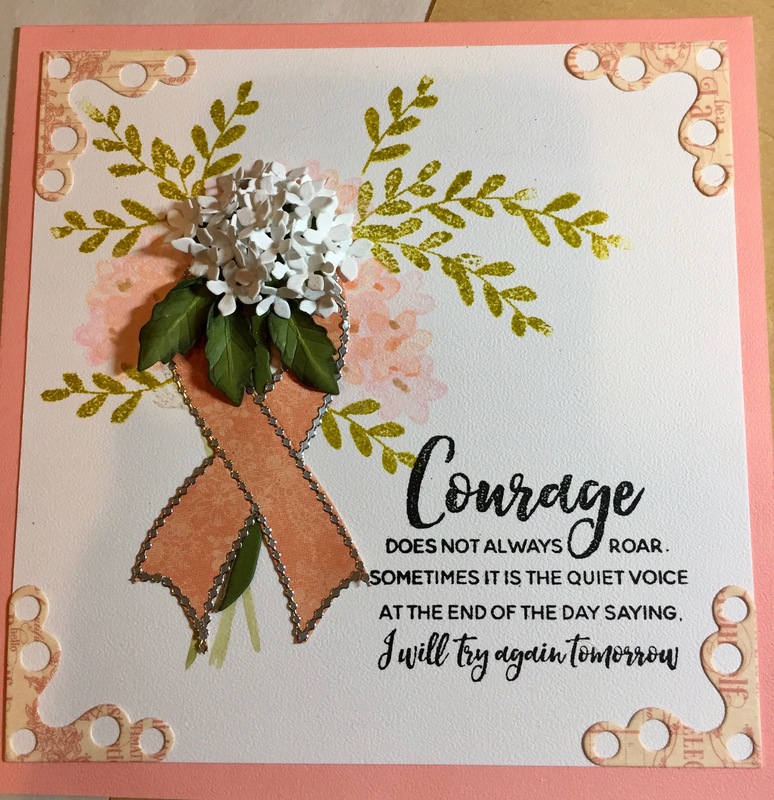 I also added some of the leaves at this time before adding any of the flowers, and tied the ribbon into a bow. 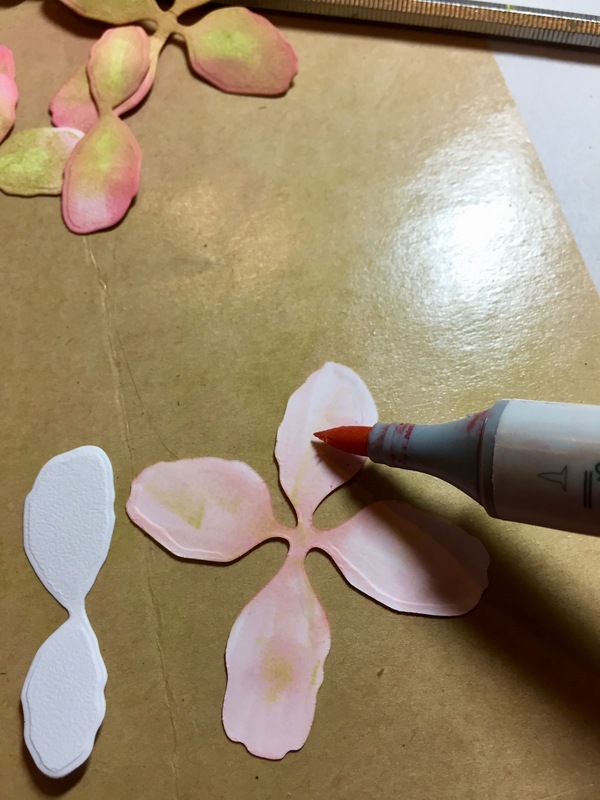 The Garden Notes Tulip 2 has two petal pieces; 4 petals and 2 petals. 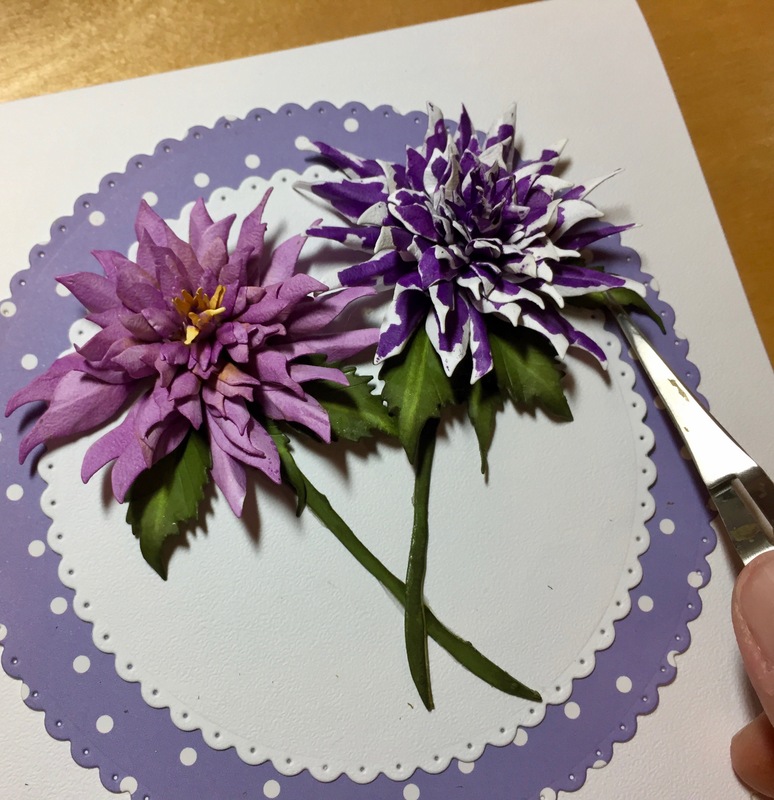 For this project I cut each one 10 times, but your bouquet can be as big (or small) as you like. 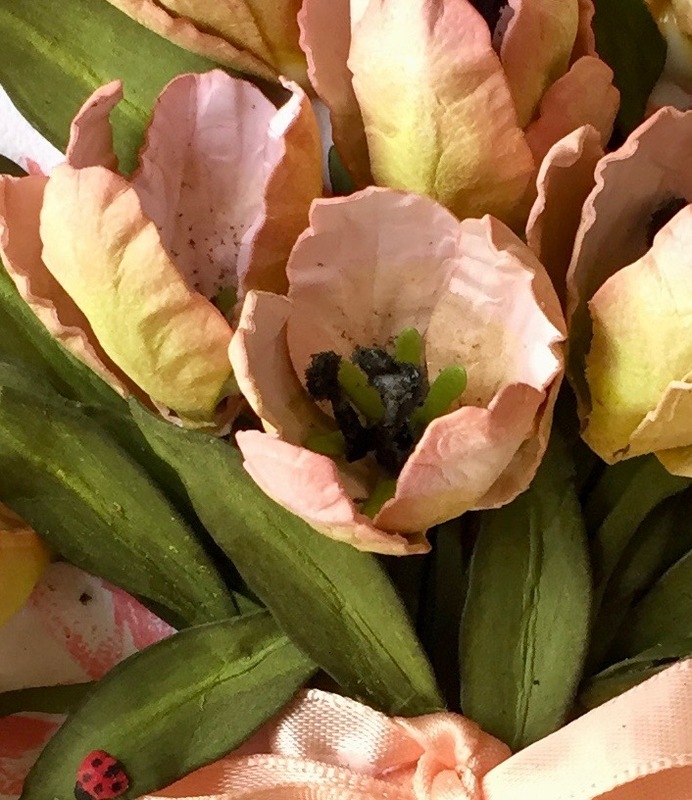 I chose to re-create a Tulip variety that I love–pinks with hints of bright green. 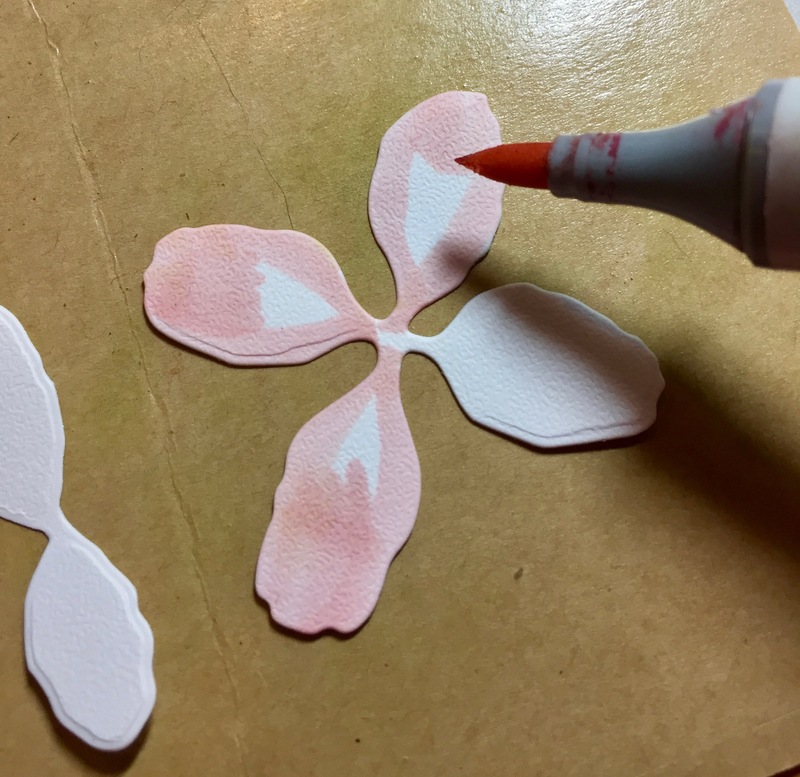 To do this I use a combination of products: Copic Marker/RV11 and Distress Oxide Inks inWorn Lipstick and Peeled Paint. 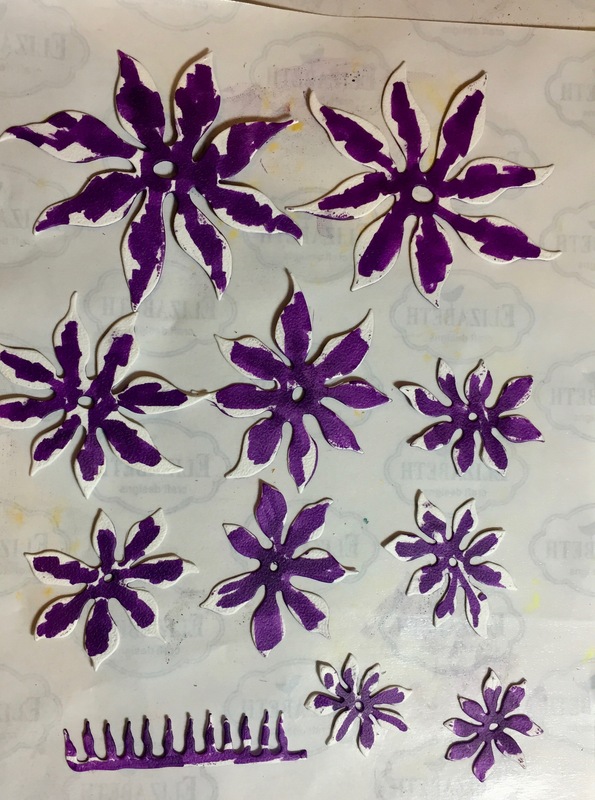 Using the marker, I colored the petals, leaving some white on the front, but completely coloring the underside. 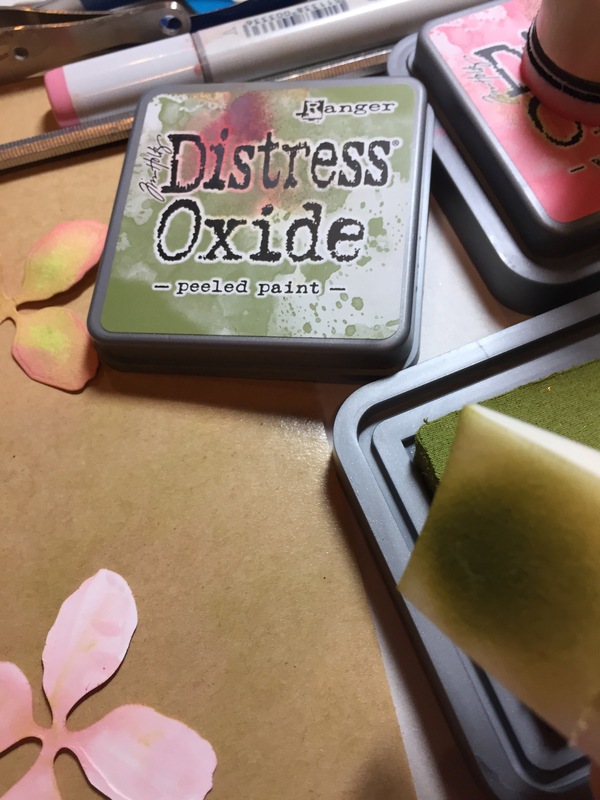 Next, I used Distress Oxide Ink Peeled Paint and a cosmetic sponge to dab the green shade in the center. 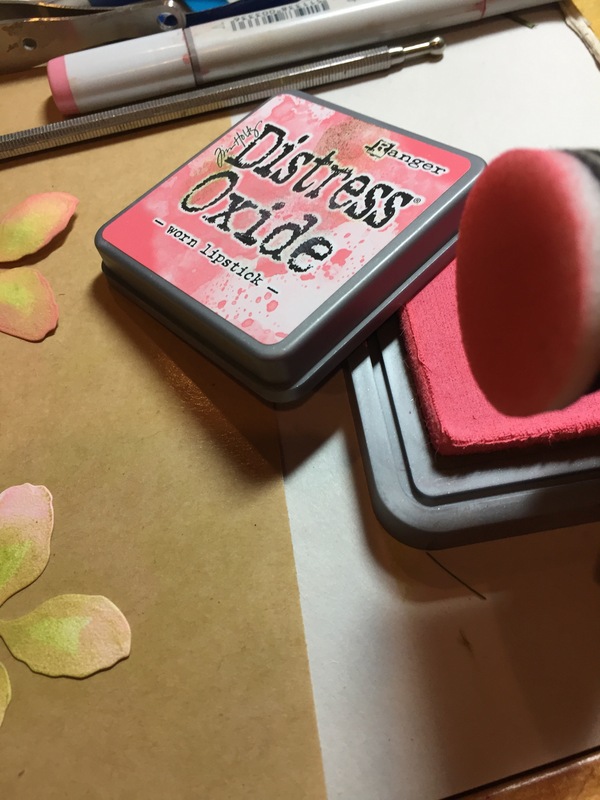 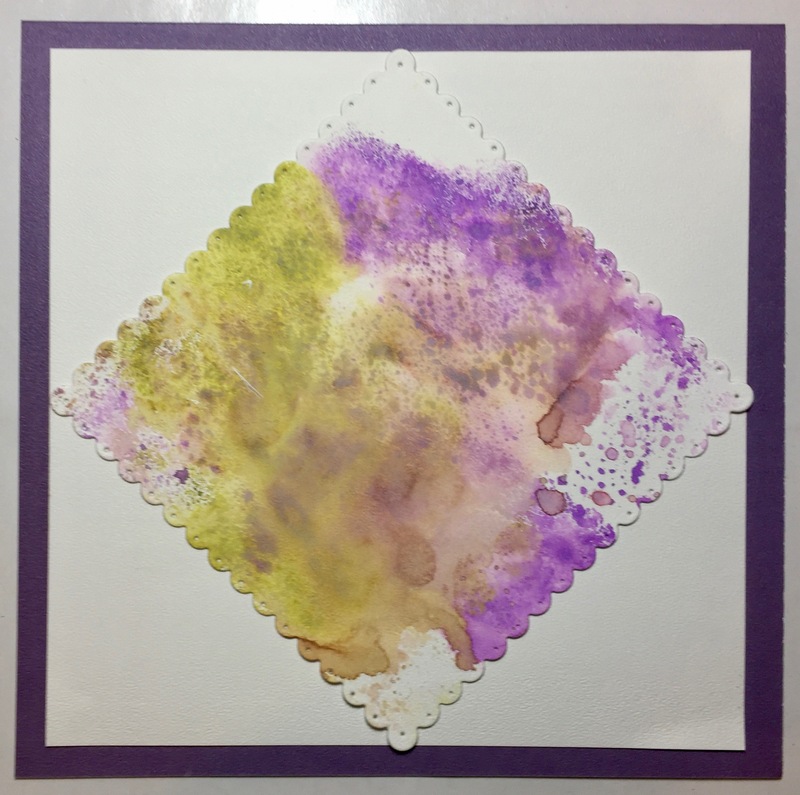 Finally, I use a dauber and sponged around the outside edges with the Distress Oxide Ink Worn Lipstick. 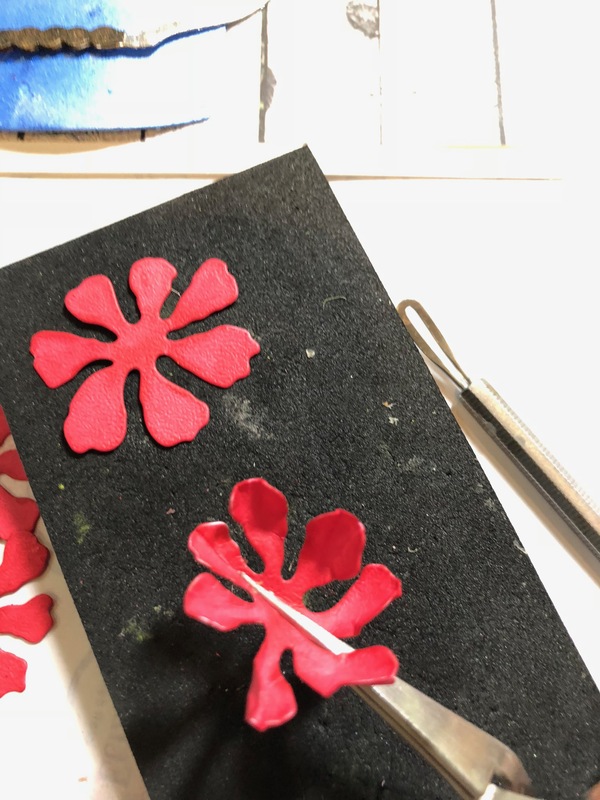 Place the petals right-side-up on the Molding Mat, and use the small Loop Tool to shape them. 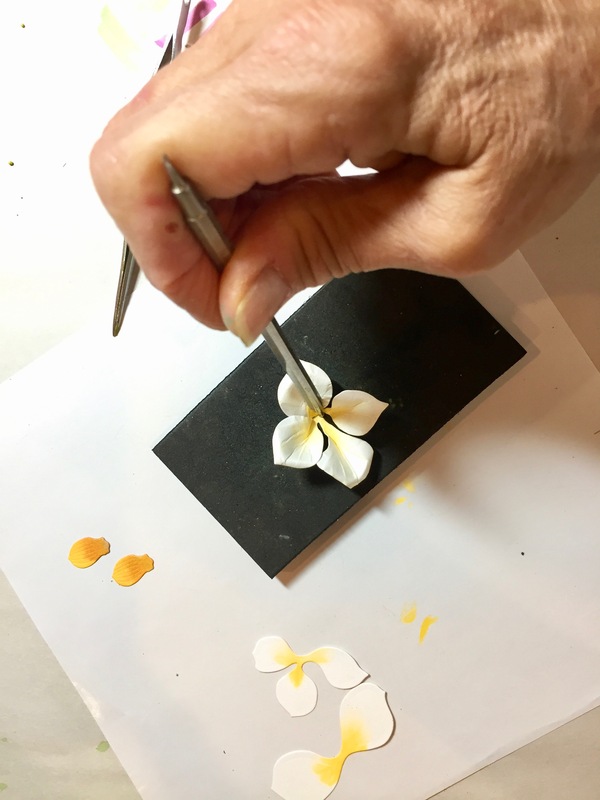 Turn the petal over wrong-side-up and repeat this shaping, doing a 3-stroke technique pressing down each petal to get the detail characteristic of the petal. 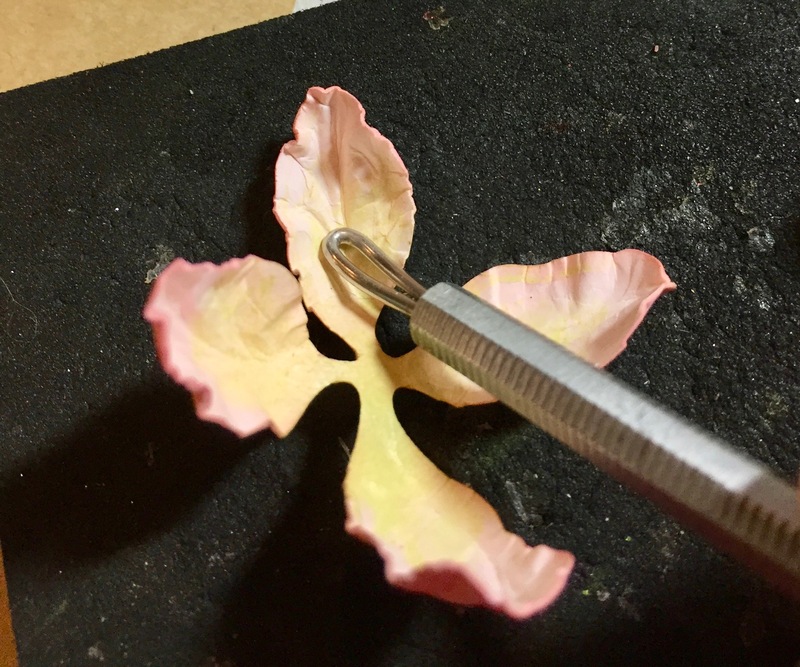 Finally, use the medium ball stylus to press the outer edge of the petal so it rolls inward. 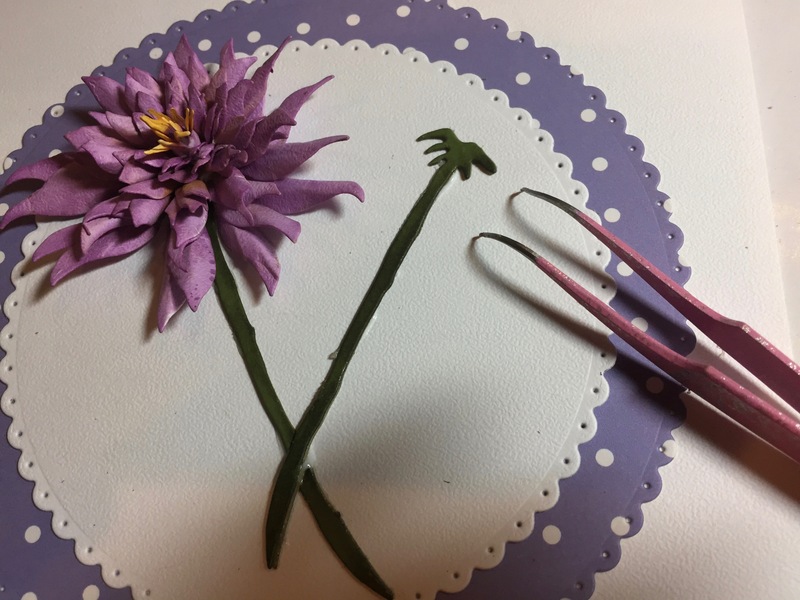 Next, use the tweezers to pinch the stem edges and finally, with the petals on the Molding Mat, use the small ball stylus to cup the center. 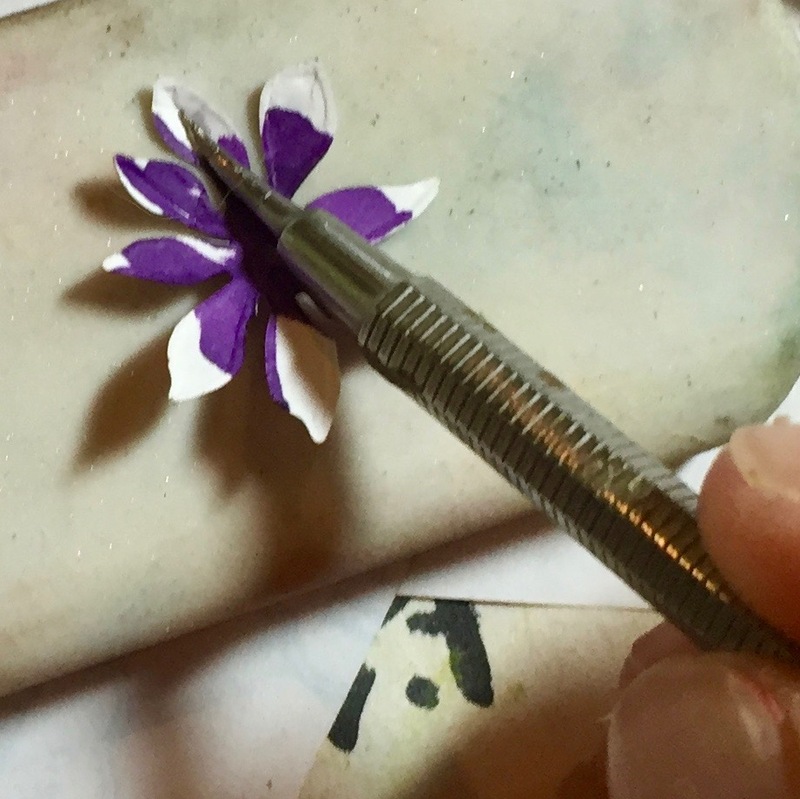 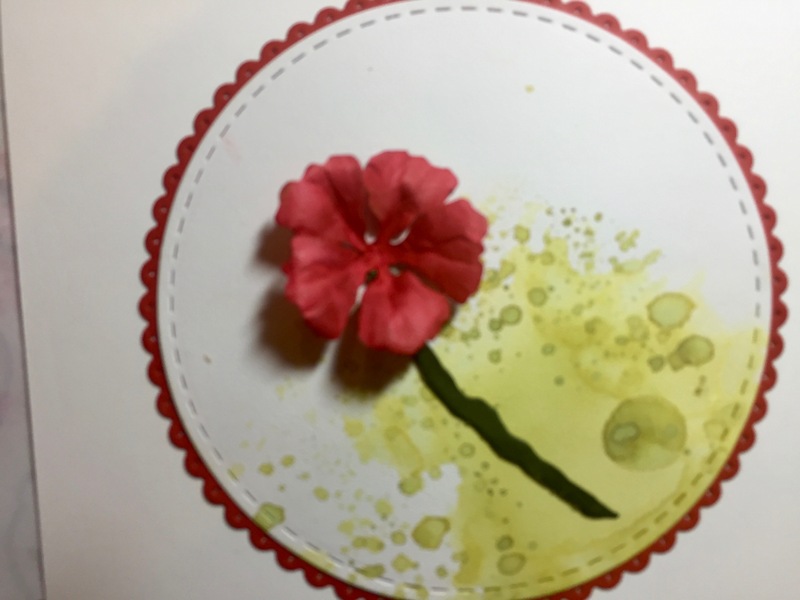 Use a toothpick to apply glue to the 2-Petal piece and place it directly onto the project. 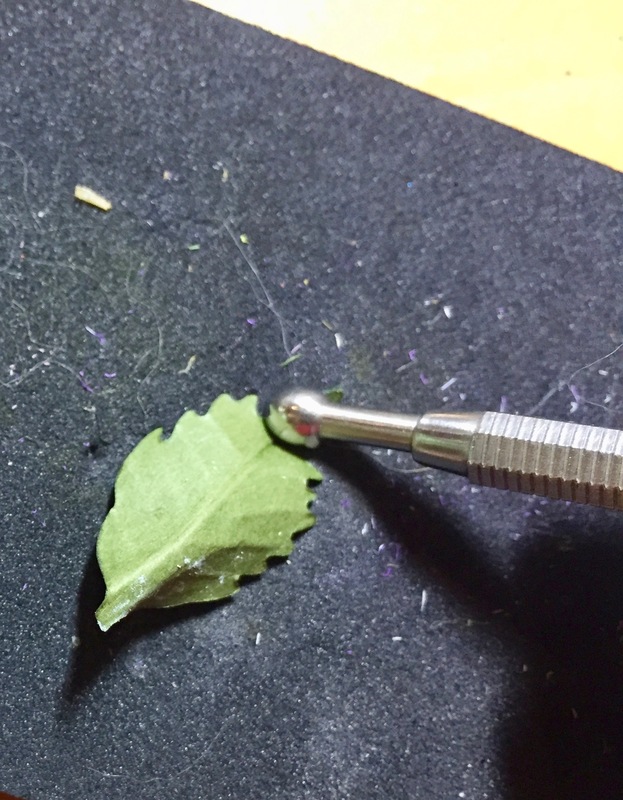 Continue to hold in place until the glue grabs and see photo below how I use the Leaf Tool to apply pressure. 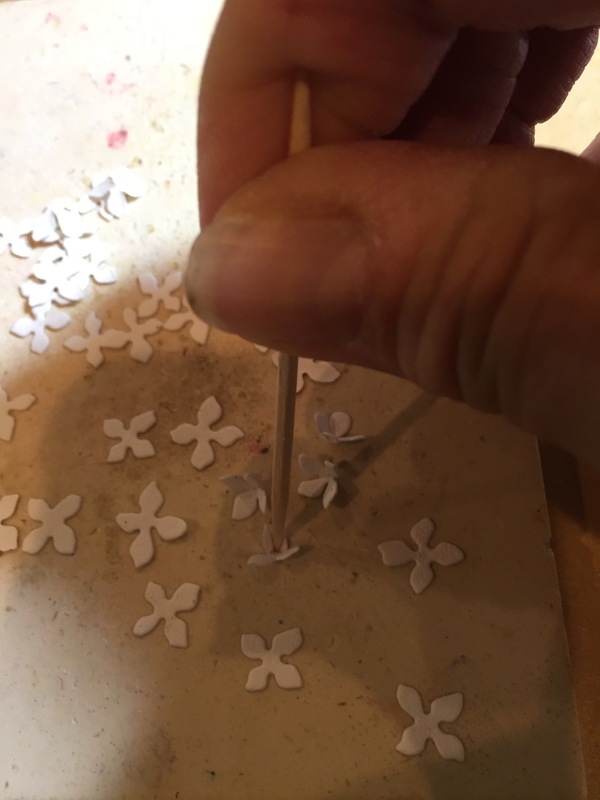 Next, use a toothpick to apply a small amount of glue to both sides of one of the petals on the 4-Petal piece. 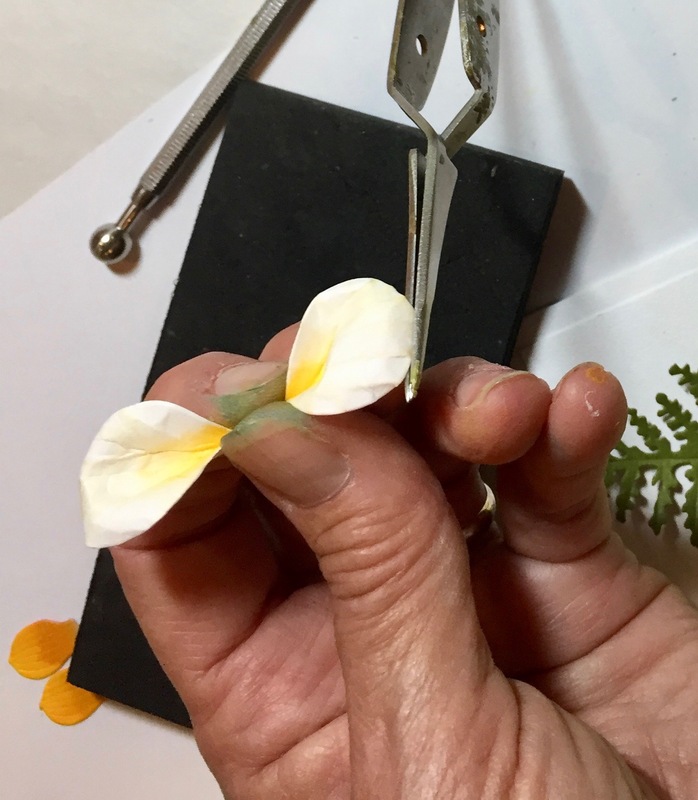 Bring two petals up and hold in place. 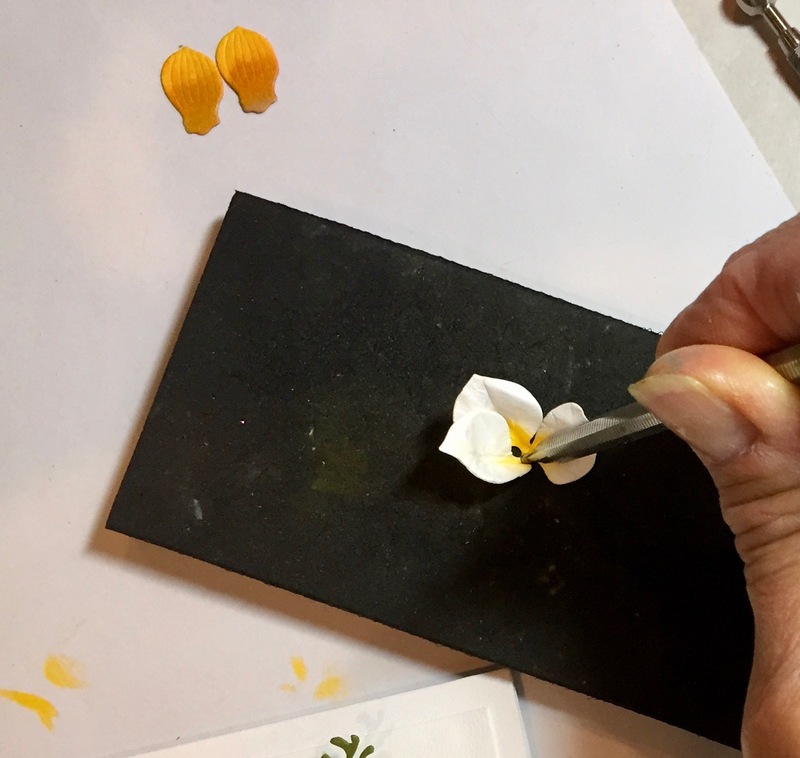 Finally, dip the bottom of the 4-Petal piece into the glue and place it on the 2-Petal piece, making sure that the one petal not secured is set between the 2-Petal piece. 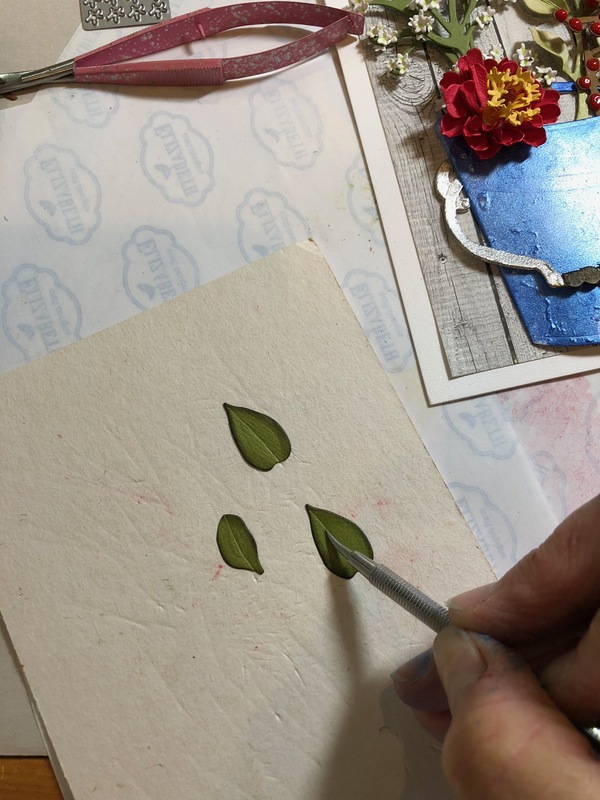 After you’ve finished creating all the Tulips you want in the bunch, add a few more leaves. 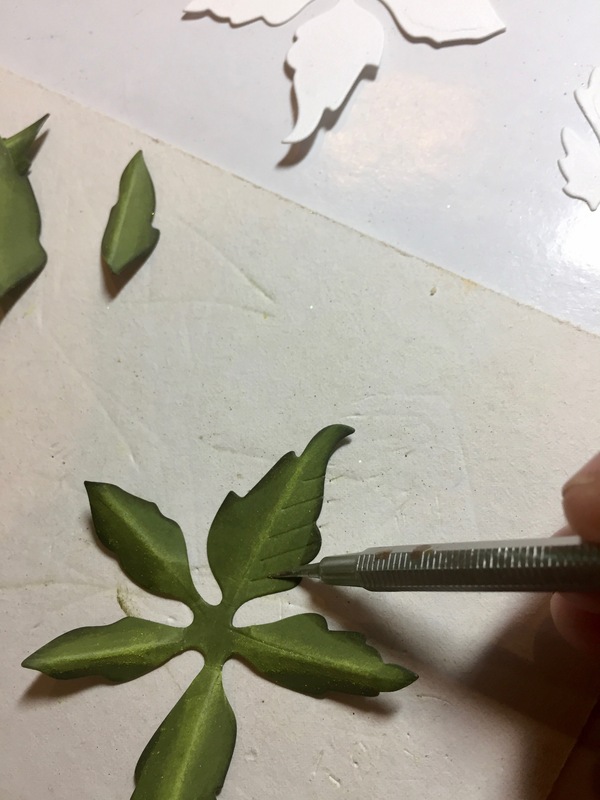 The leaves are basically done how I do all my leaves, except Tulip leaves don’t have veins, but rather character lines running down it. 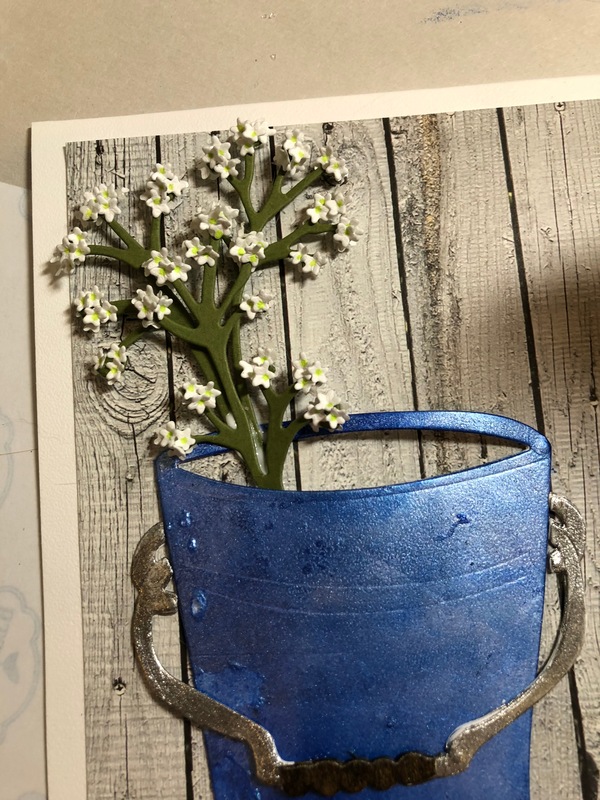 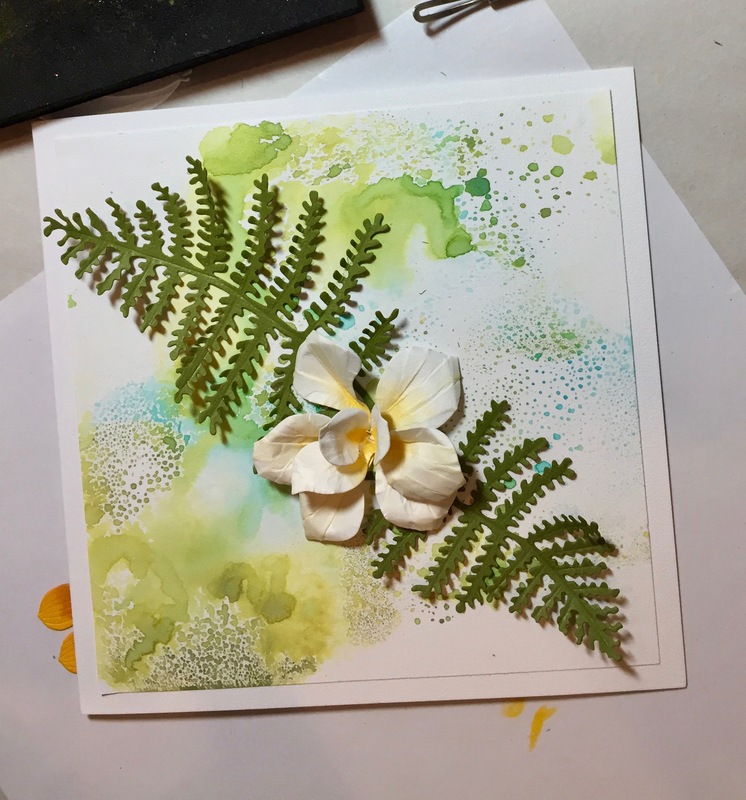 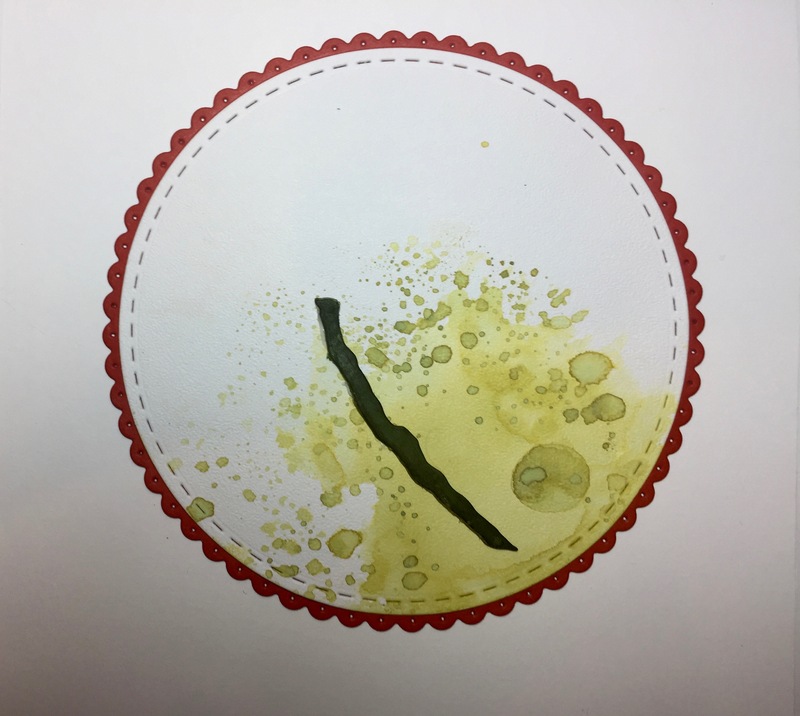 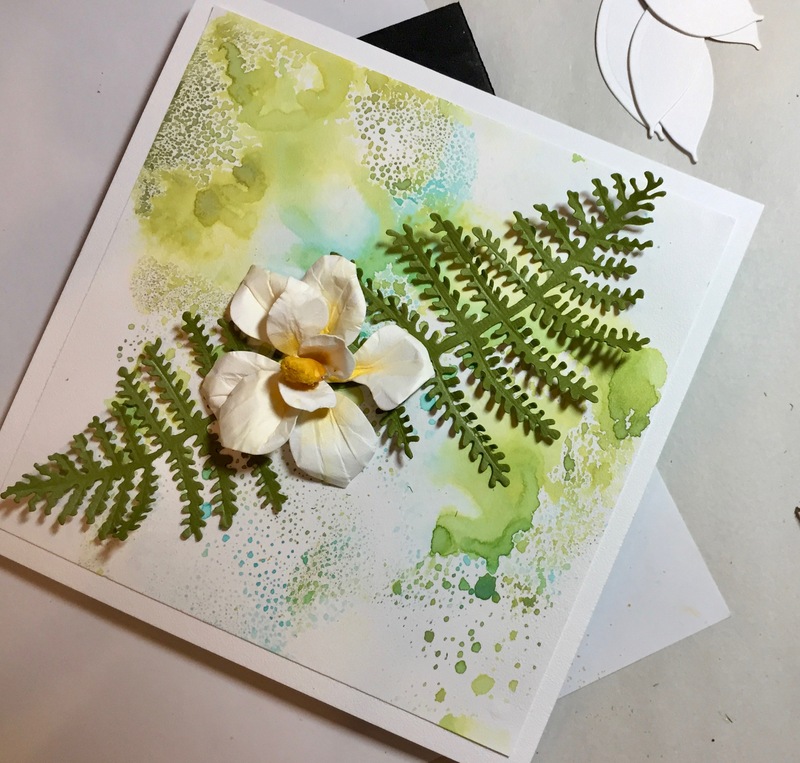 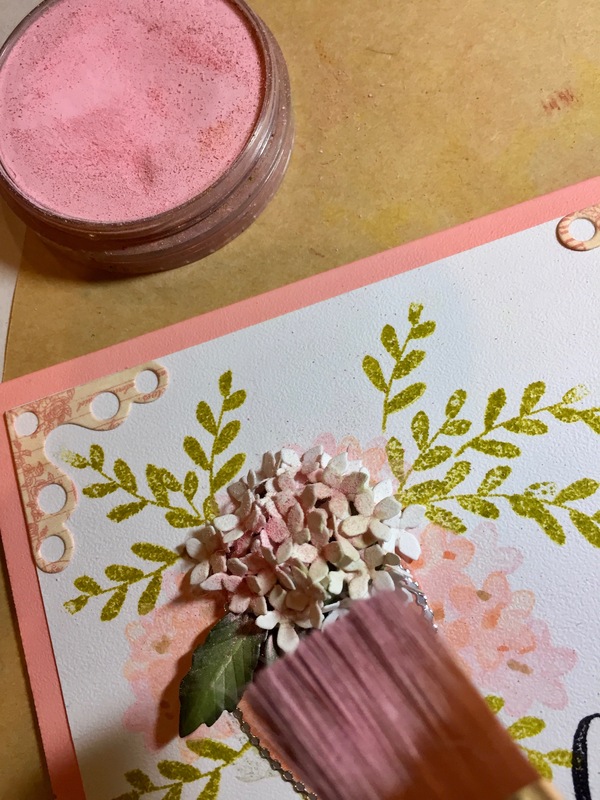 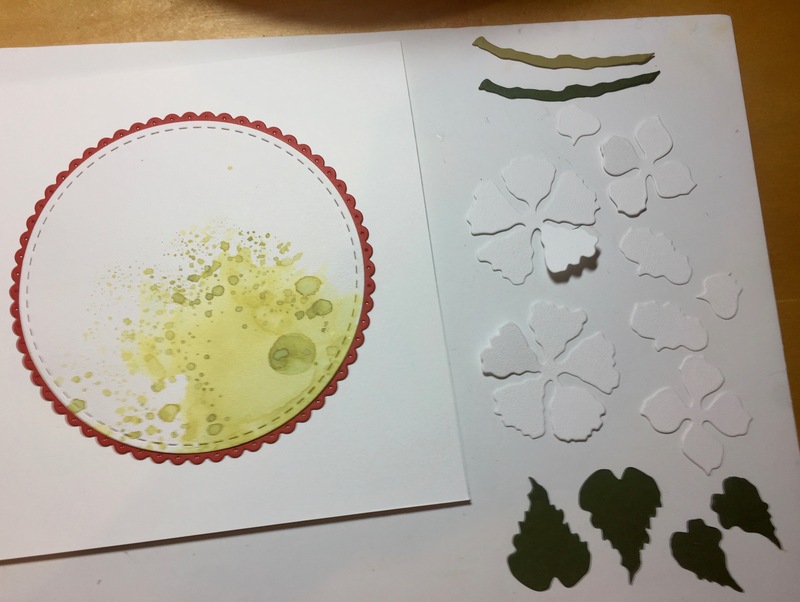 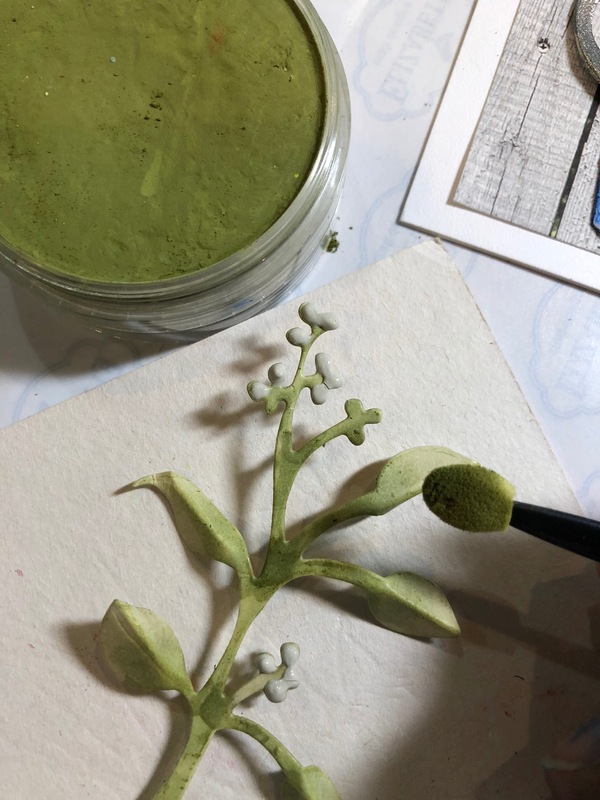 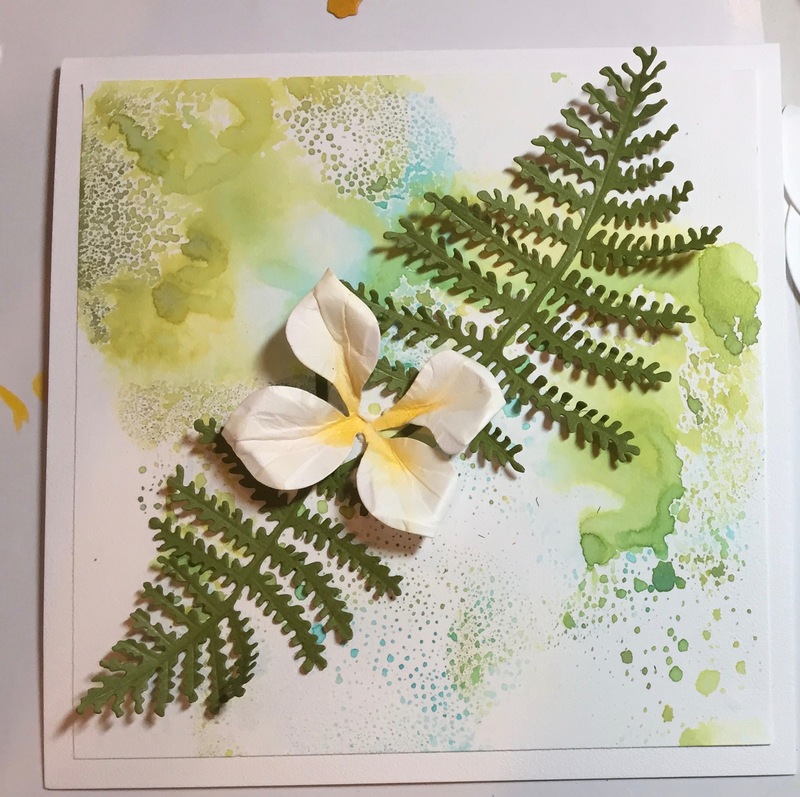 I used Distress Ink/Forest Moss and a dauber to edge the medium green card stock, then I place the leaf, right-side-up on the Leaf Pad and use the Leaf Tool to stroke several times down the leaf. 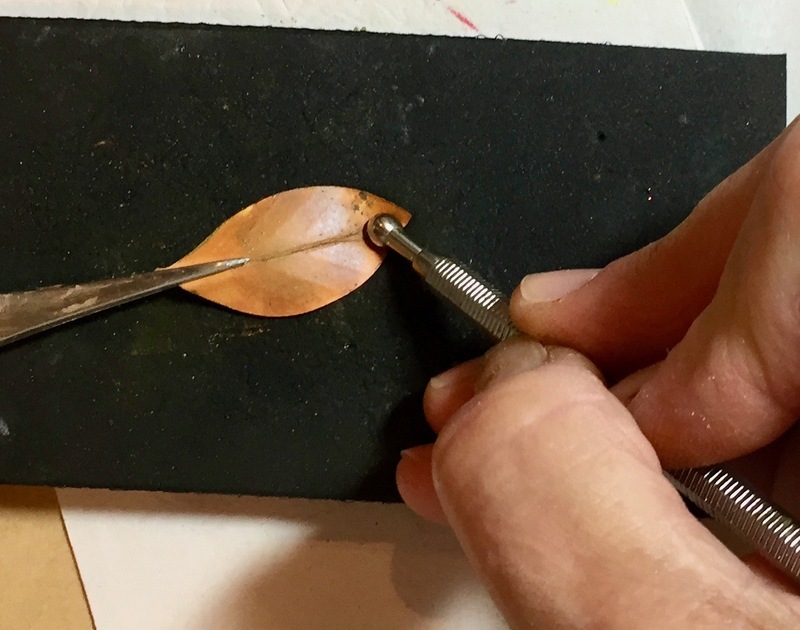 Then, I turn the leaf over, wrong-side-up and using the Leaf Tool, draw a line down the center. 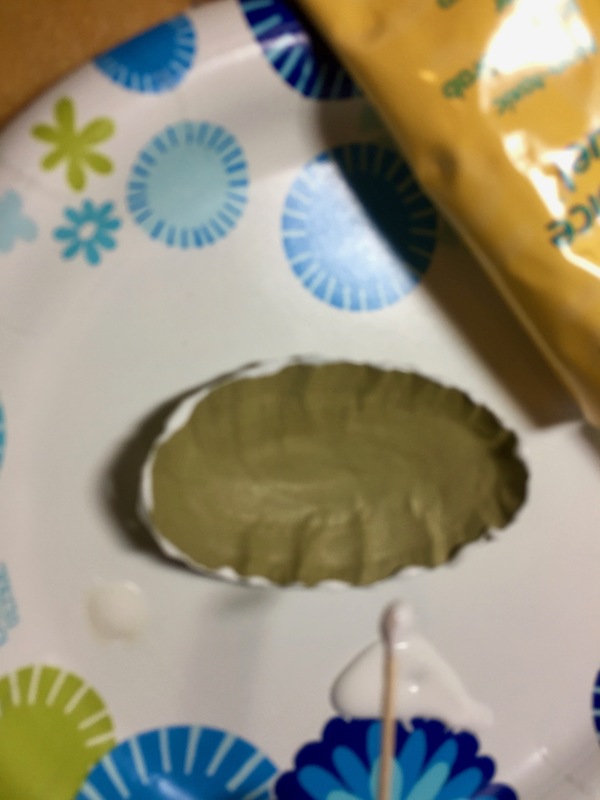 I bend the leaf along this line, backwards and use PanPastels/Bright Yellow Green and a cosmetic sponge to highlight this center line. 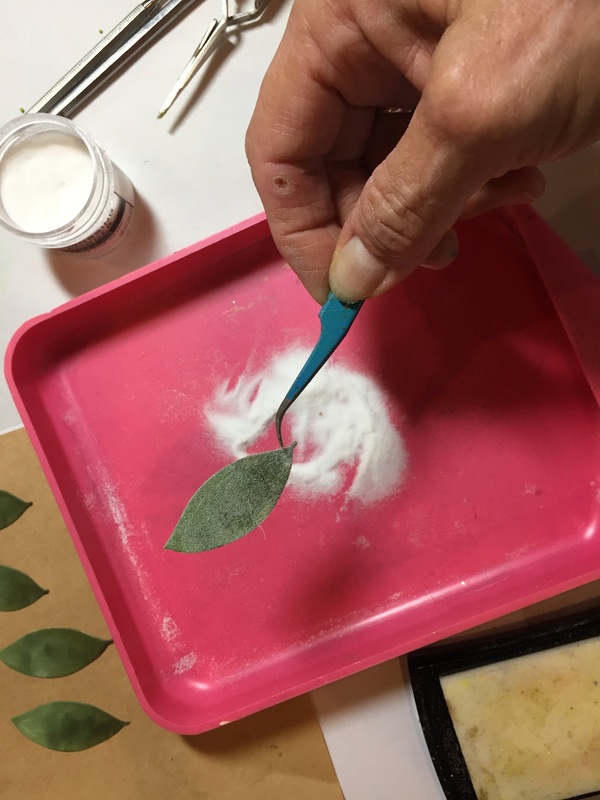 Bend the leaf back and use tweezers to pinch the stem end. 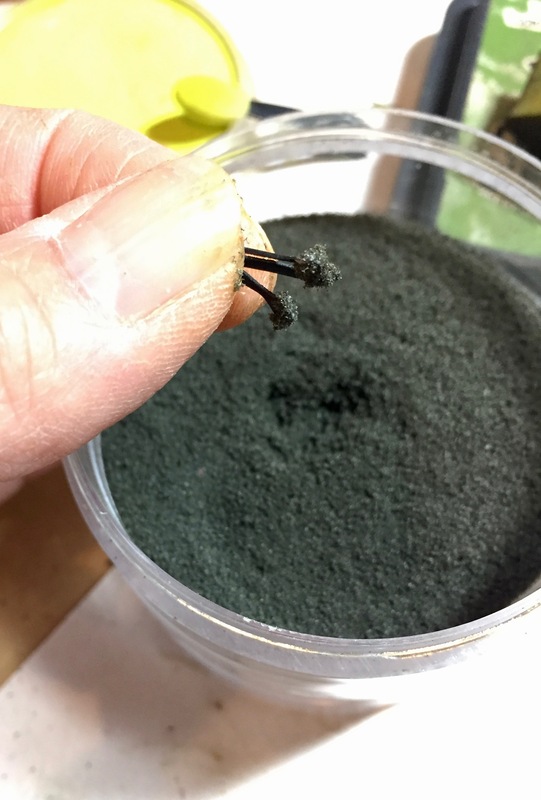 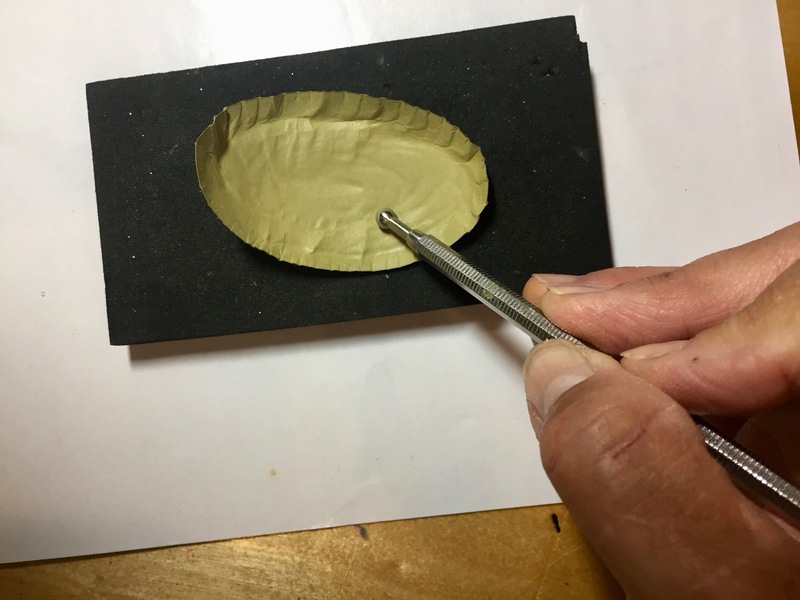 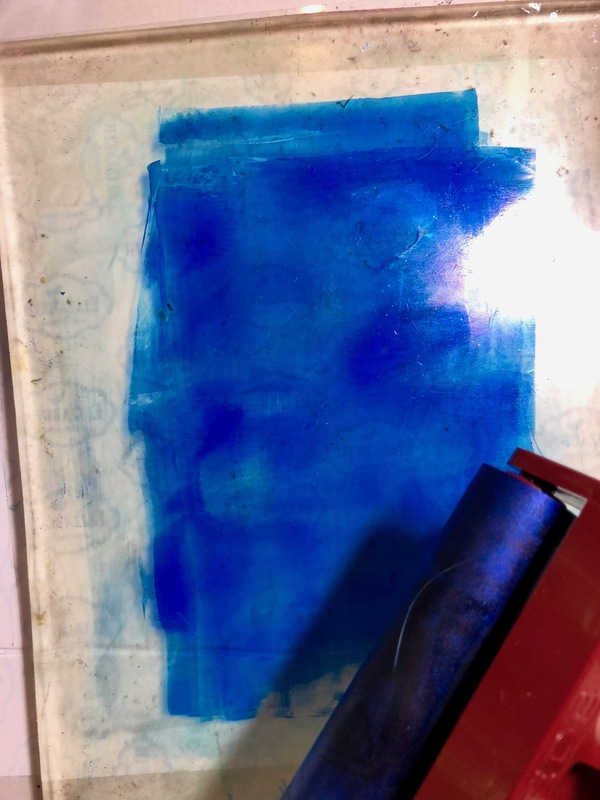 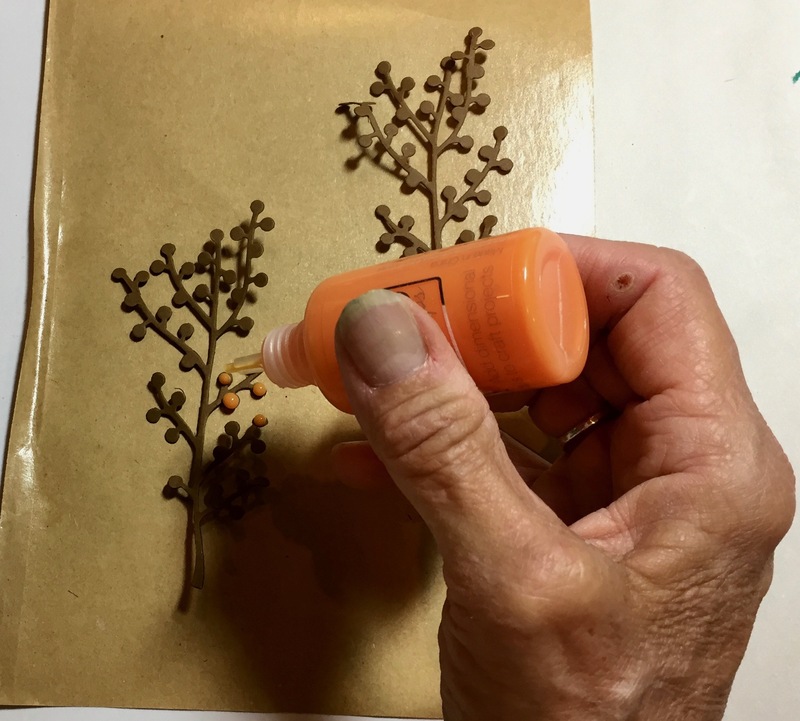 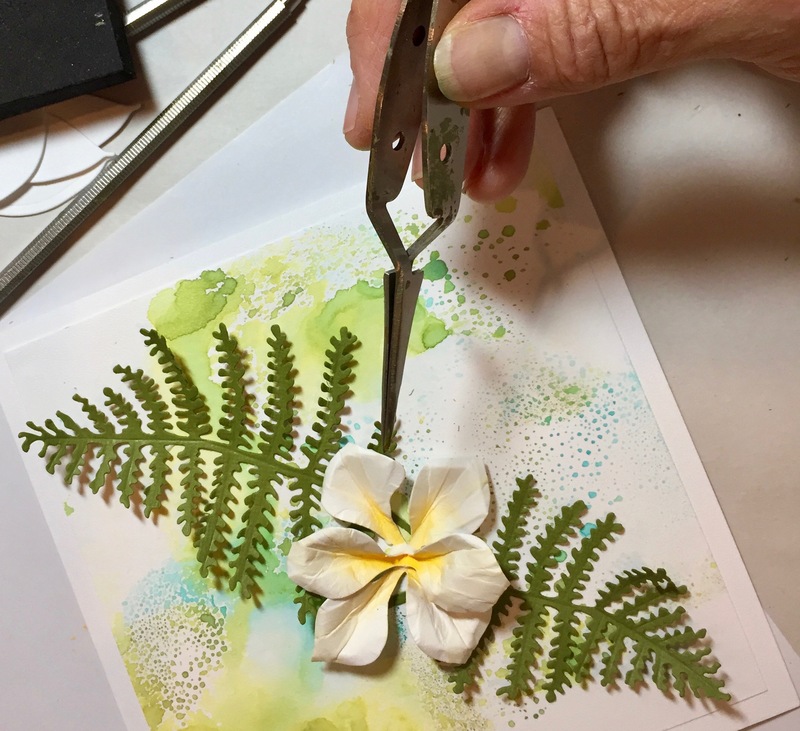 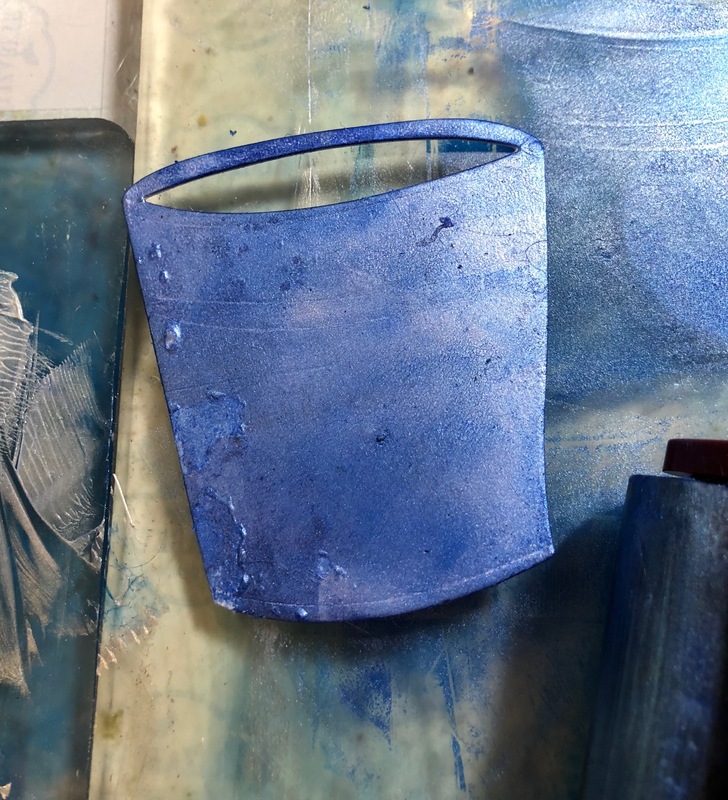 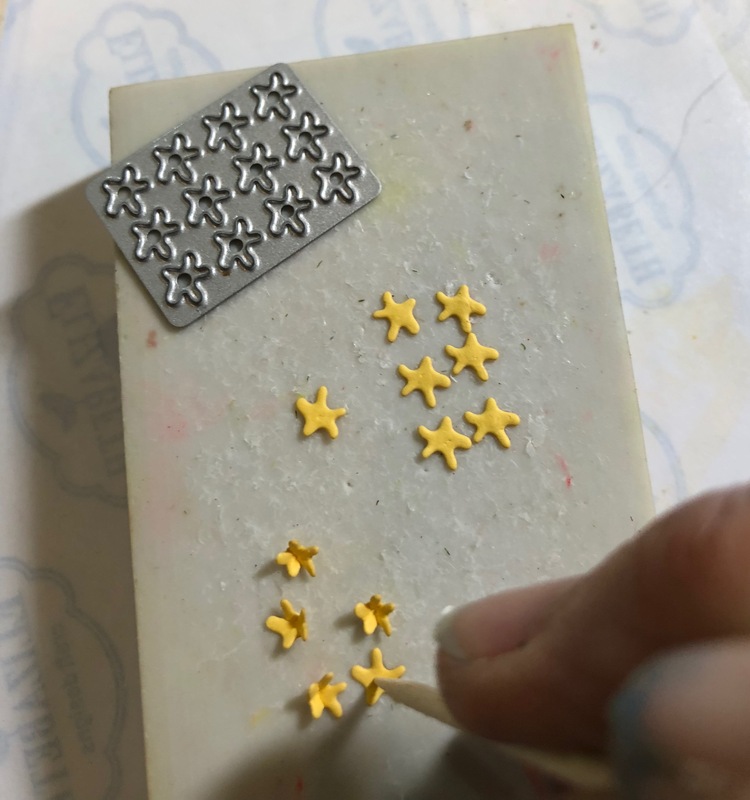 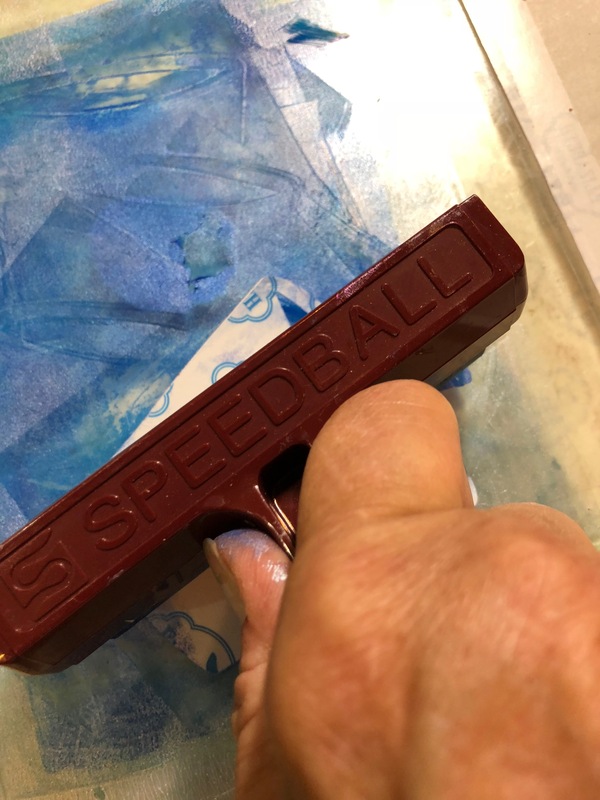 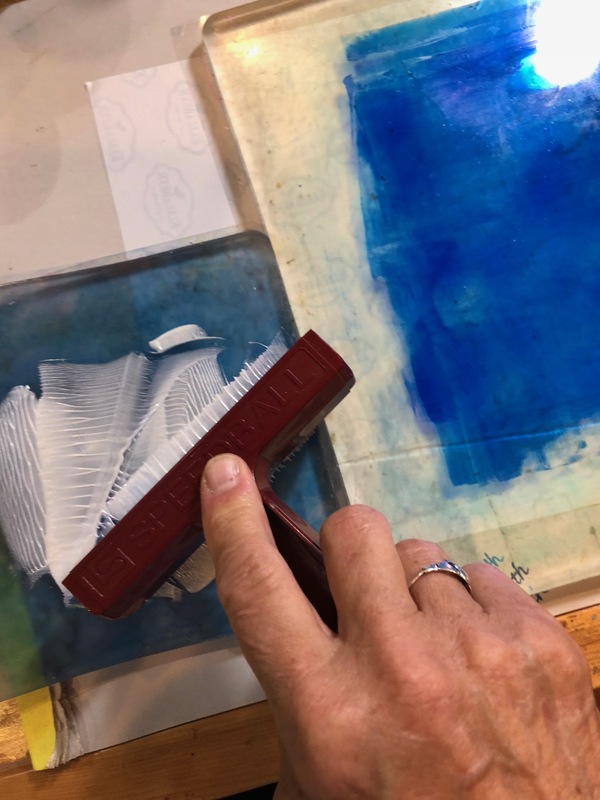 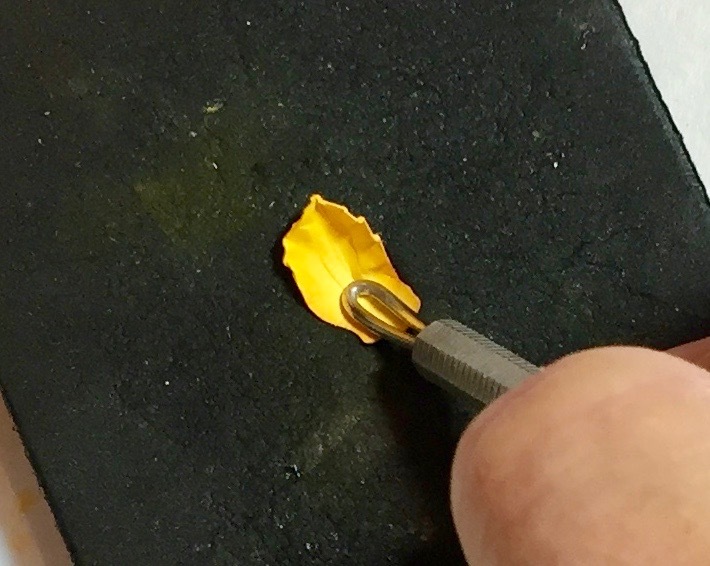 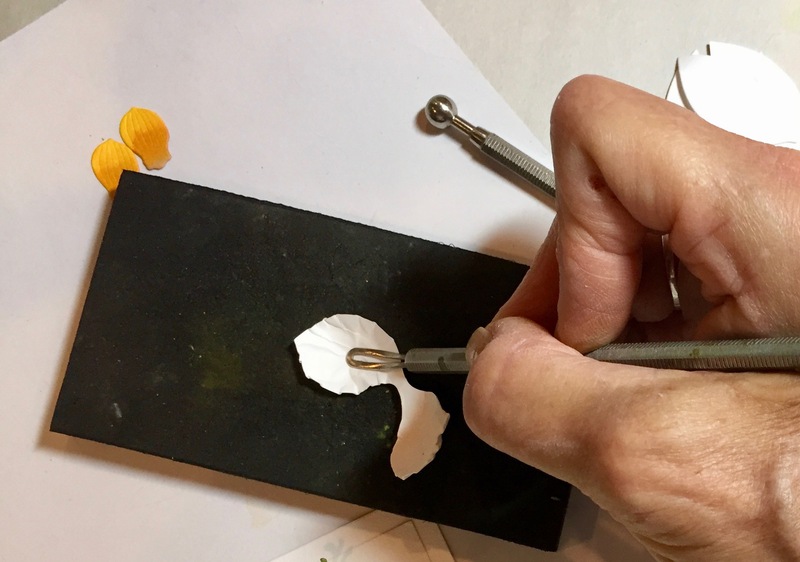 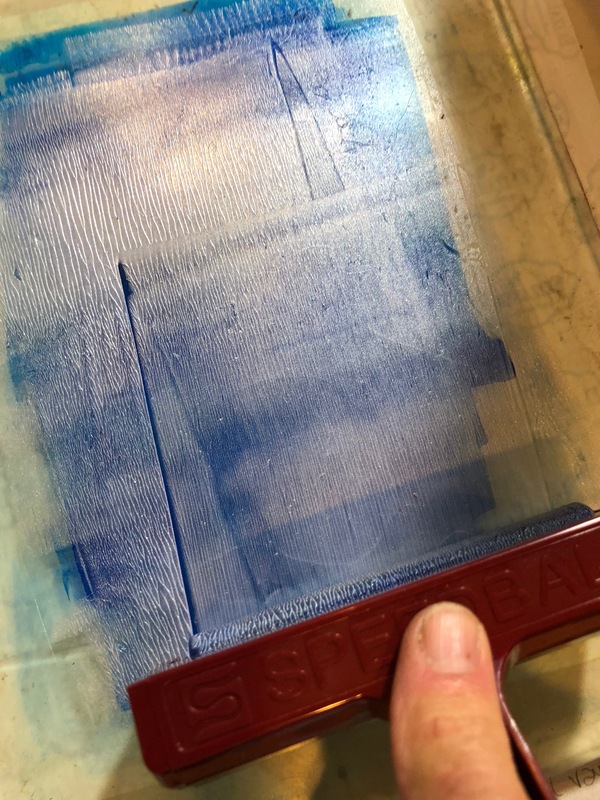 If you want dimension on the outer point of the leaf, simply place the leaf, right-side-down on the Molding Mat and use the medium ball stylus to press and push backward; this will crimp the tip! 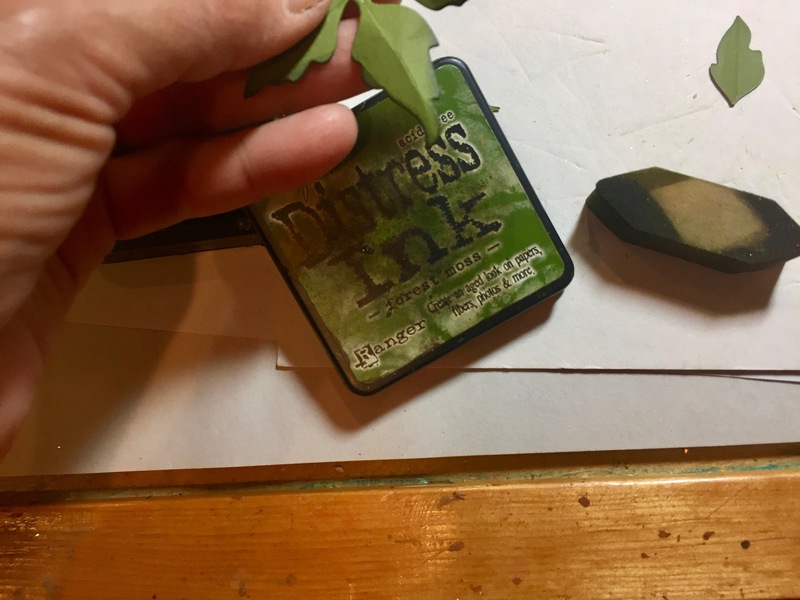 To finish the Tulip, die cut the calyx in a bright green cardstock, matching the number cut to the number of Tulips made. 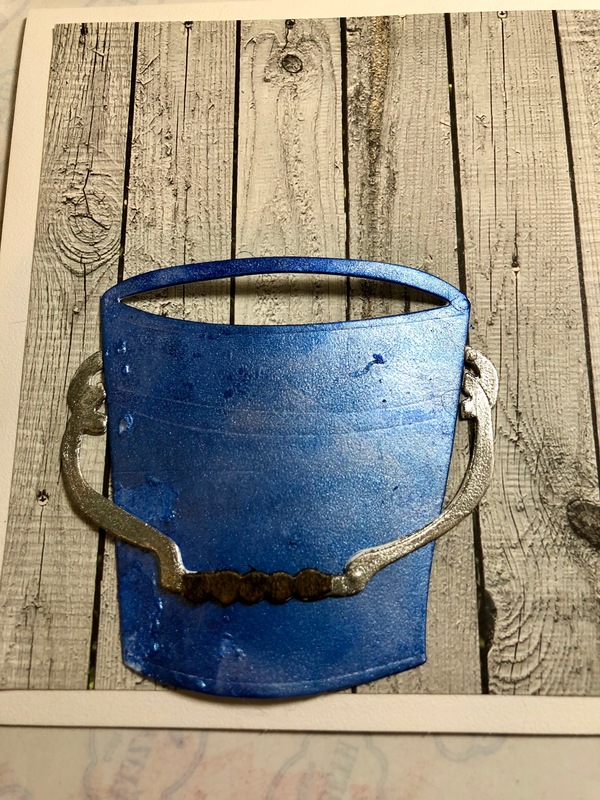 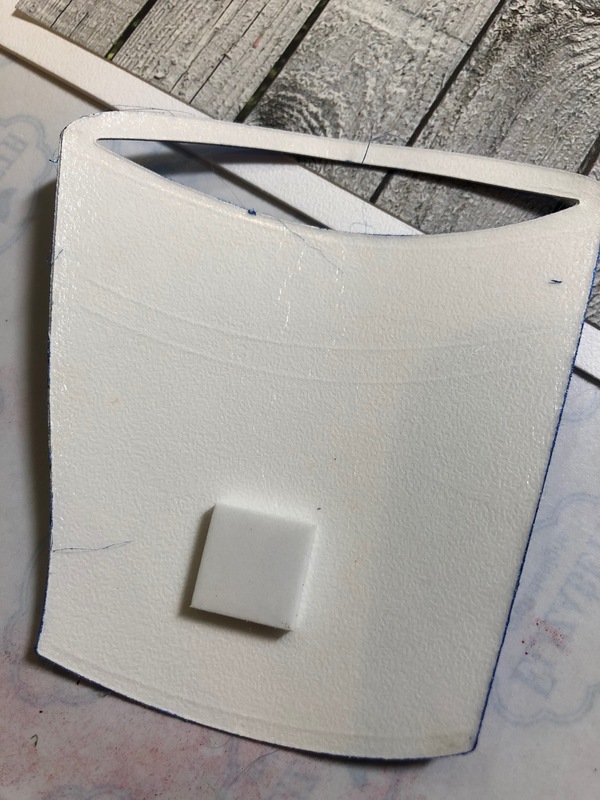 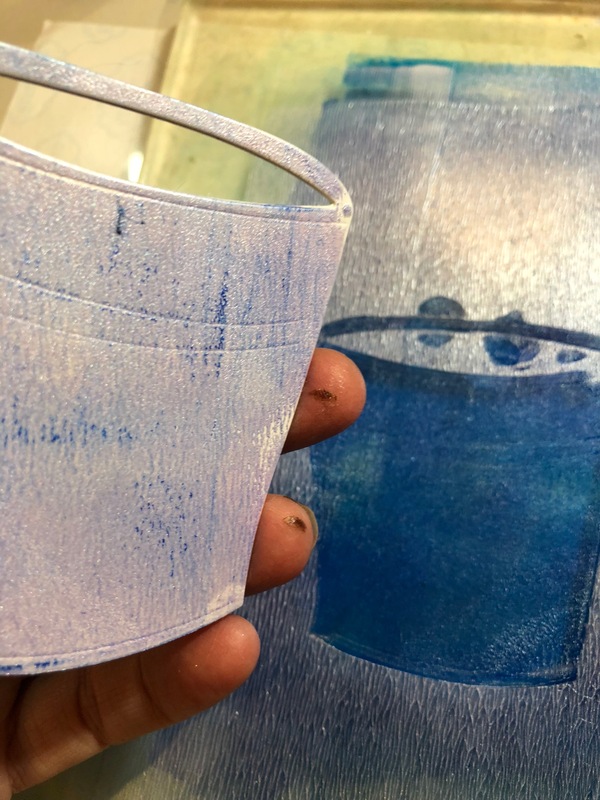 Place this piece on the molding mat and use the small ball stylus to cup this piece. 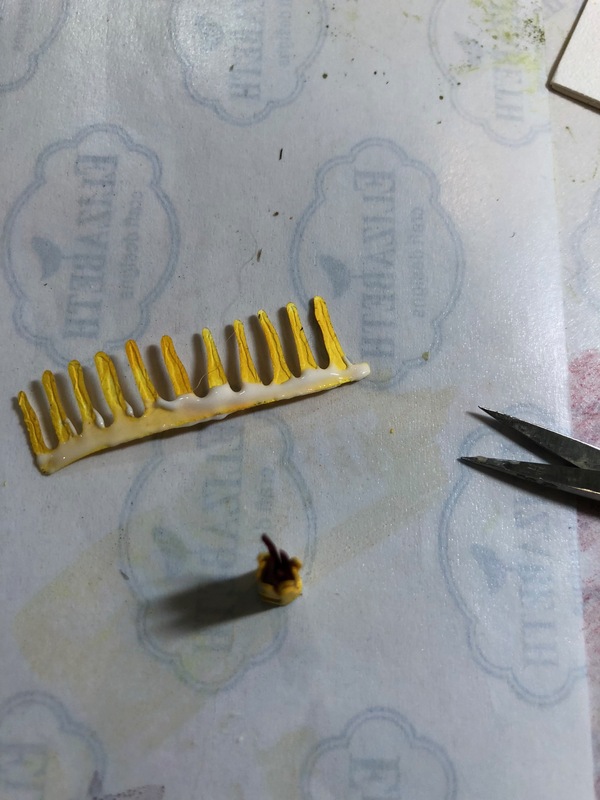 Hold the piece with the tweezers and use a toothpick to apply a small amount of glue to the center of the underneath. 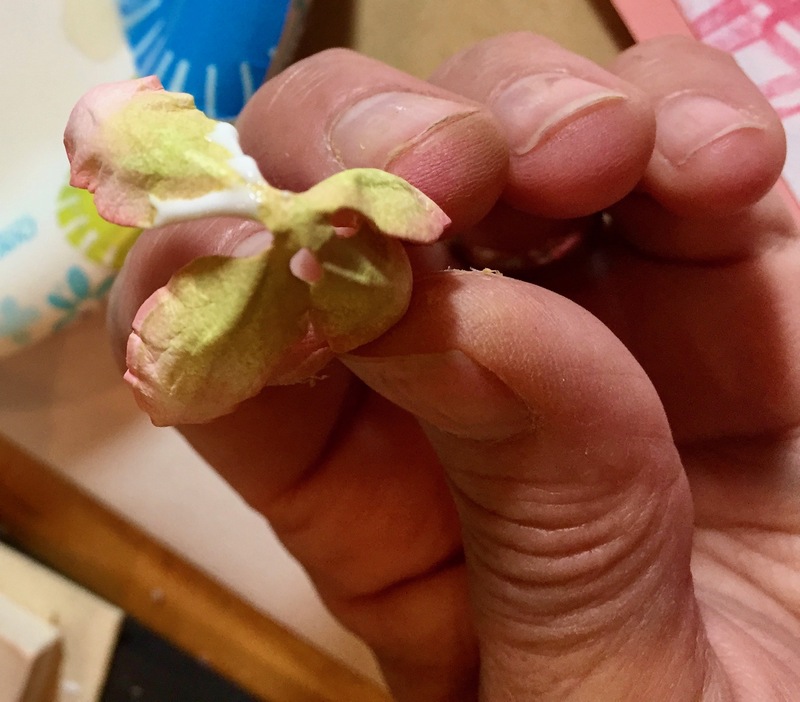 Glue in place inside the Tulip. 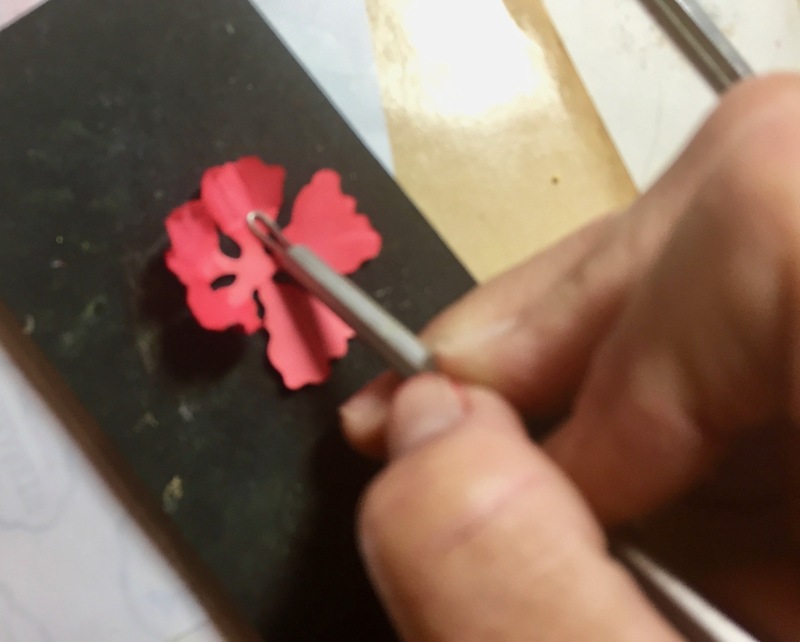 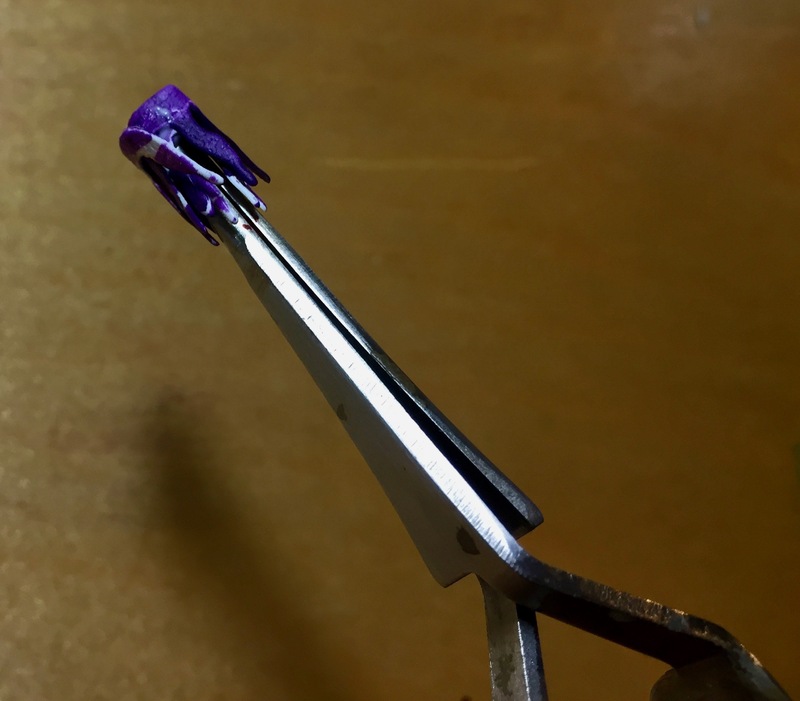 For the stamen, hold the piece with the tweezers and apply a small amount of glue along the straight edge, then roll the piece up and secure. 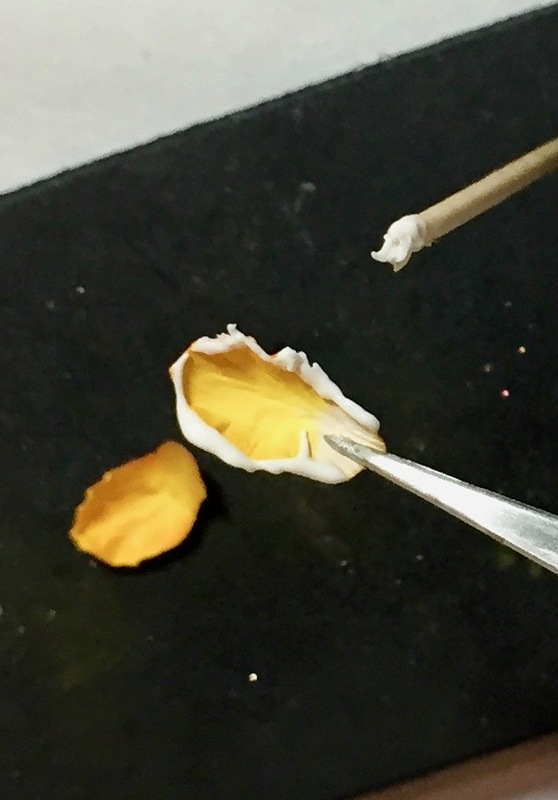 Dip the ends lightly into the glue, then into Pollen. 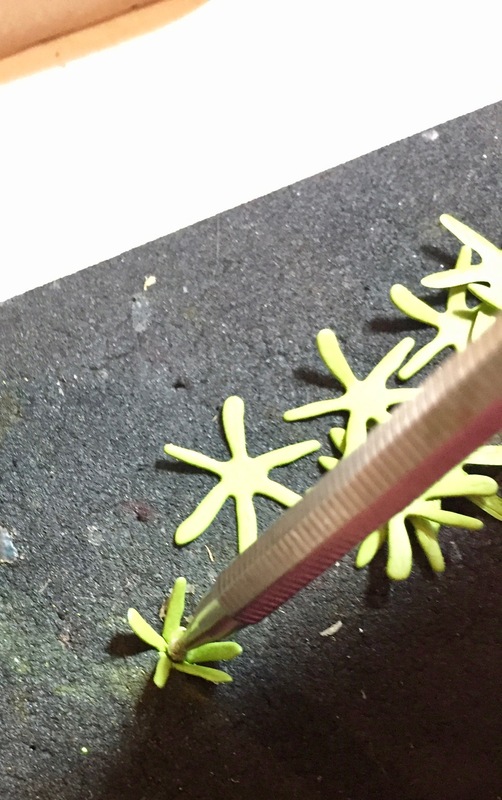 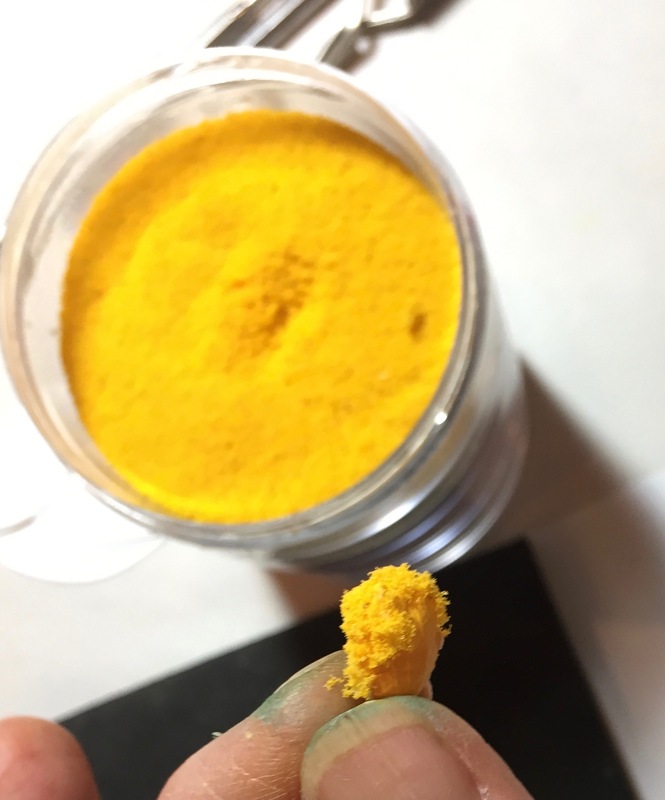 Hold the Pollen end with the tweezers and dip the bottom into the glue and set in place on top of the calyx. 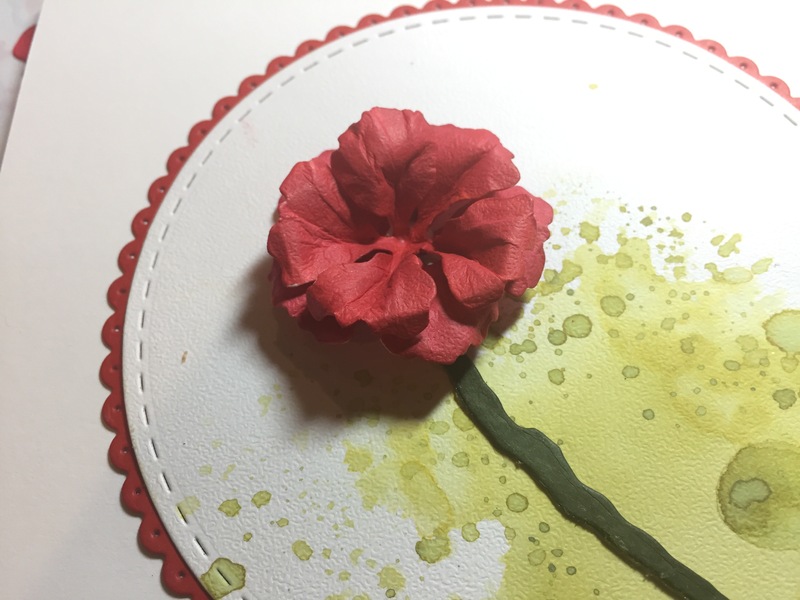 The Tulip is done!